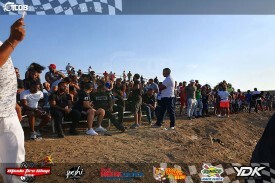 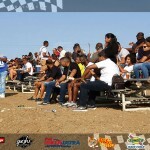 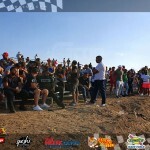 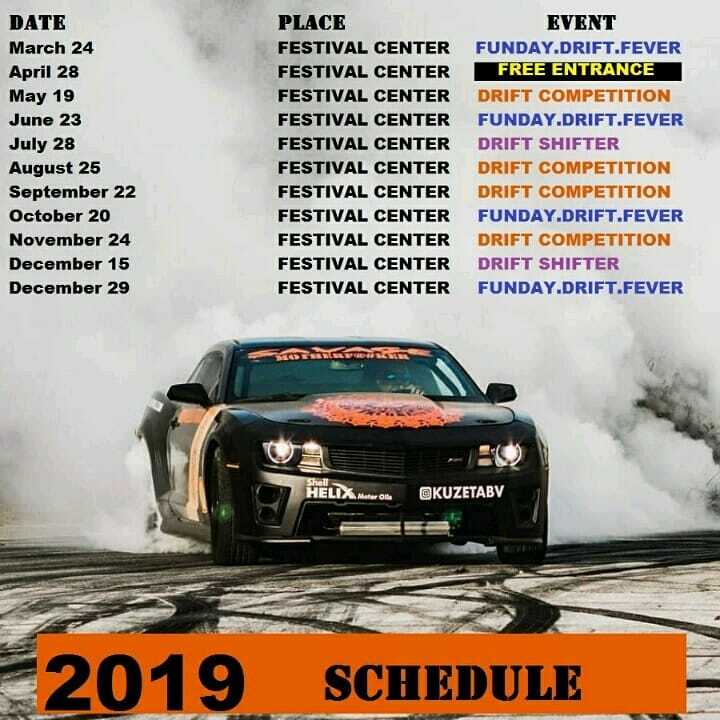 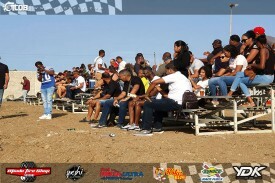 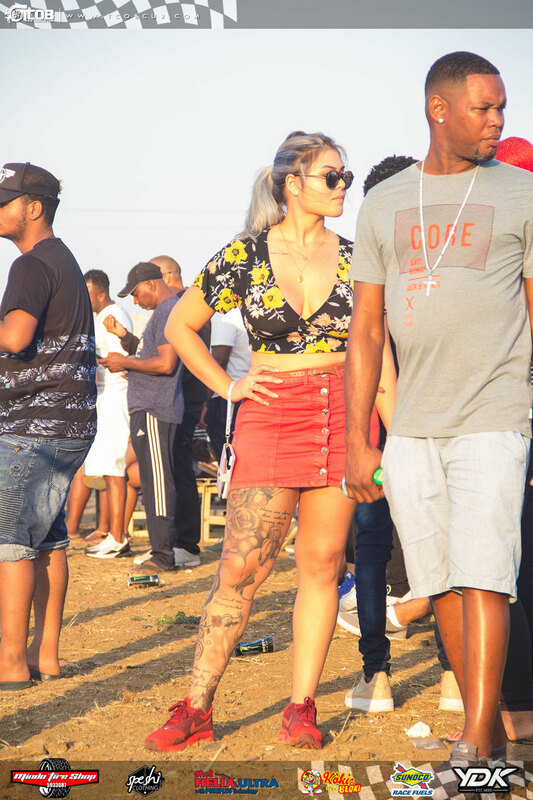 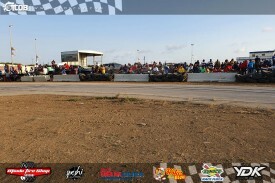 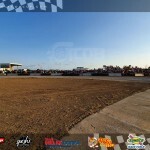 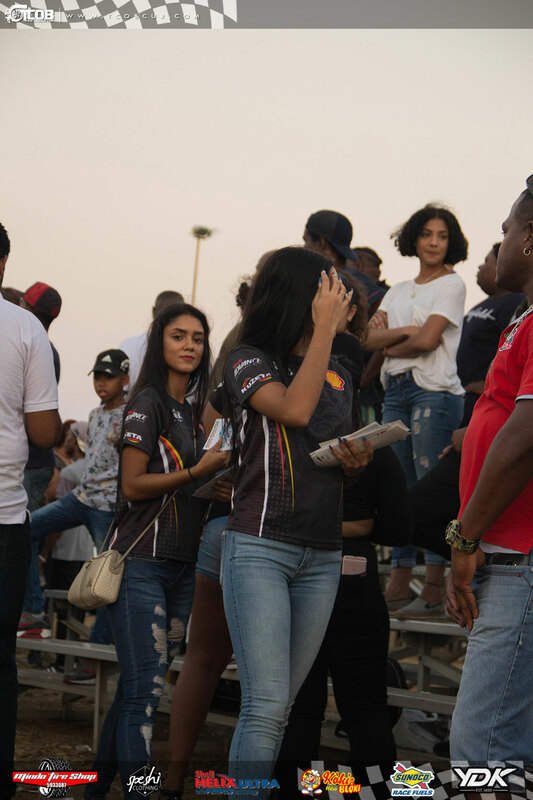 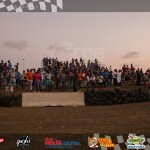 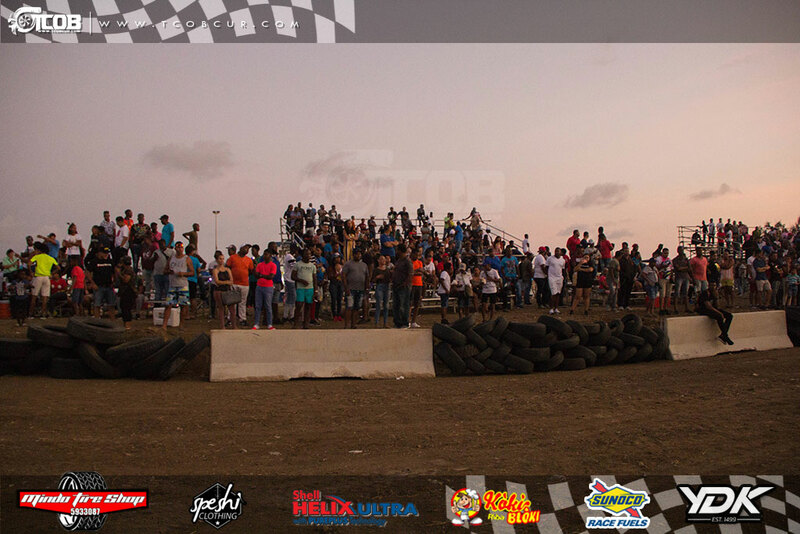 The first SUNDAY FUNDAY of 2019 went down in a lot of smoke and with many people in attendance to watch the show. 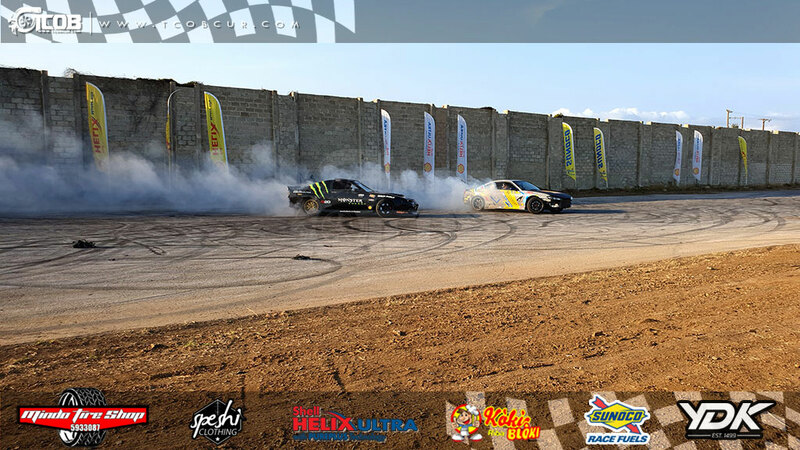 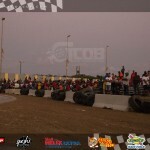 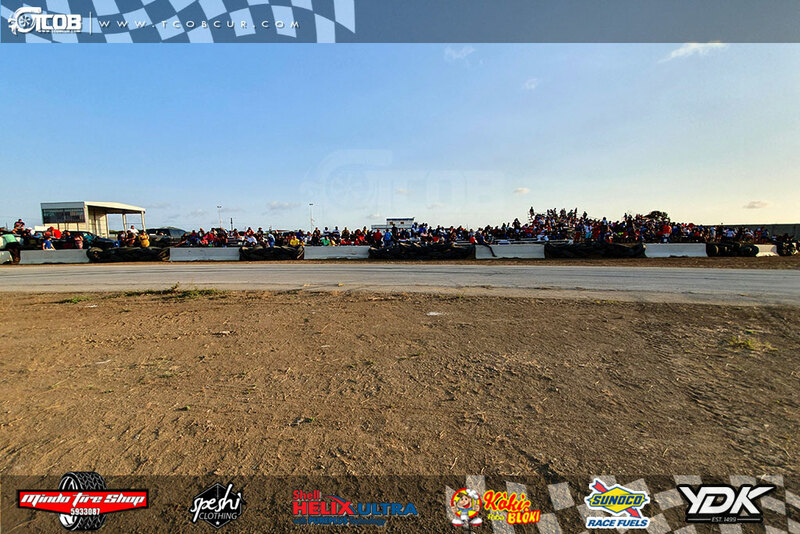 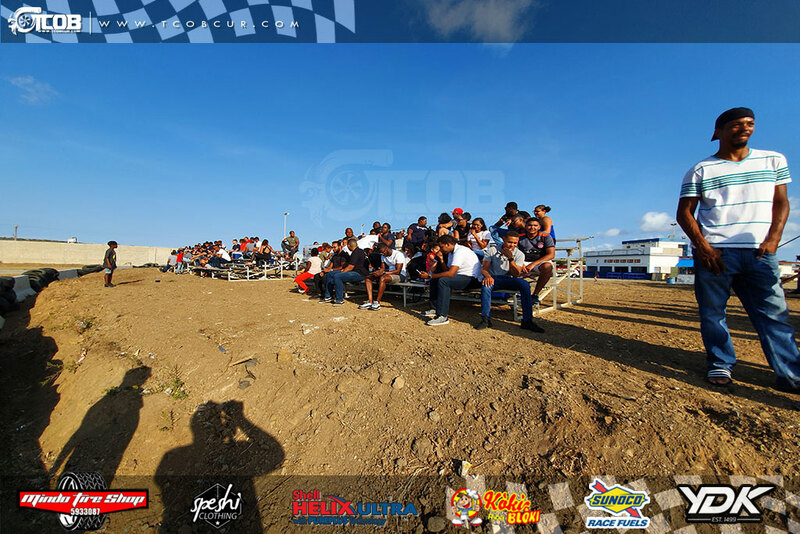 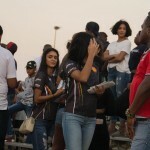 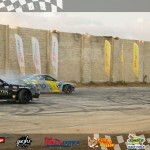 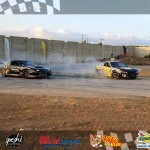 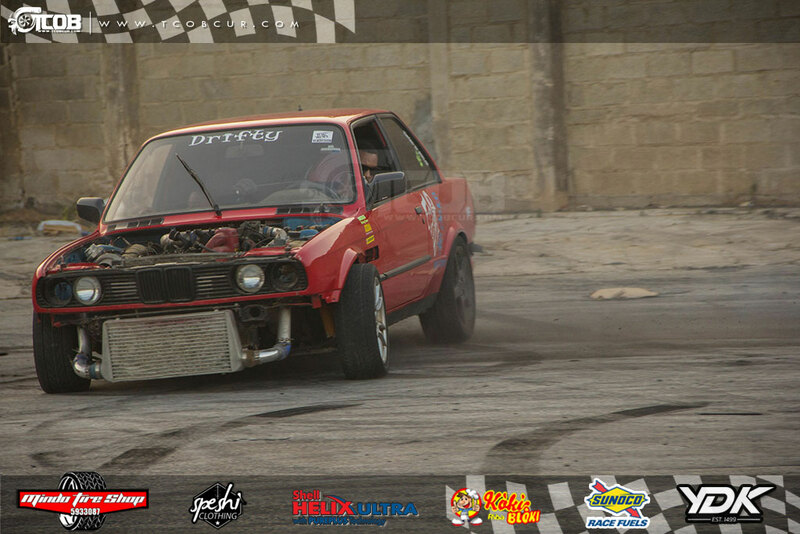 After a long time without any event for our motorsport lovers, this fun day was a relief. 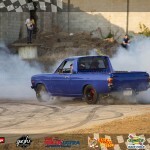 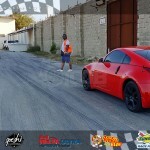 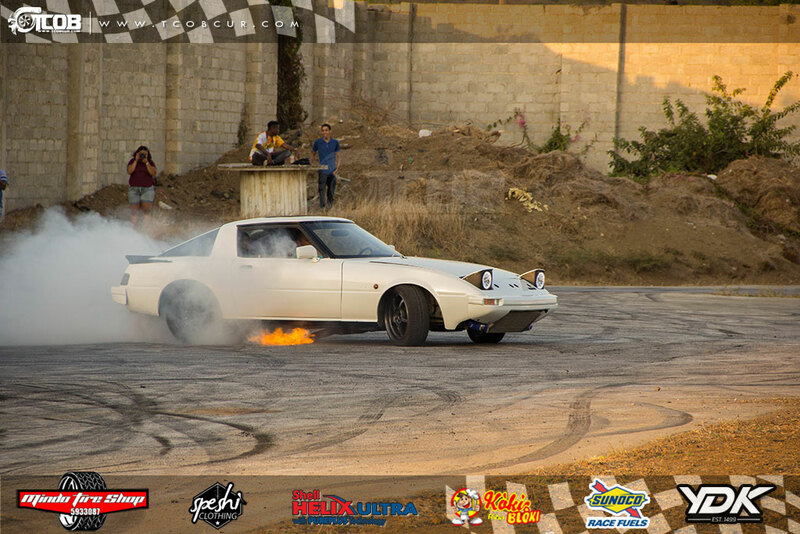 It was notably so, because there were people who came out with there drag cars and different other projects, just to HOON and burn some well deserved rubber. 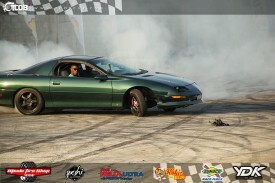 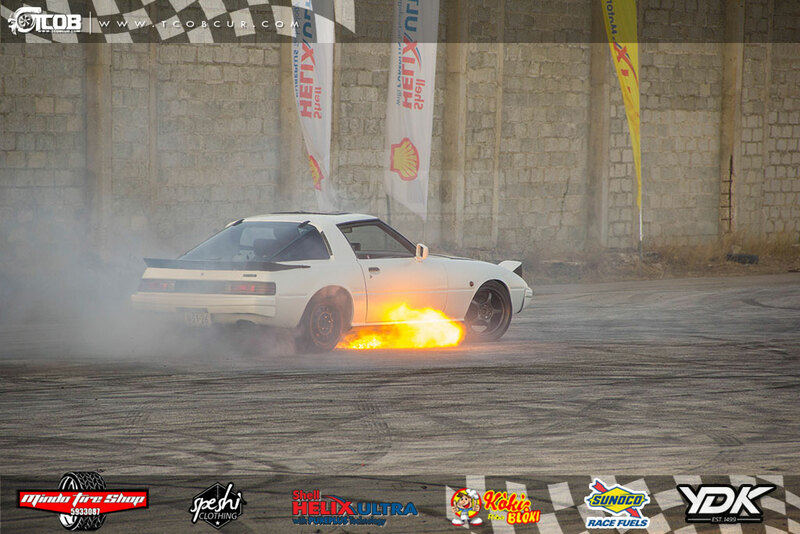 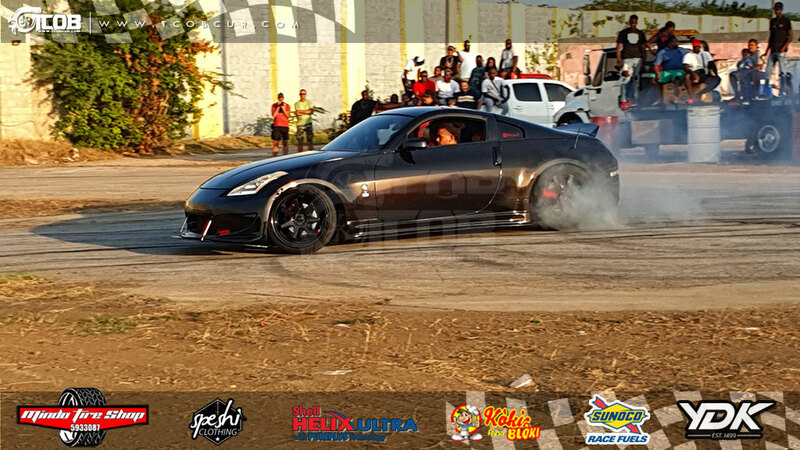 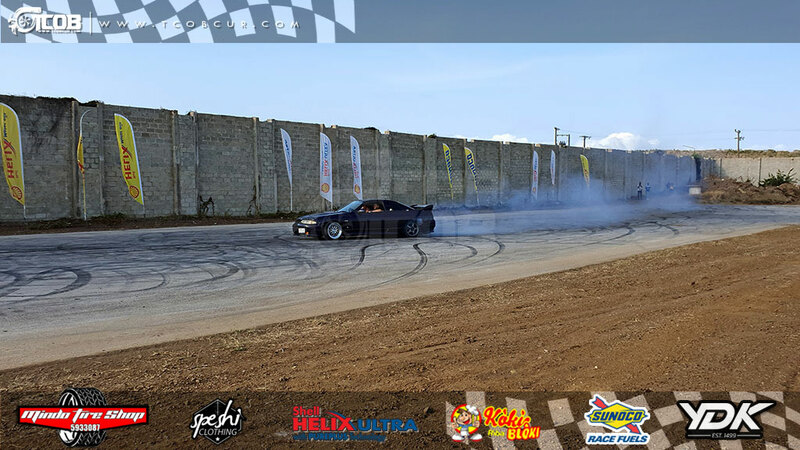 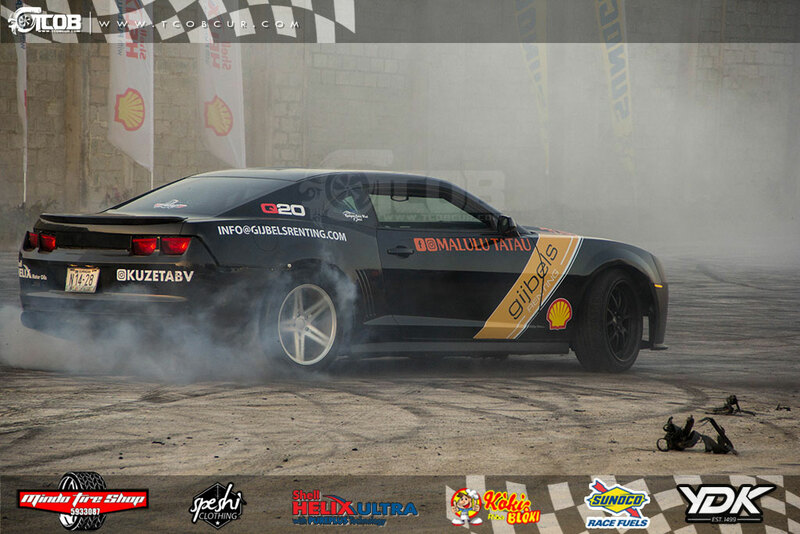 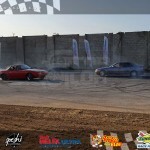 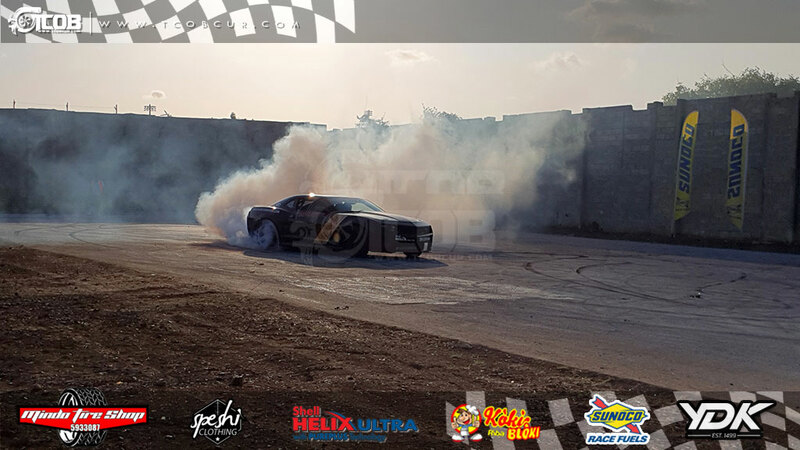 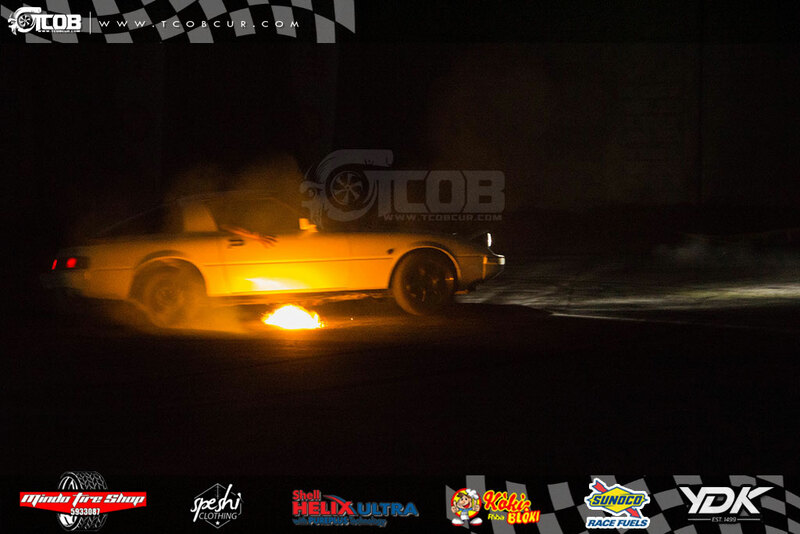 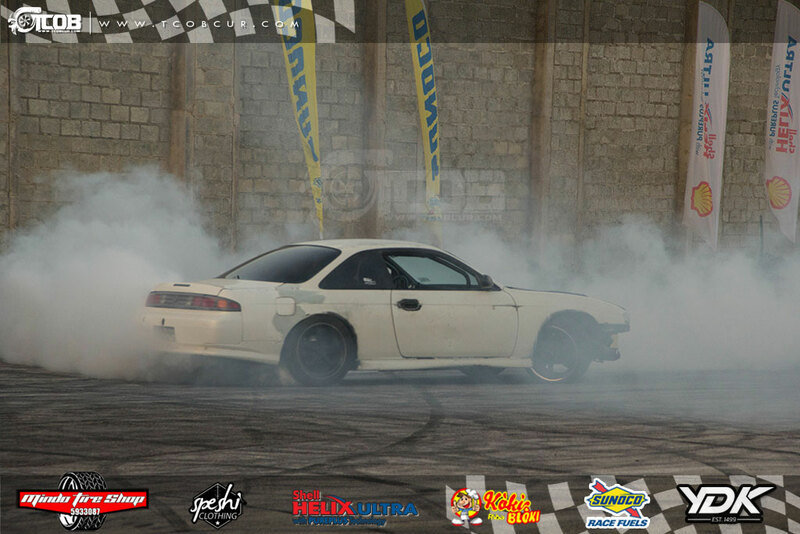 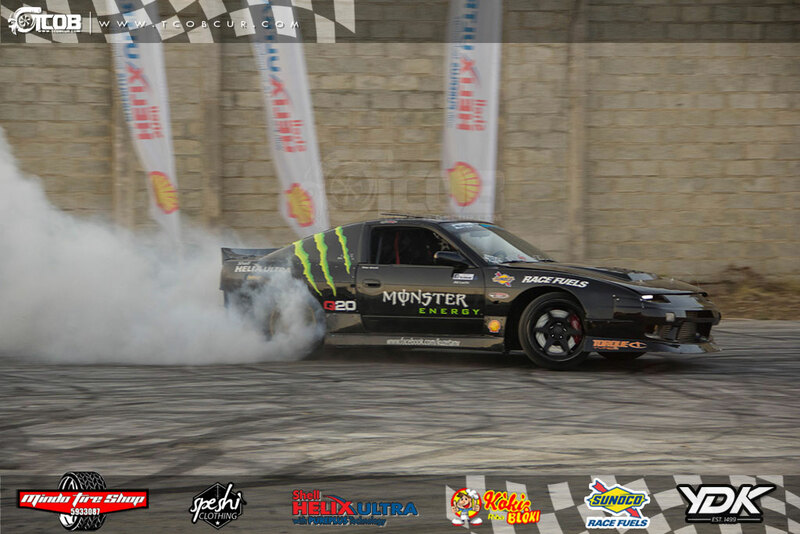 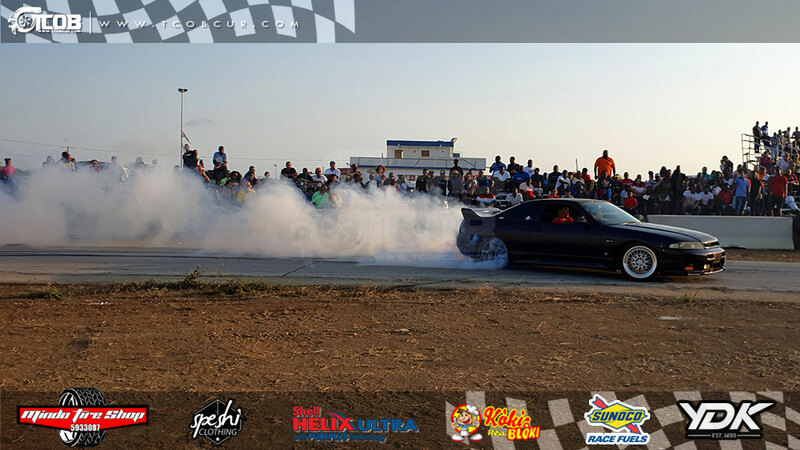 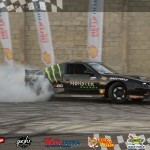 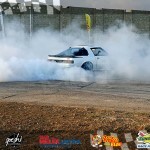 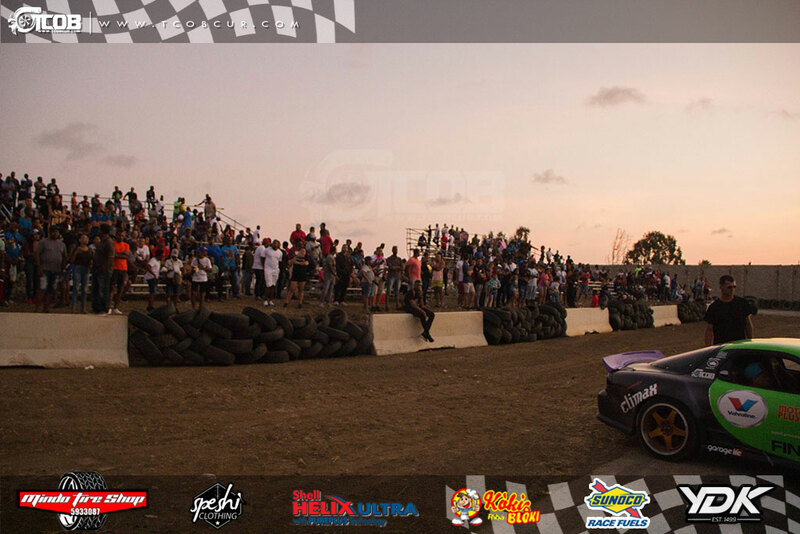 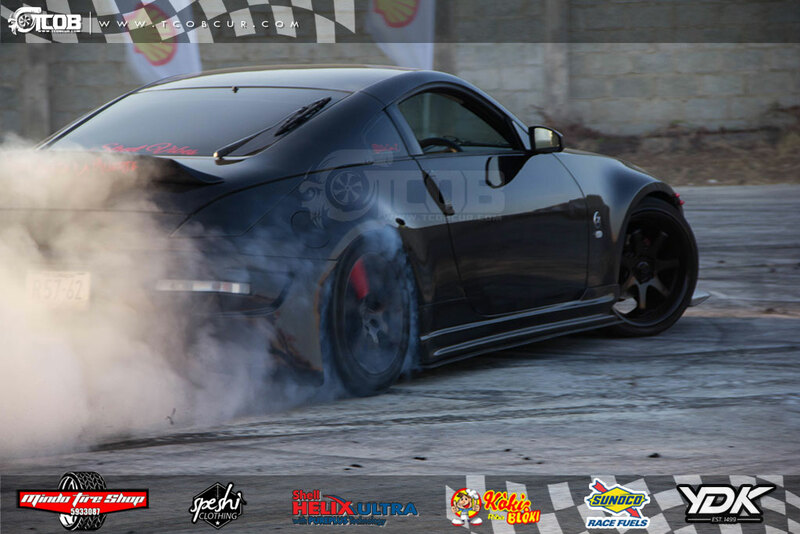 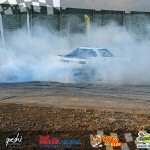 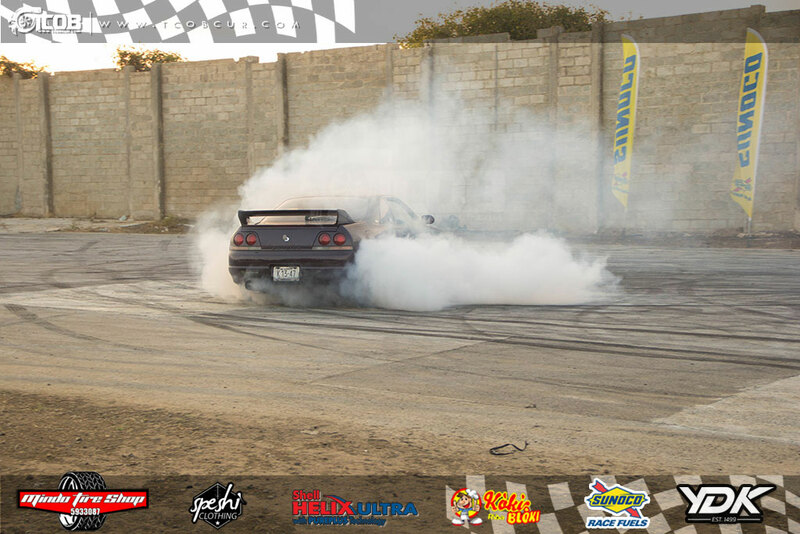 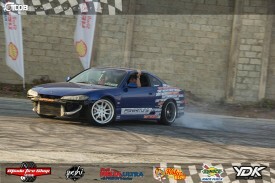 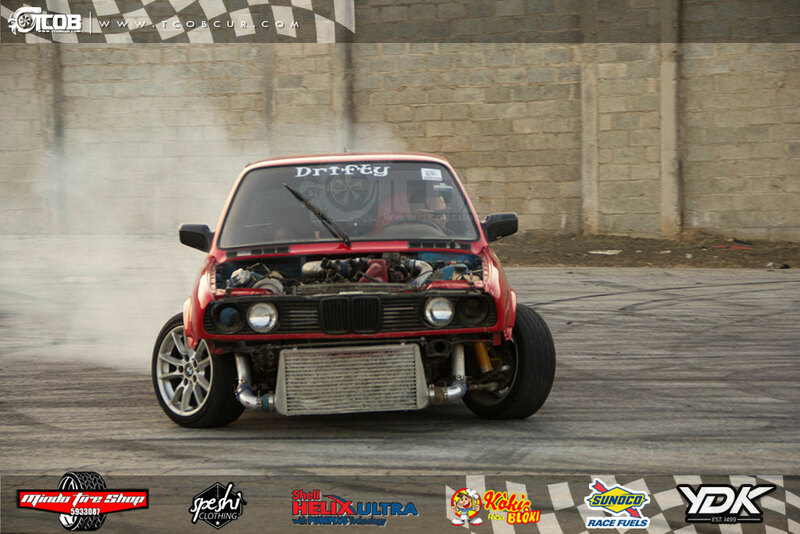 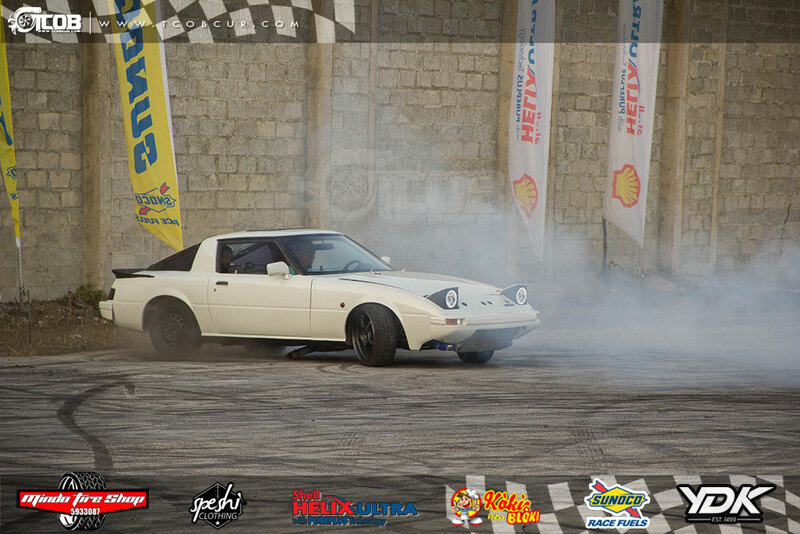 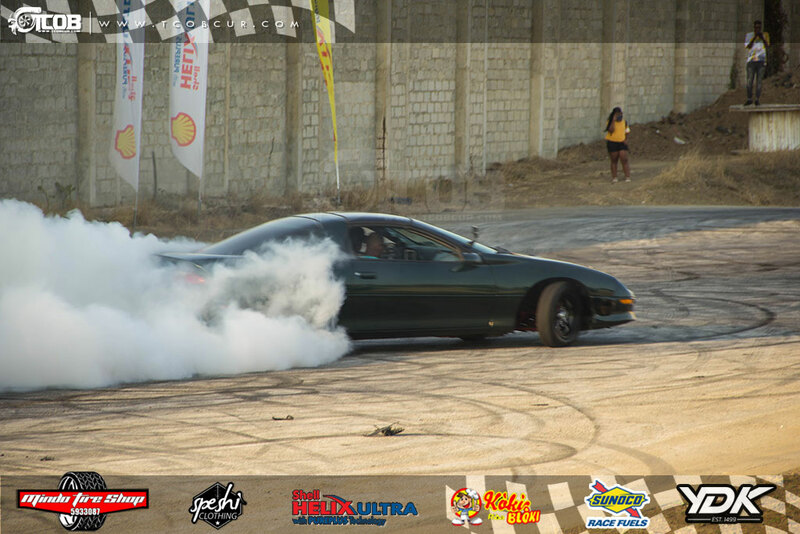 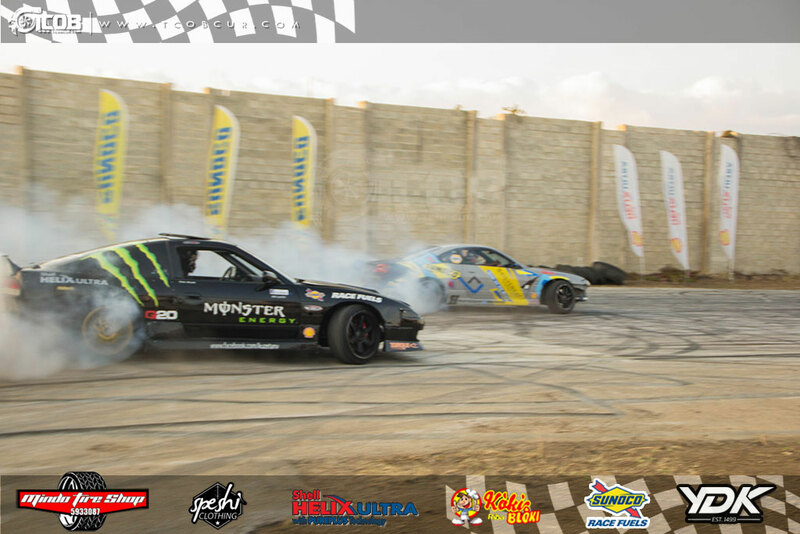 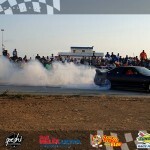 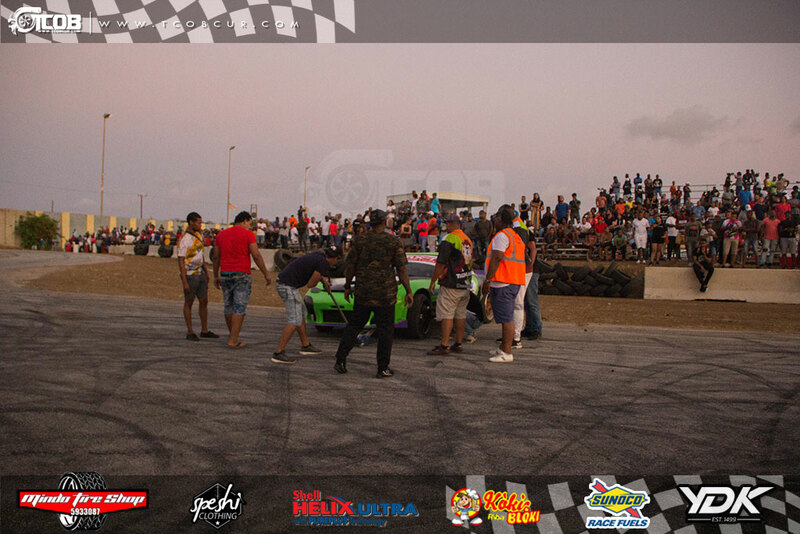 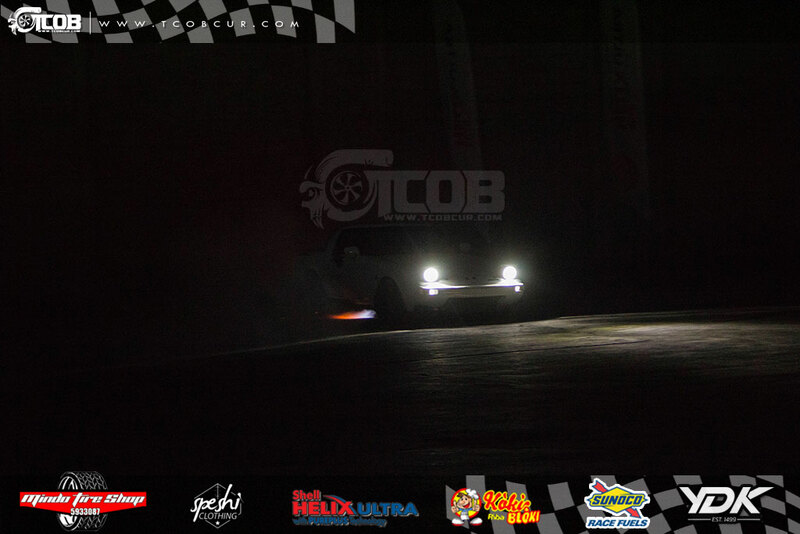 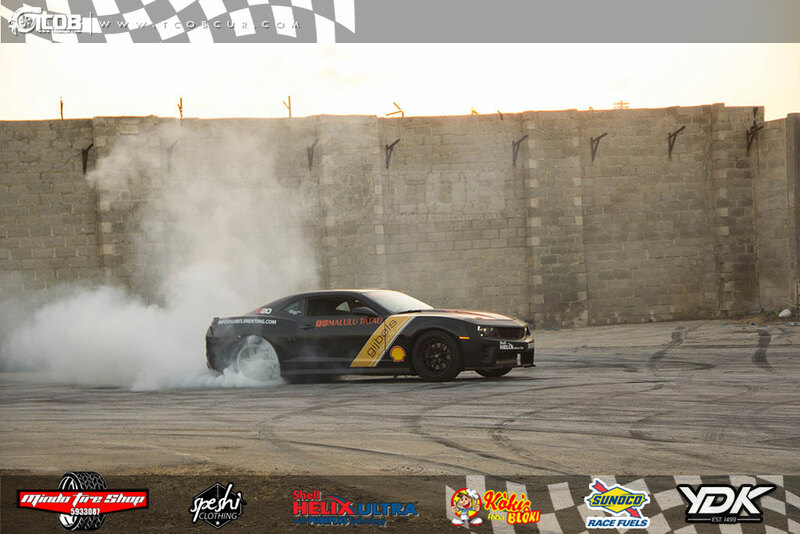 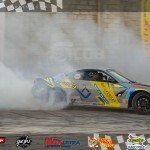 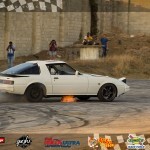 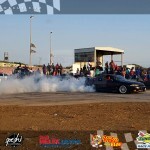 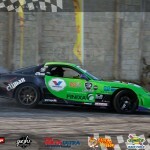 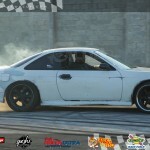 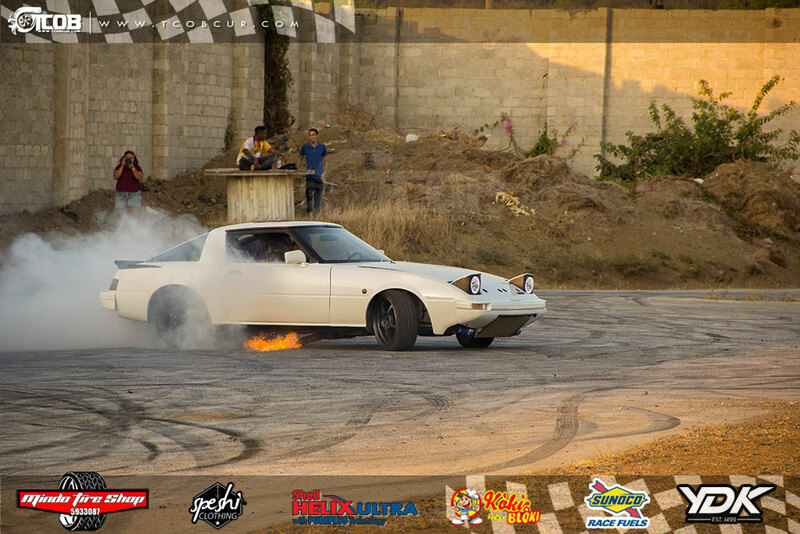 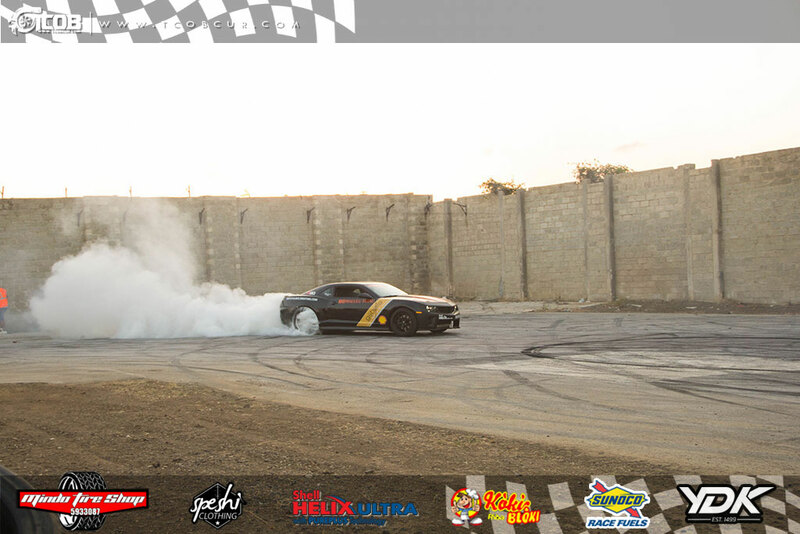 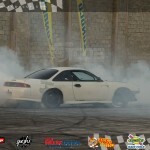 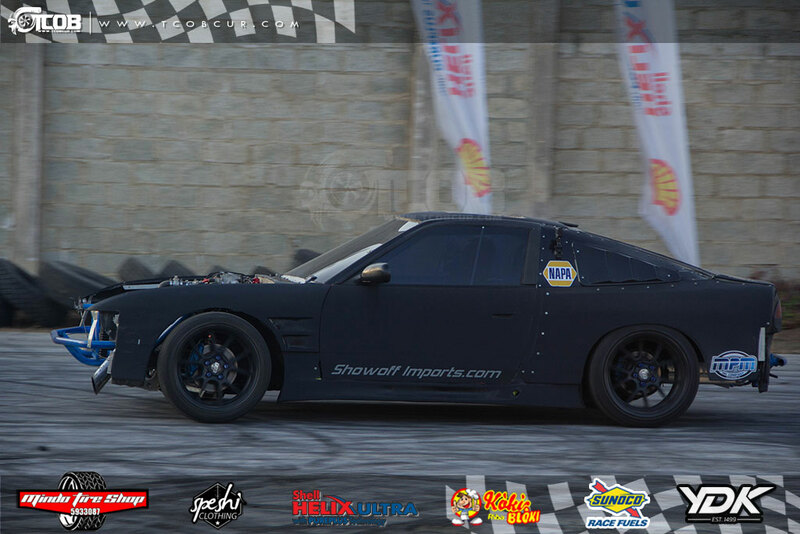 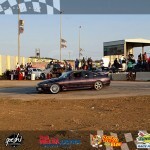 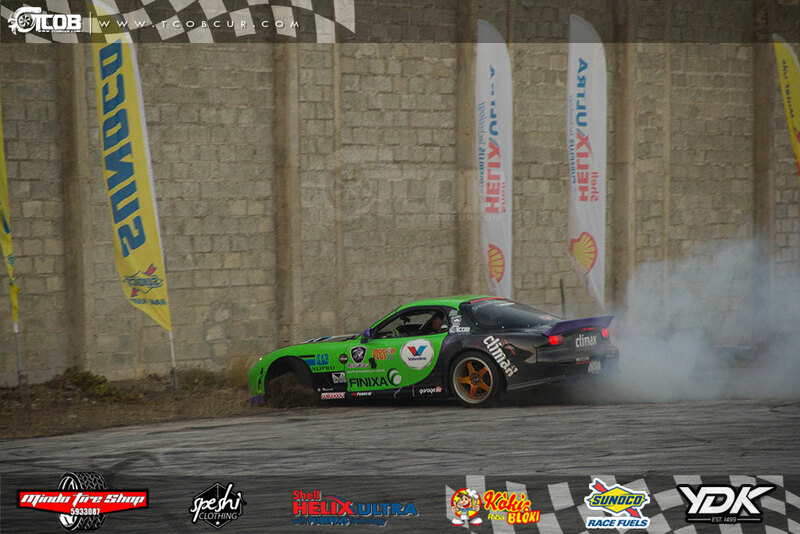 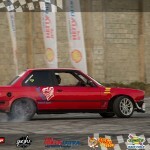 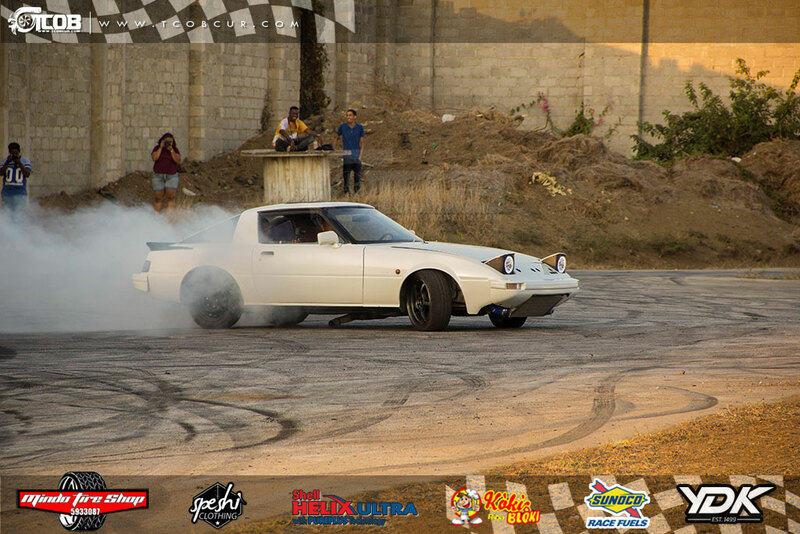 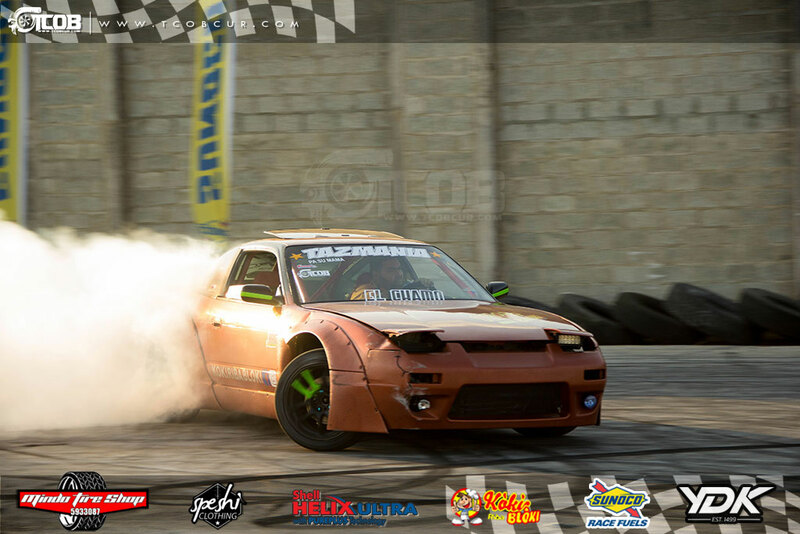 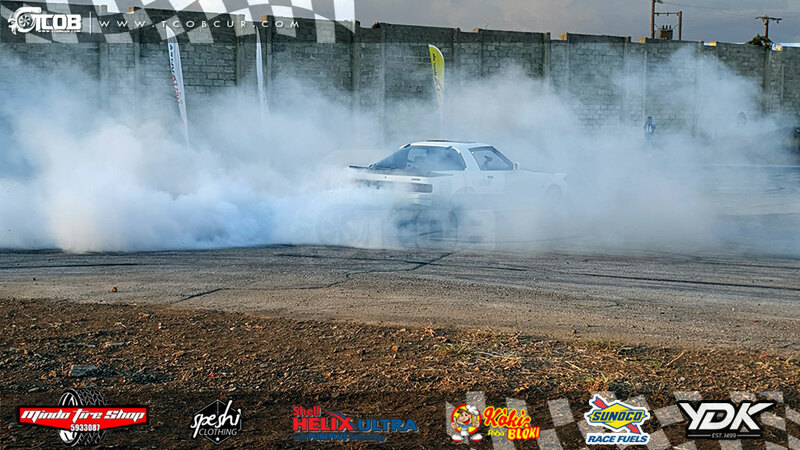 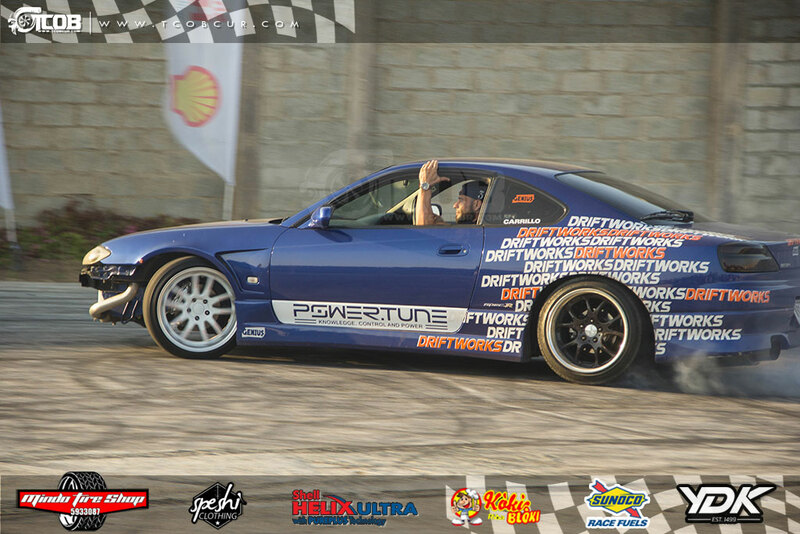 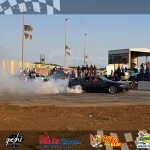 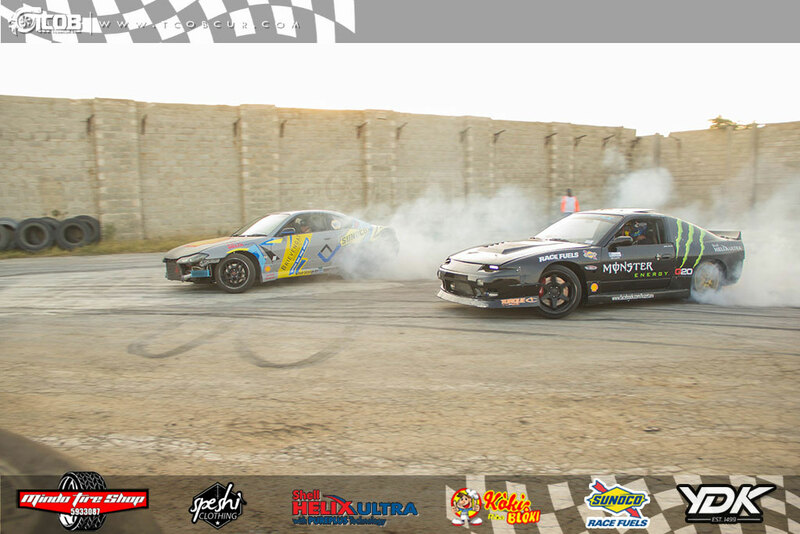 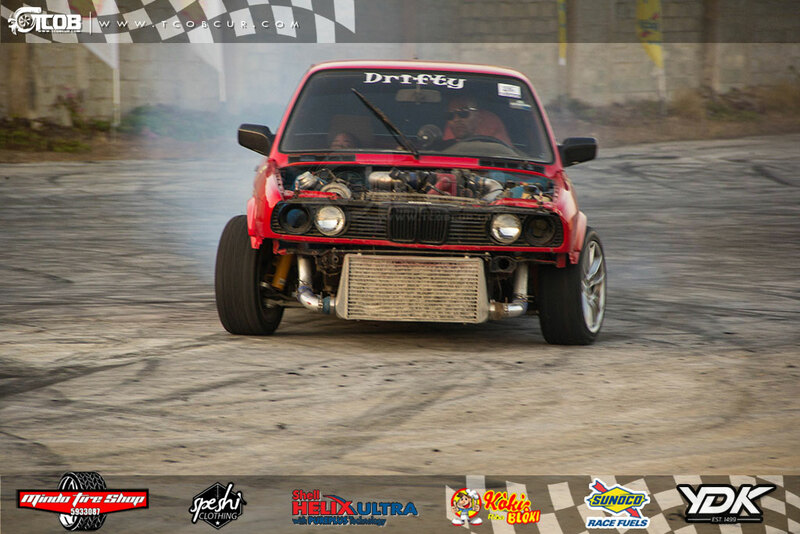 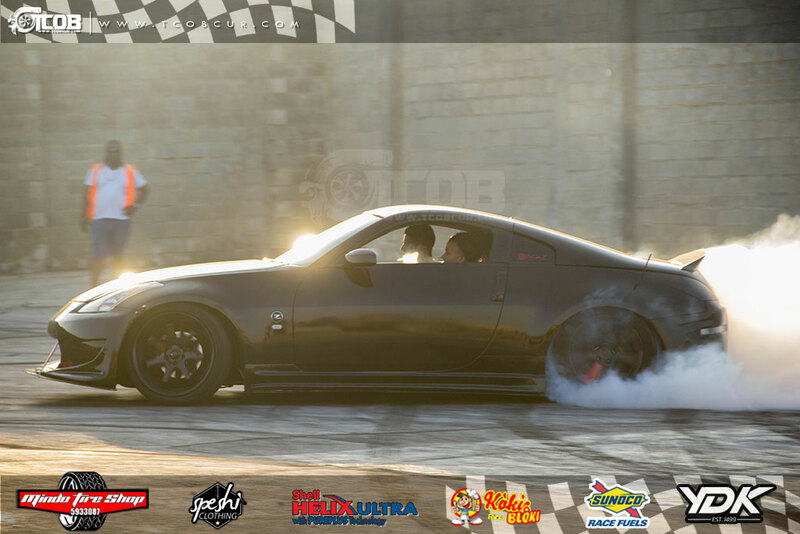 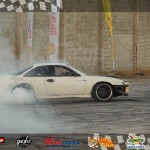 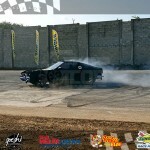 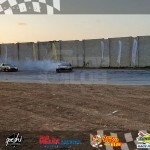 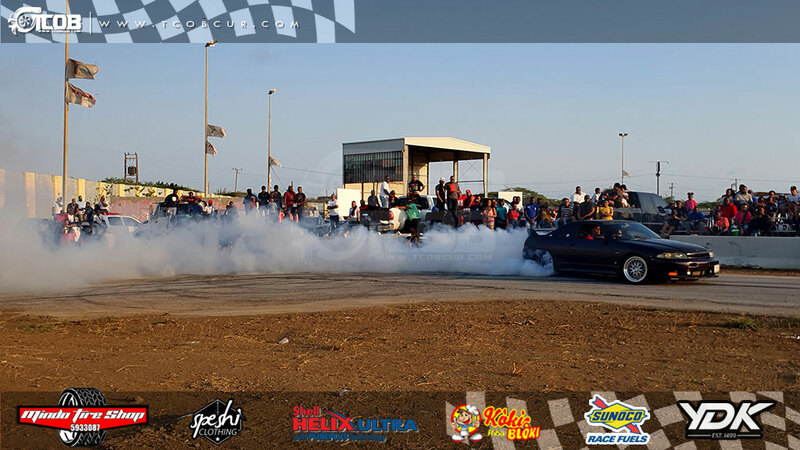 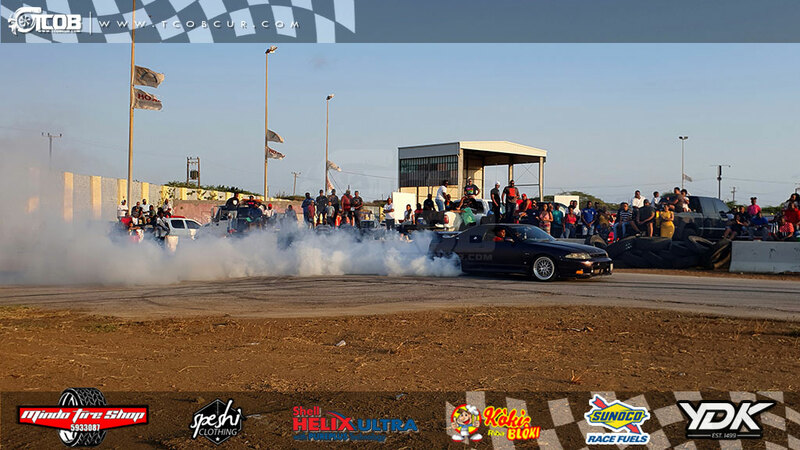 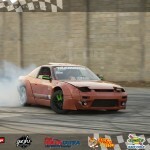 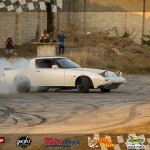 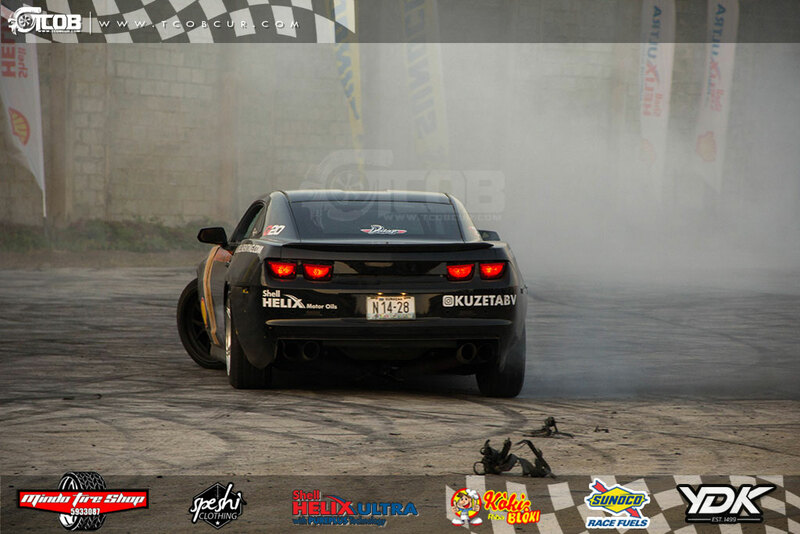 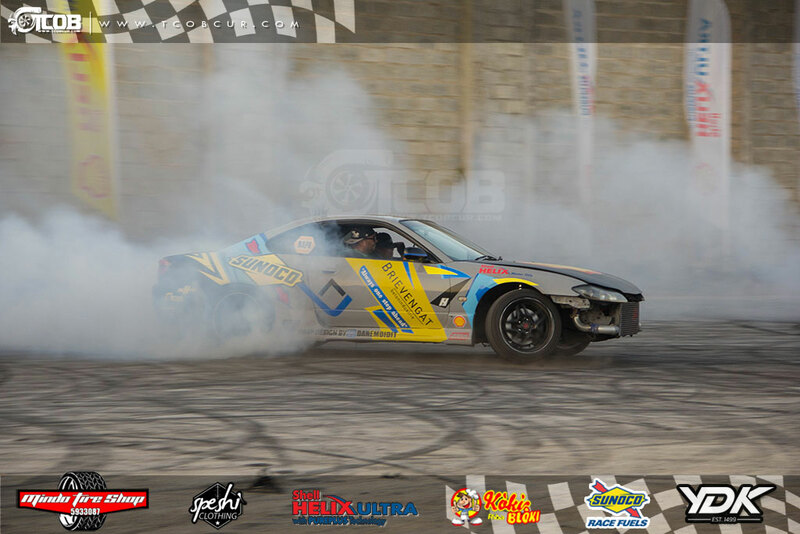 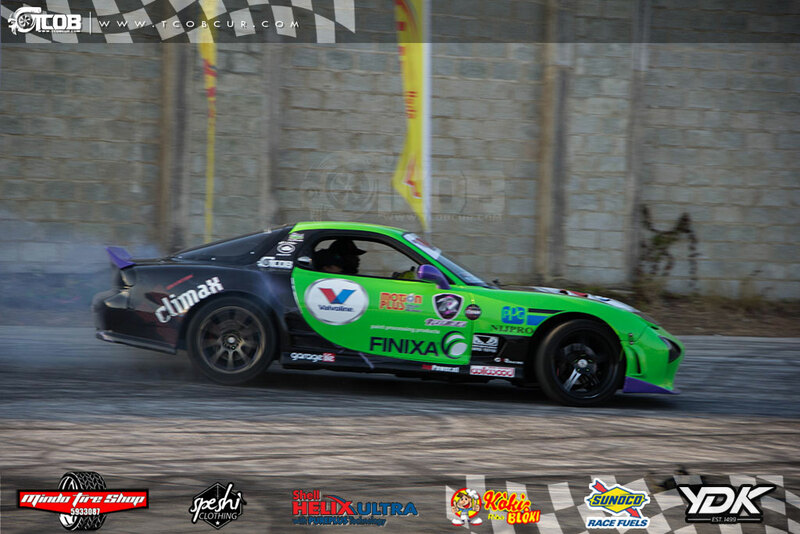 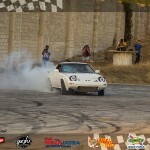 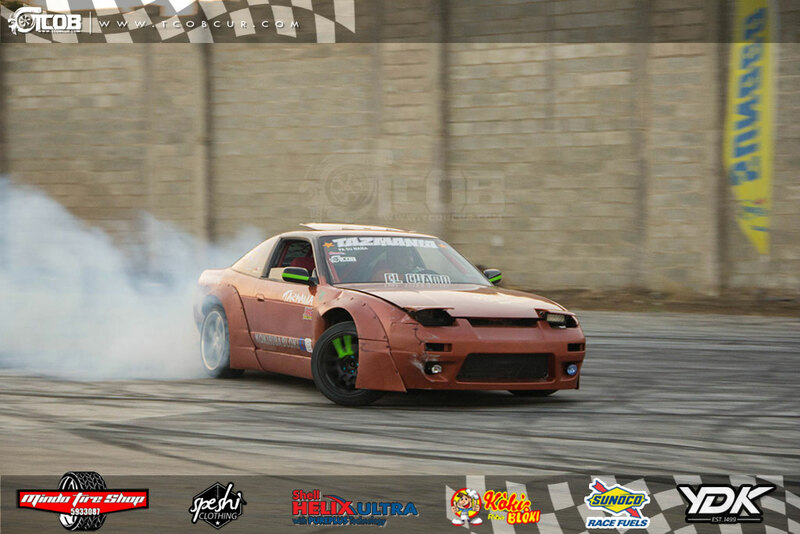 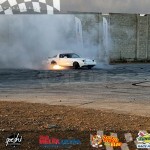 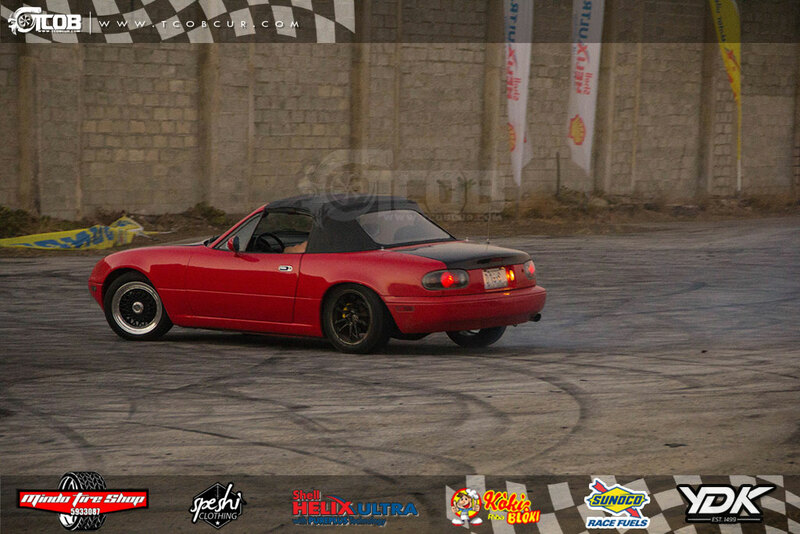 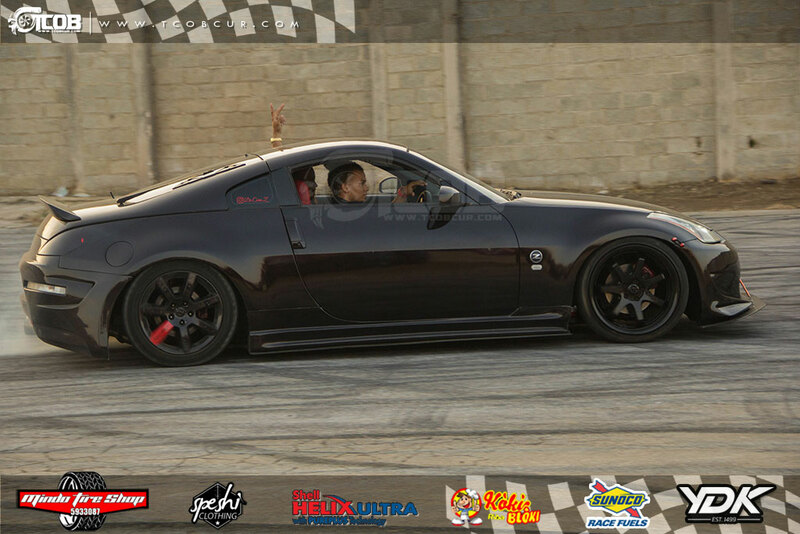 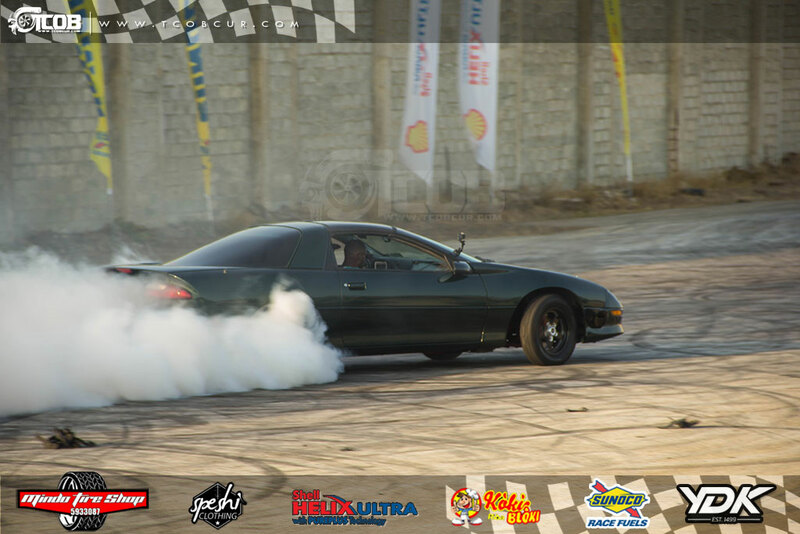 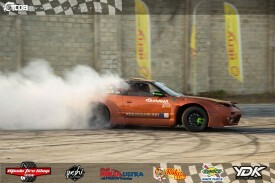 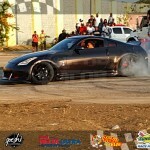 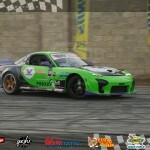 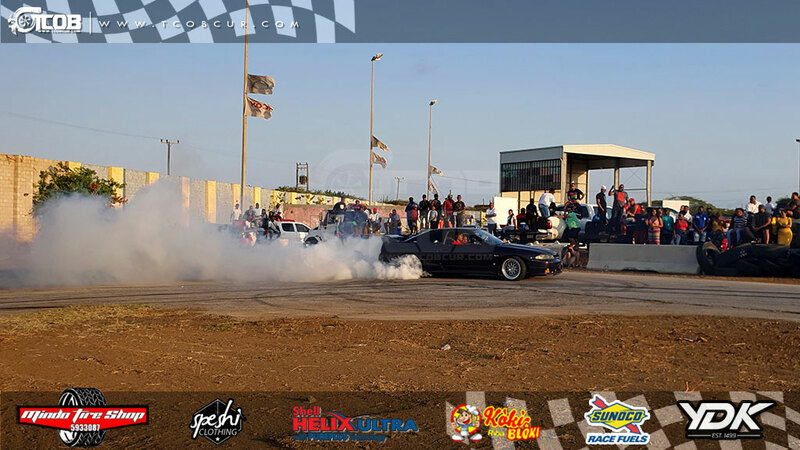 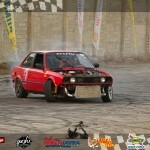 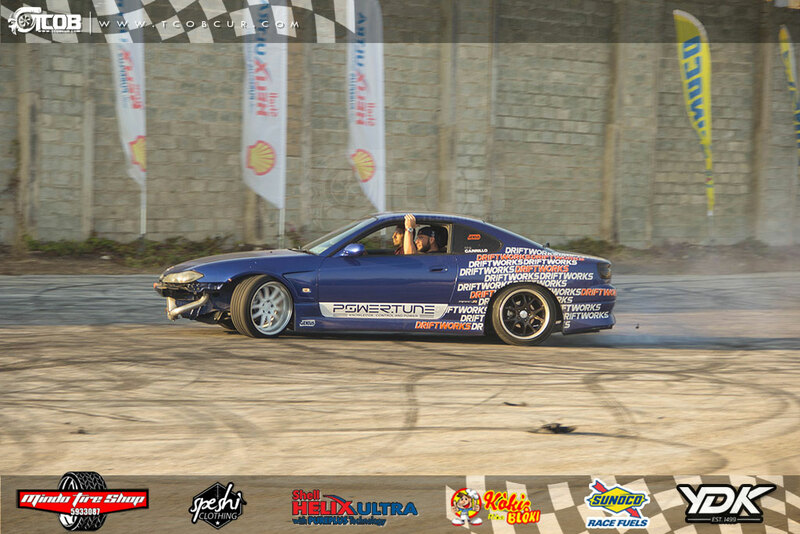 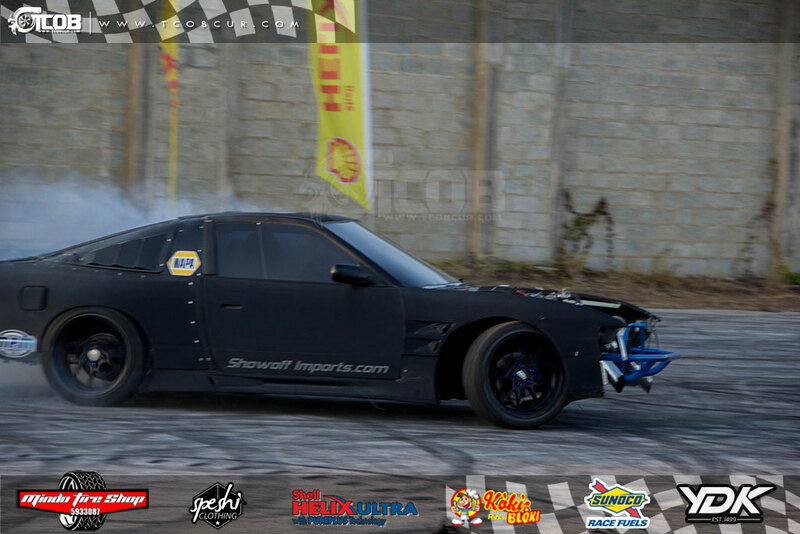 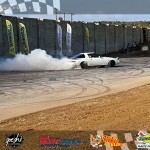 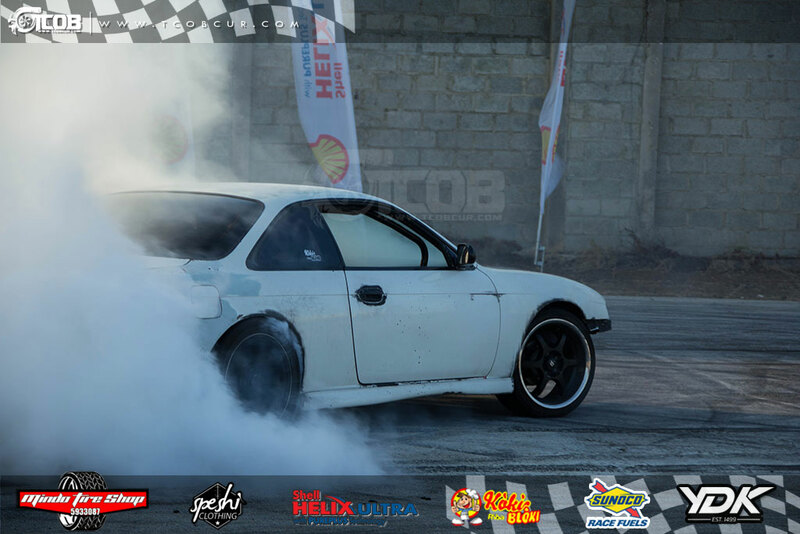 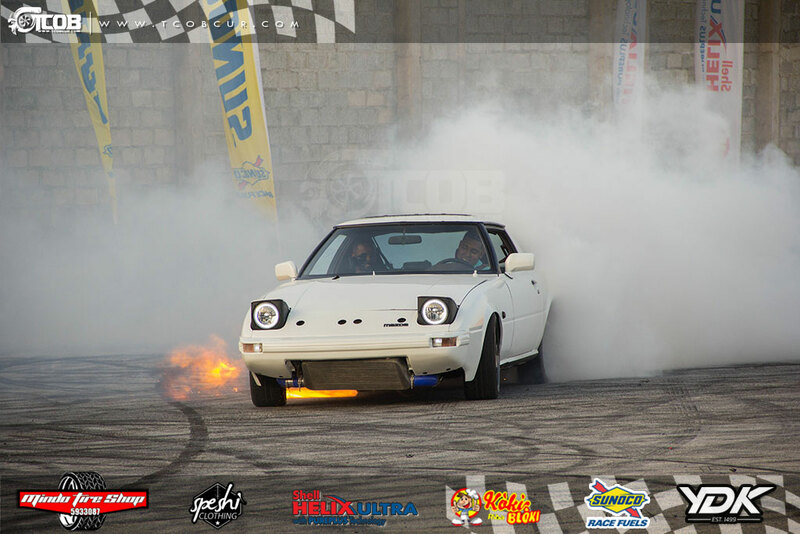 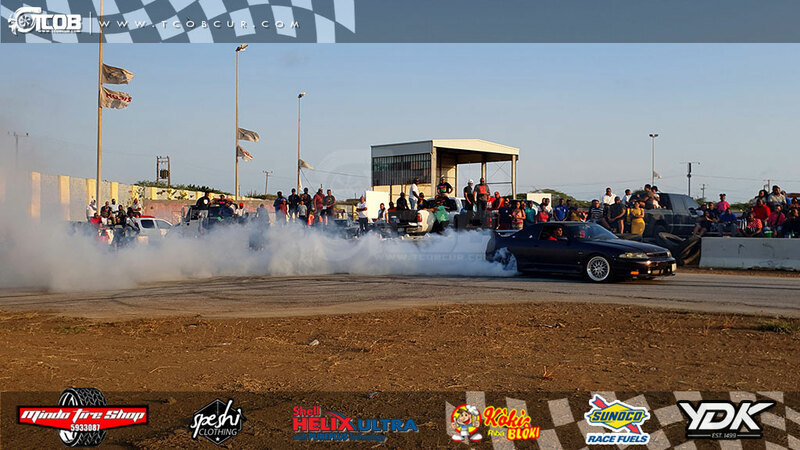 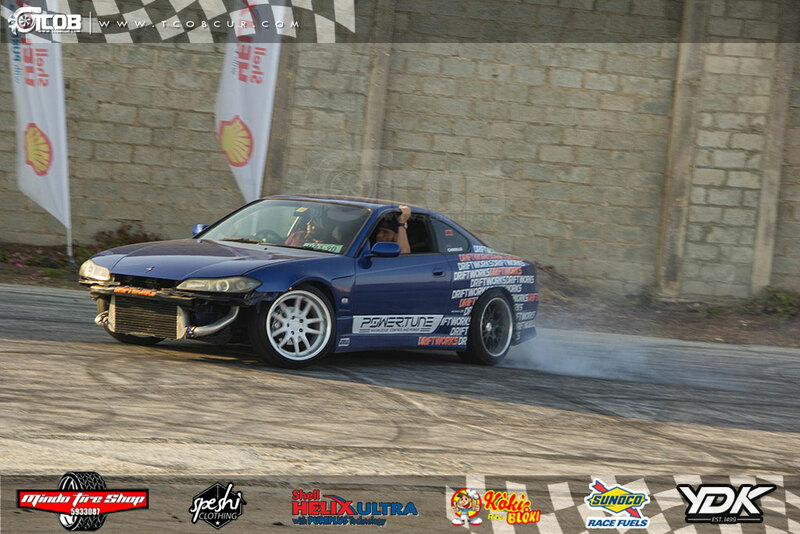 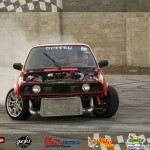 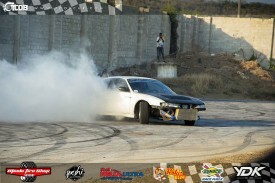 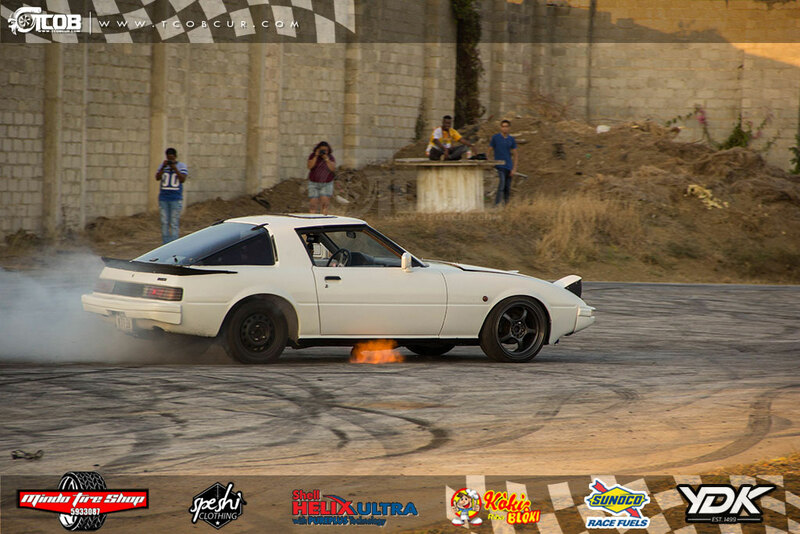 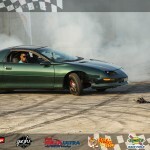 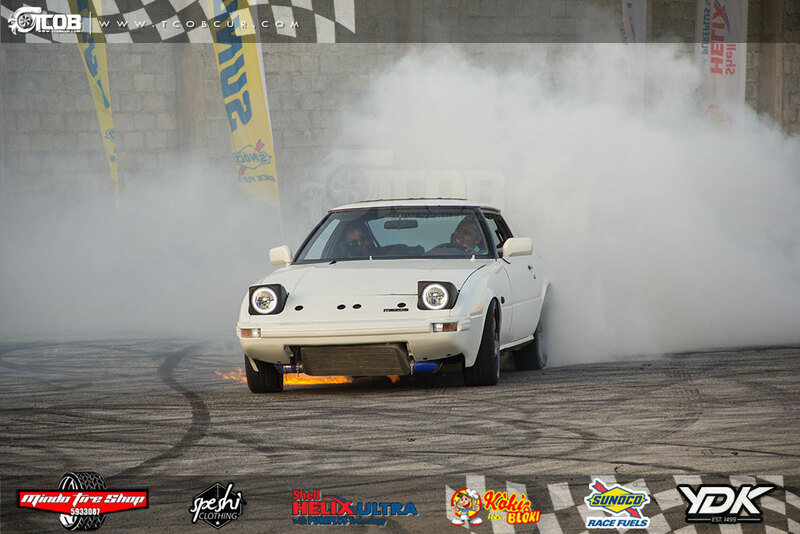 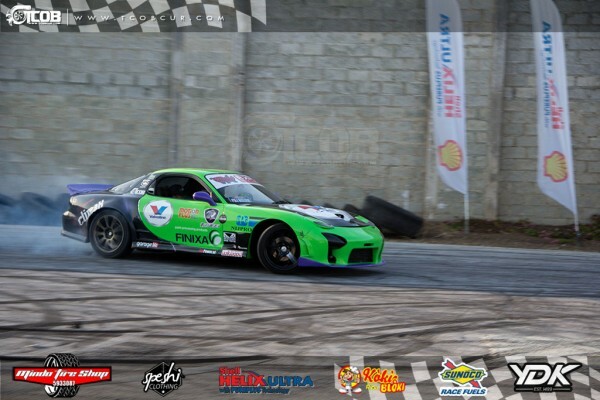 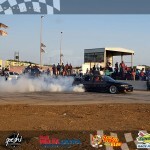 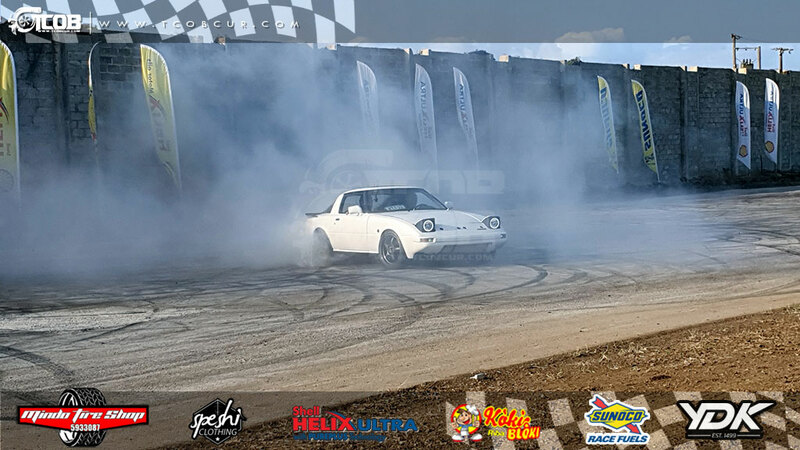 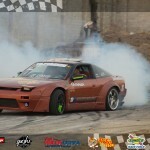 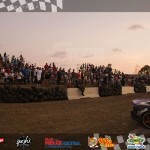 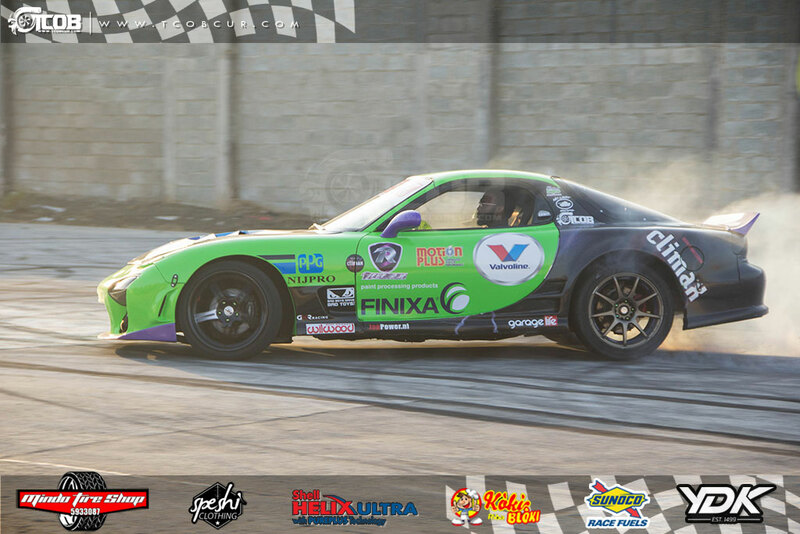 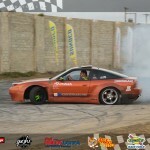 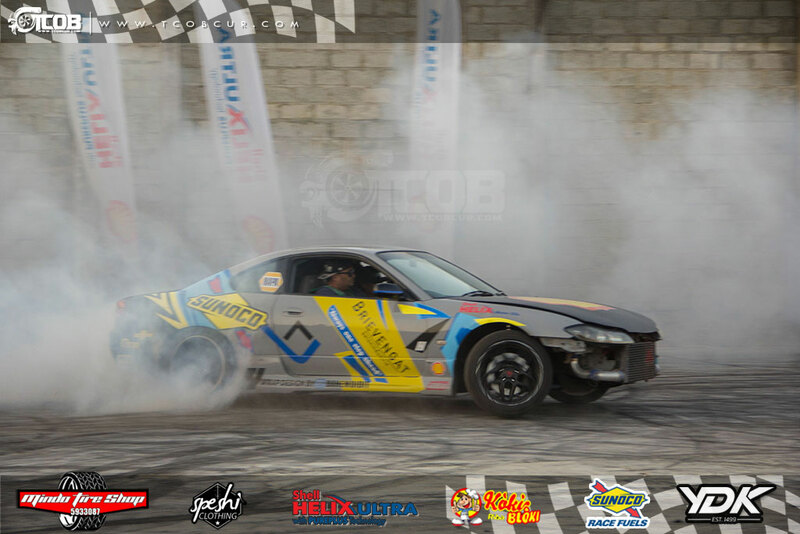 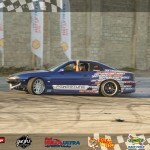 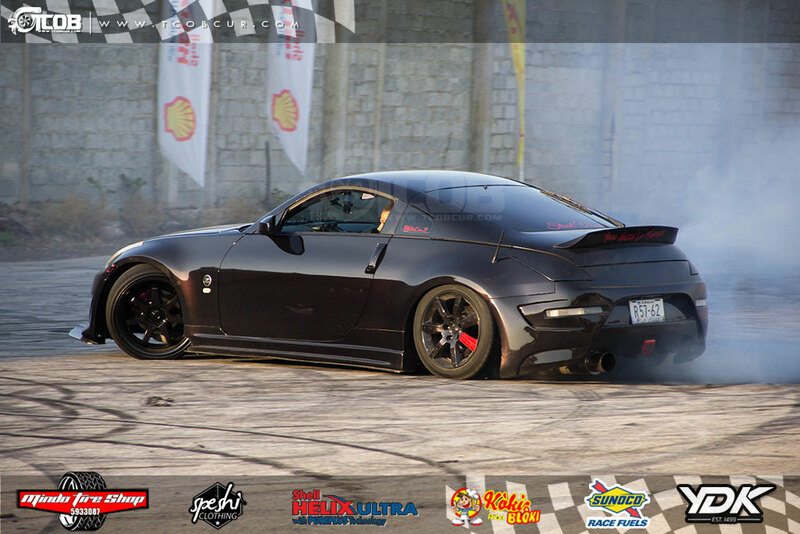 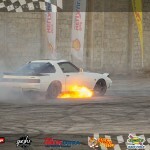 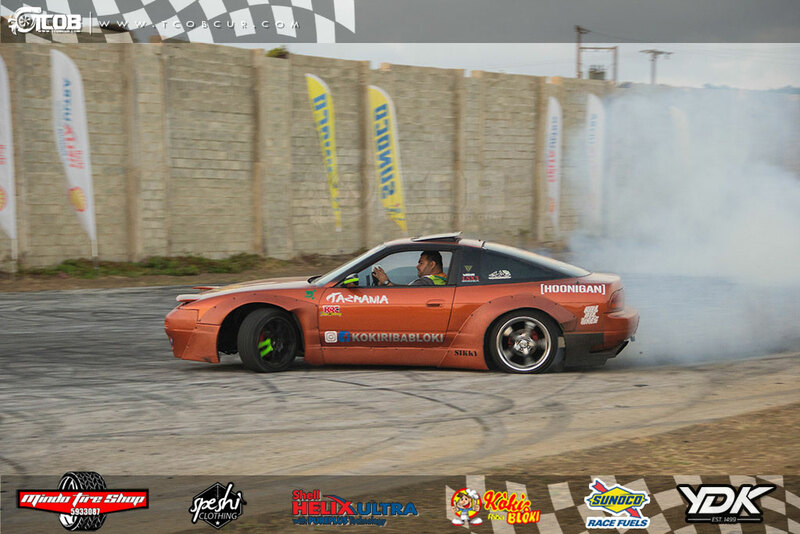 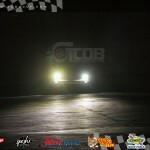 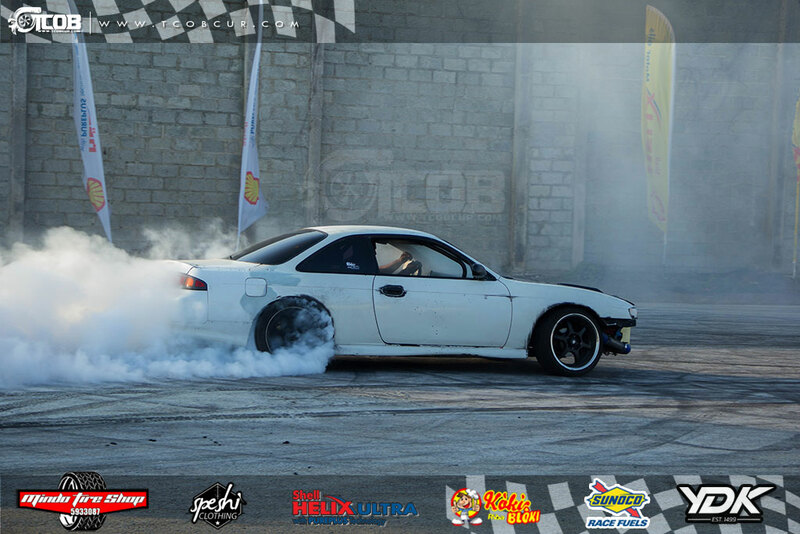 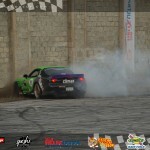 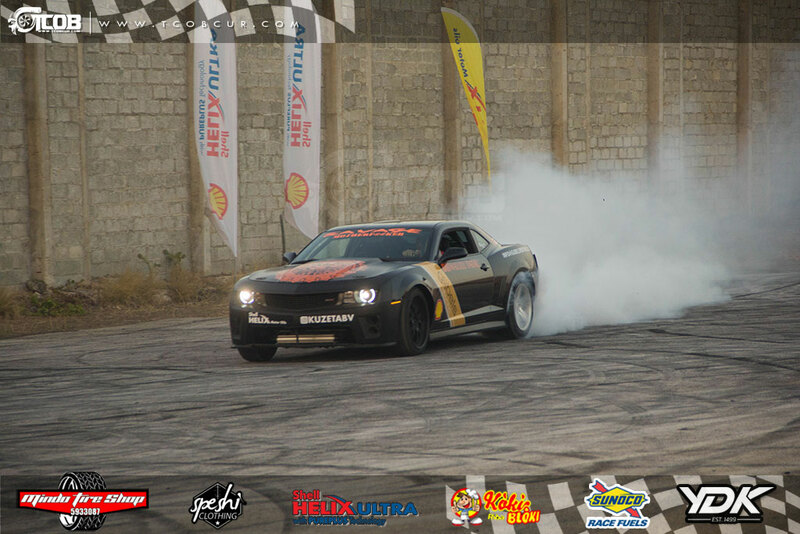 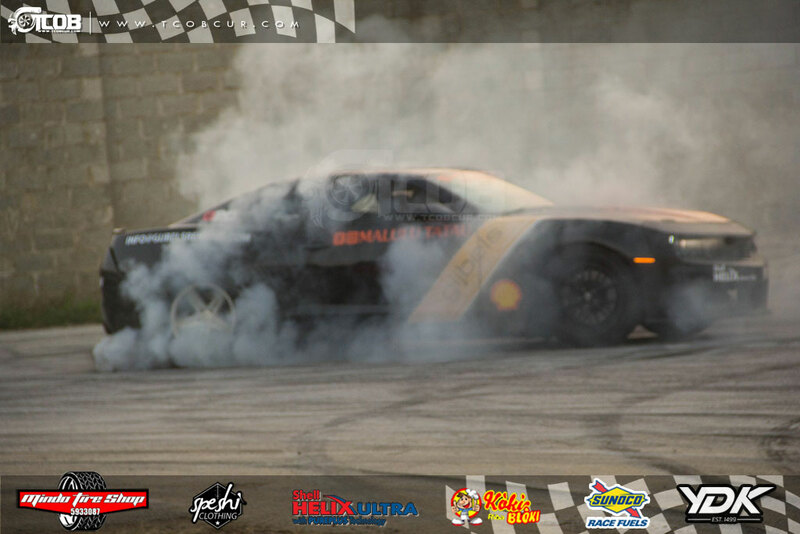 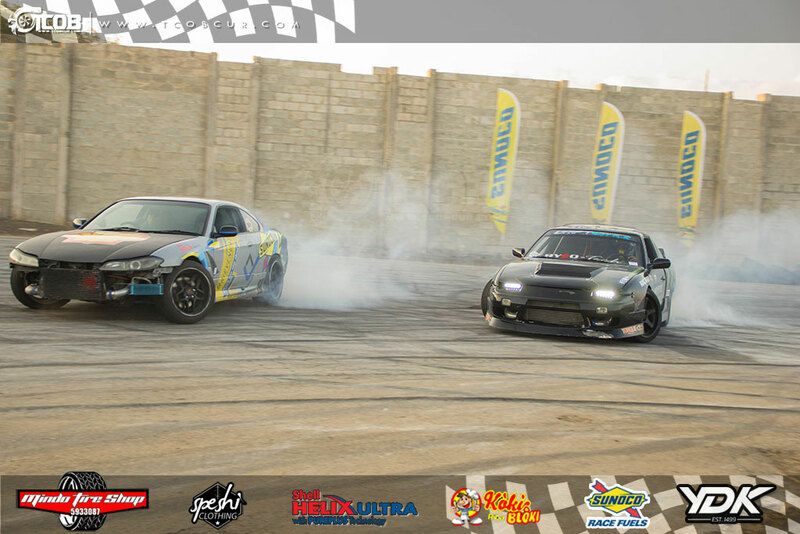 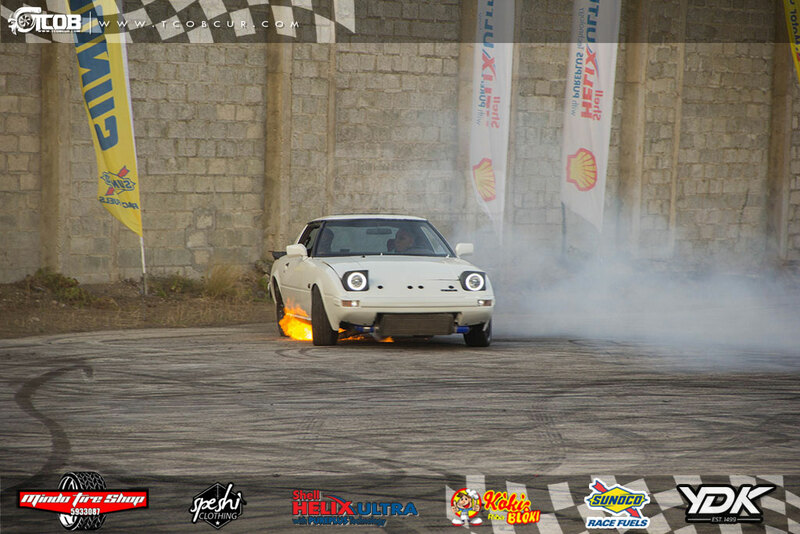 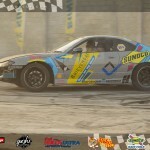 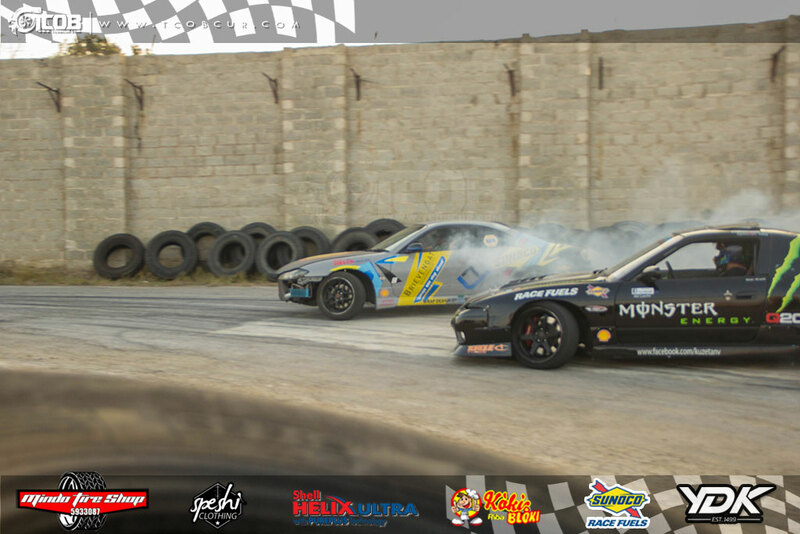 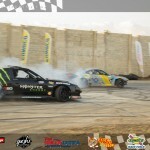 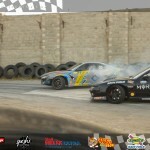 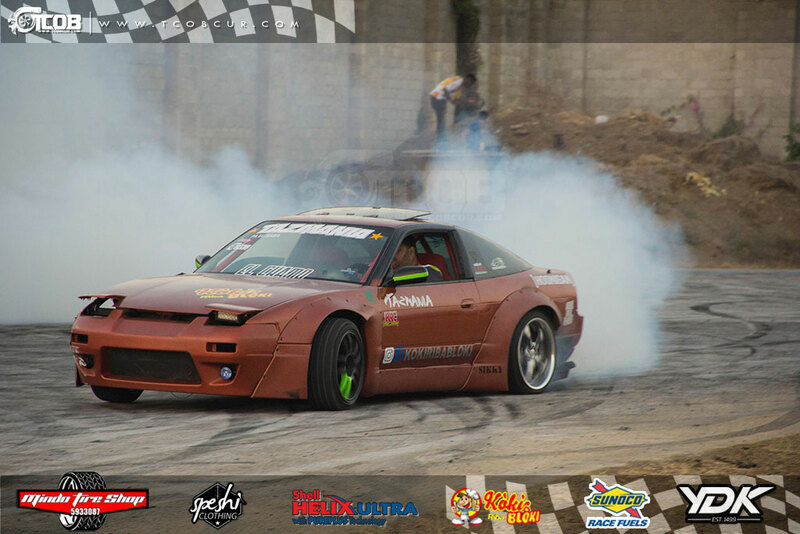 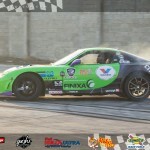 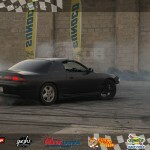 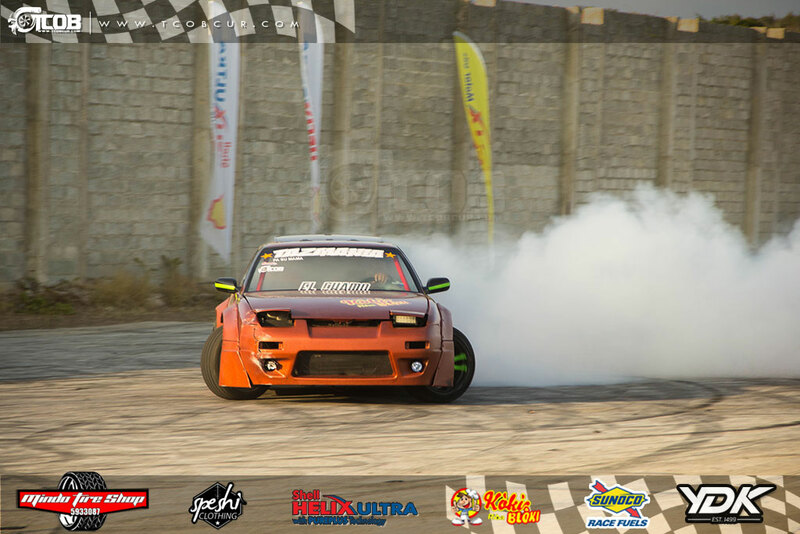 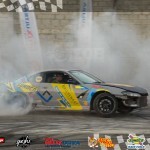 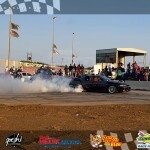 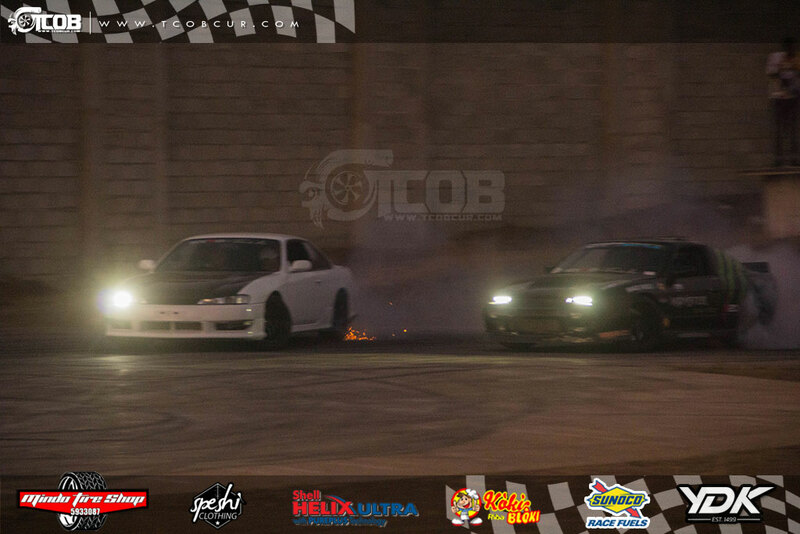 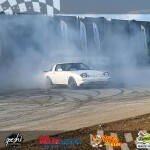 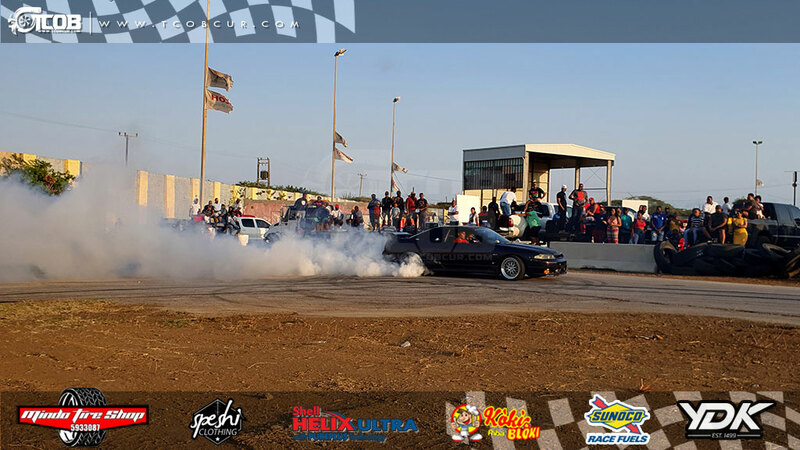 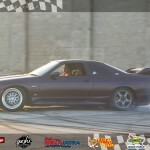 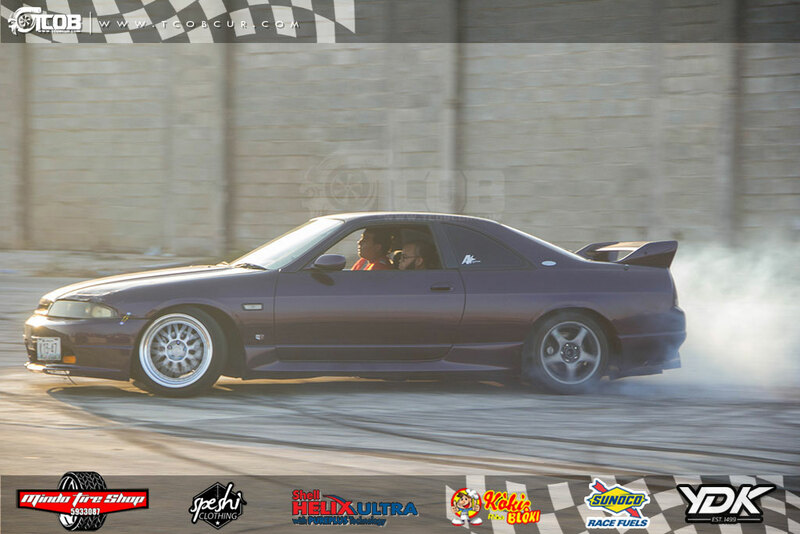 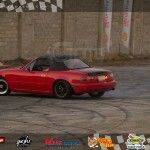 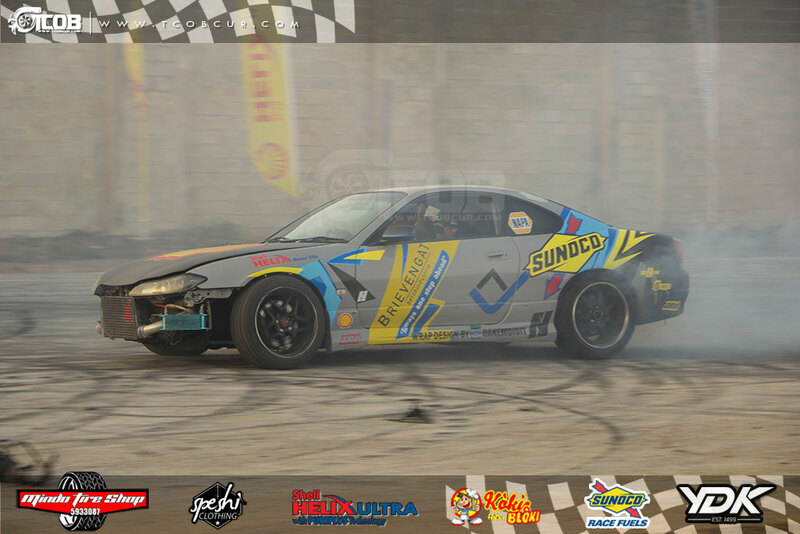 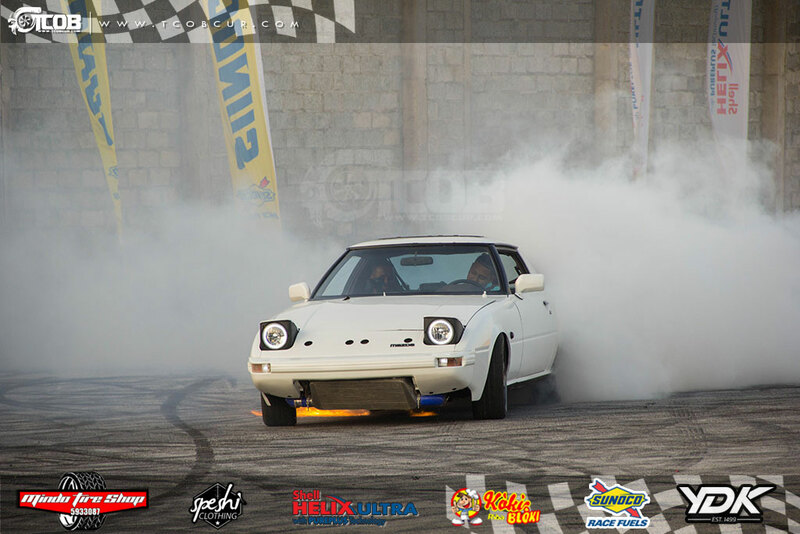 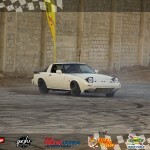 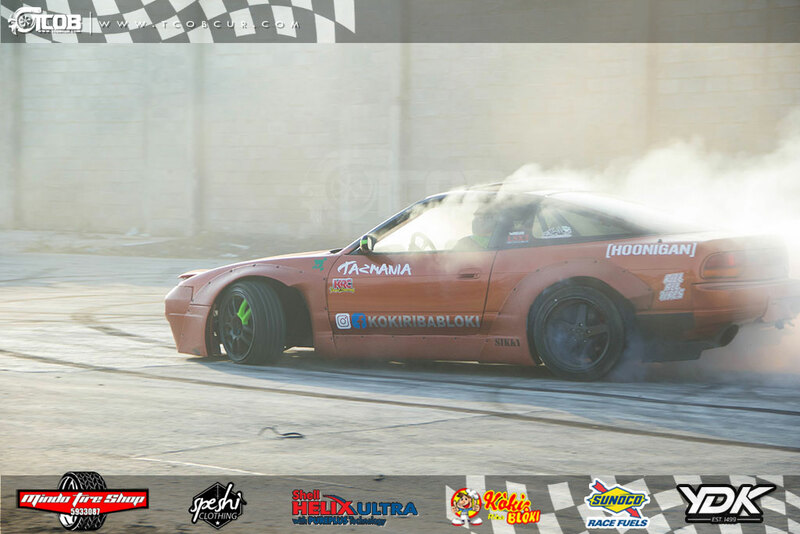 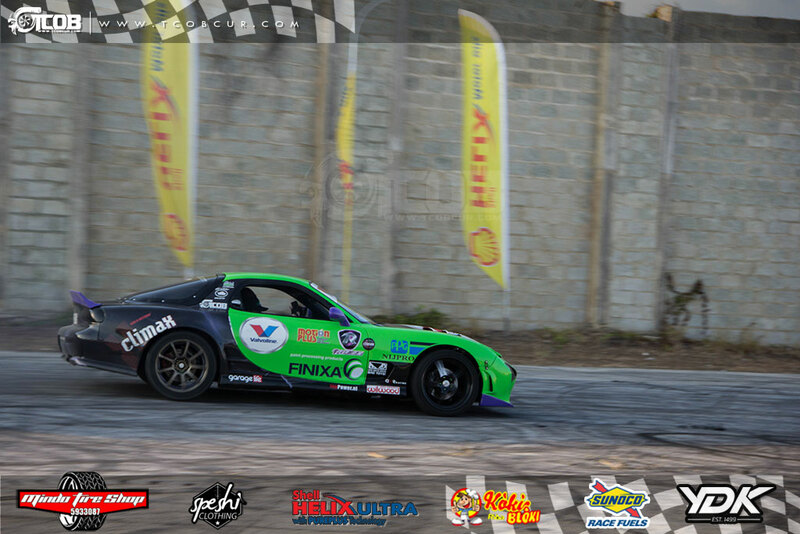 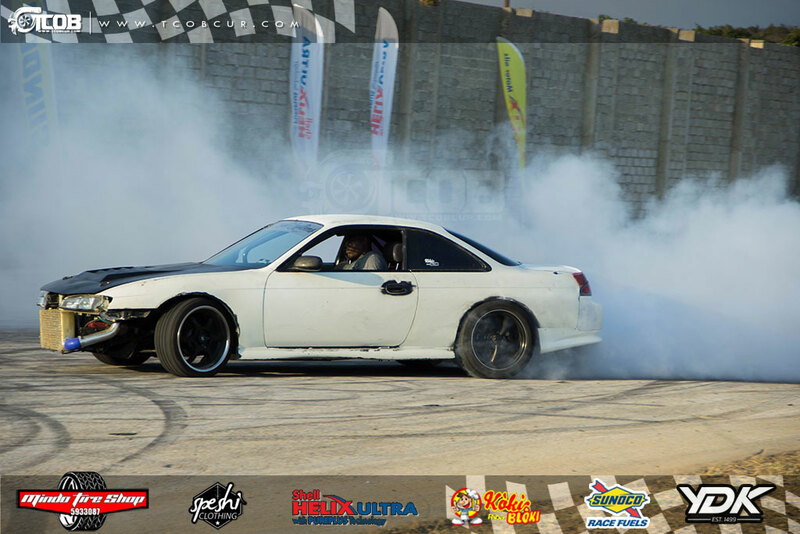 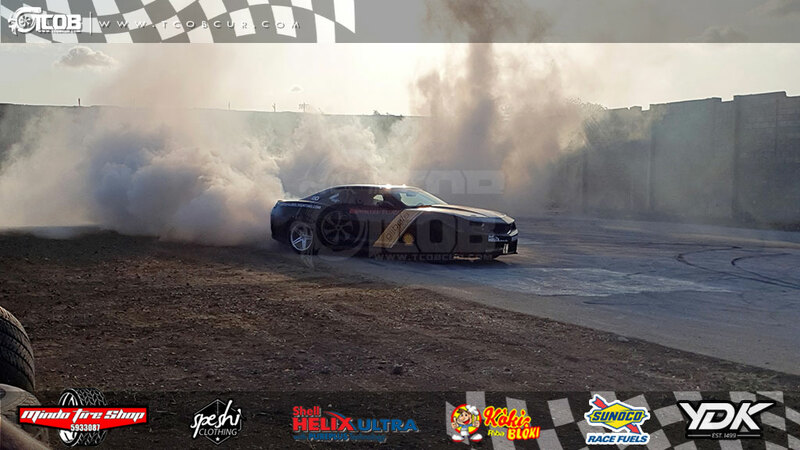 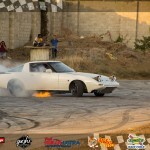 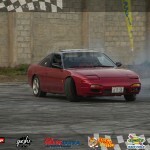 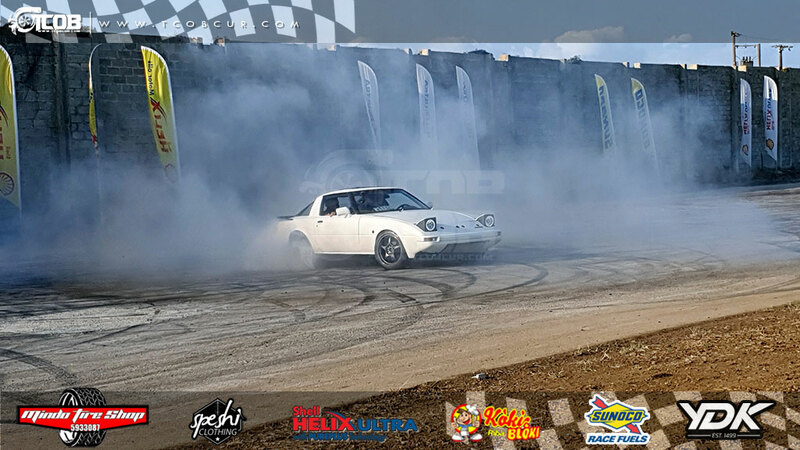 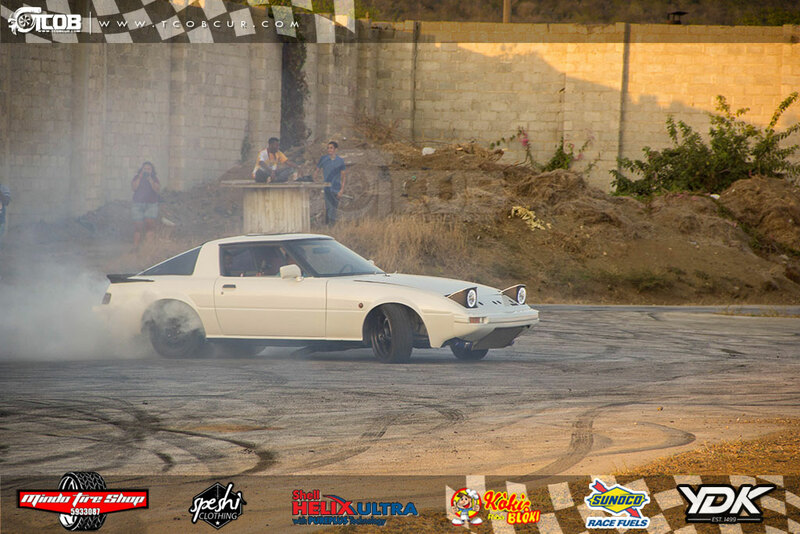 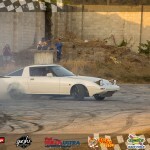 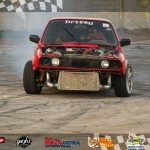 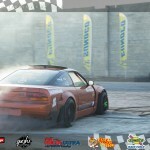 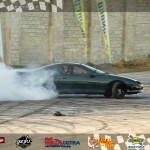 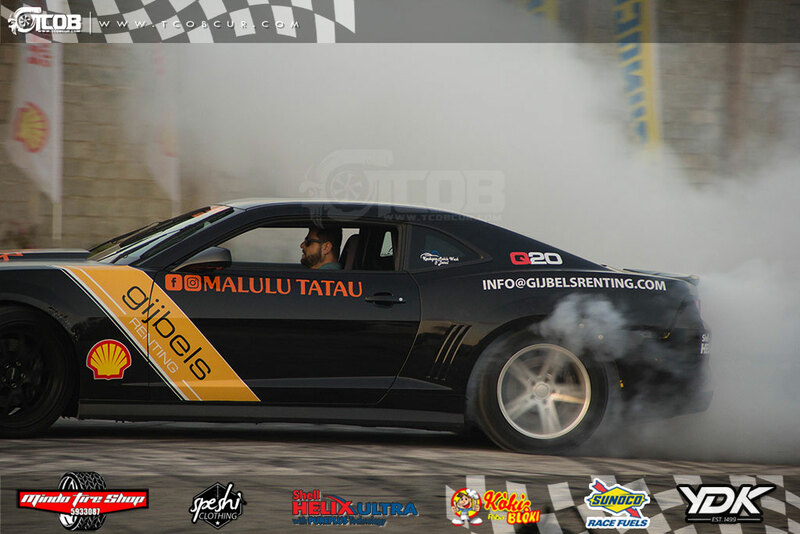 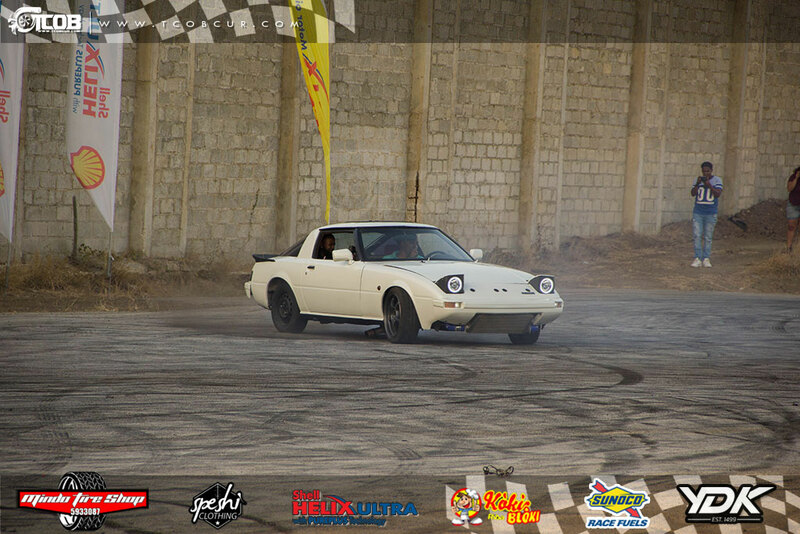 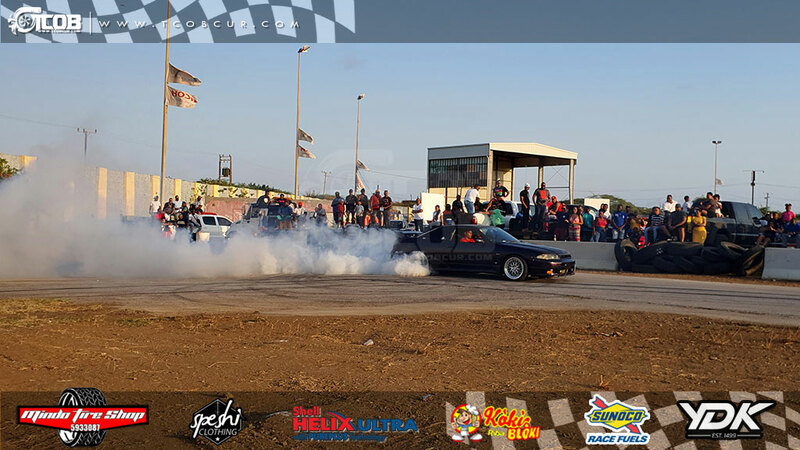 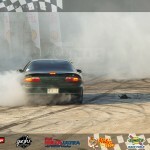 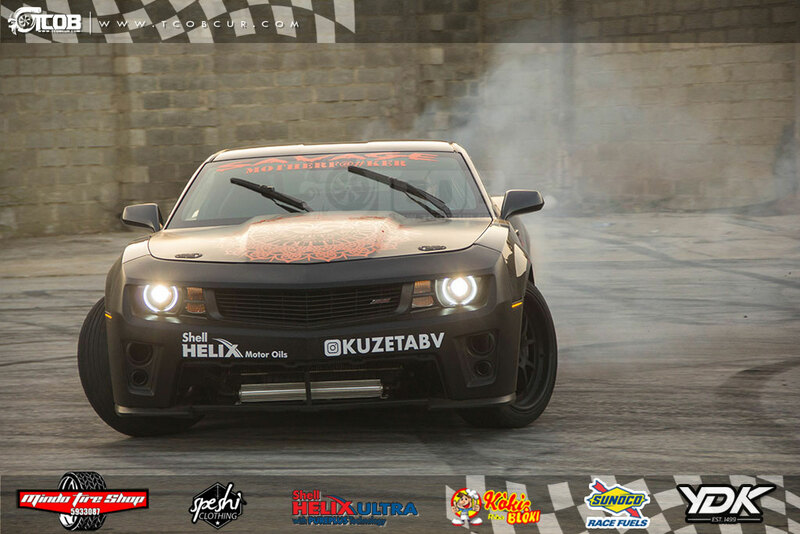 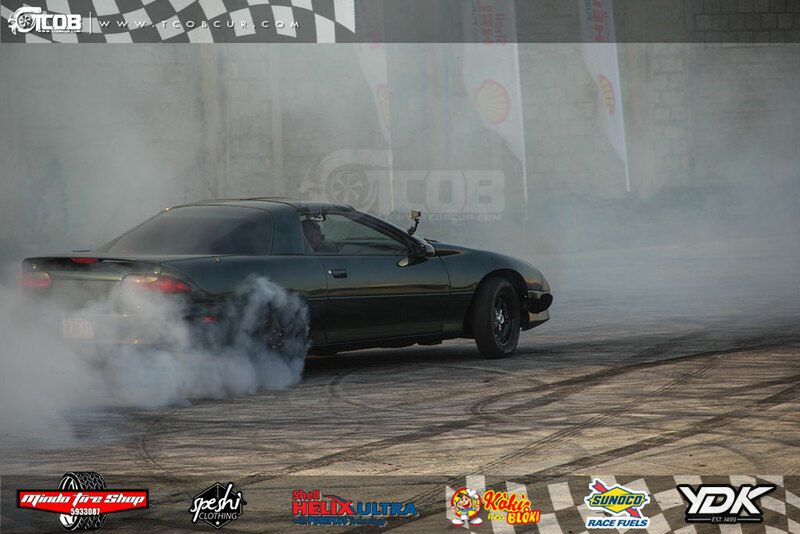 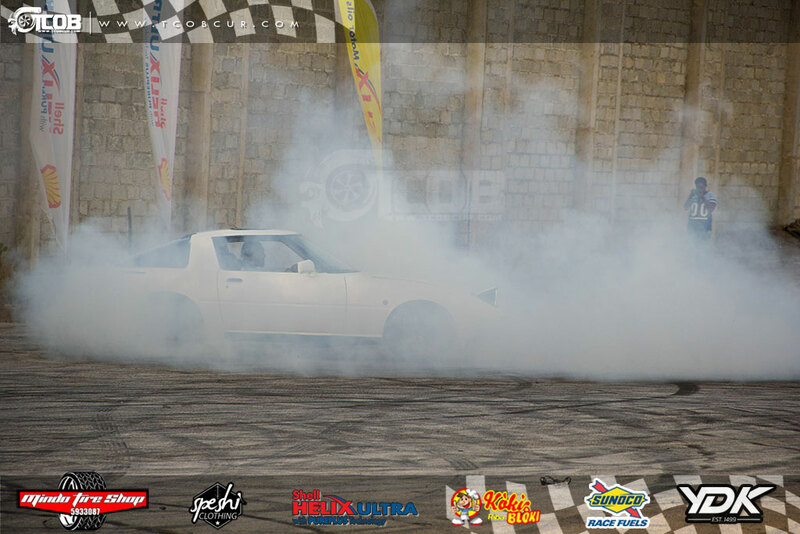 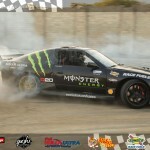 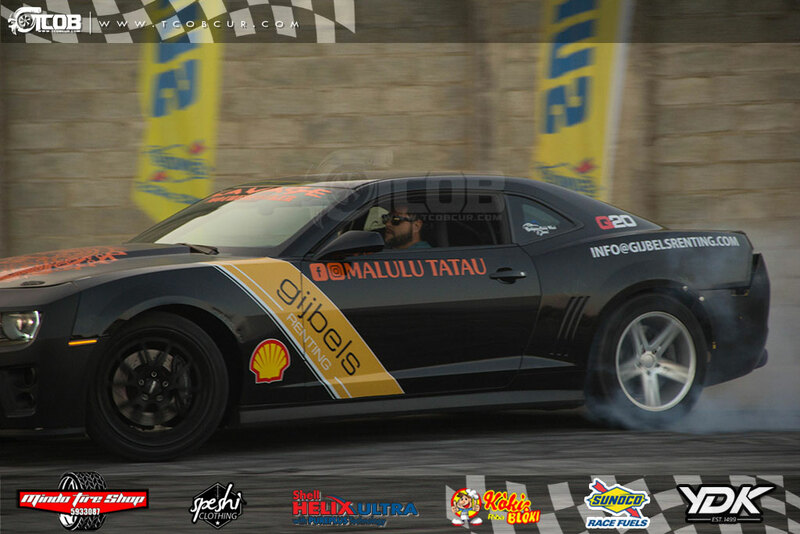 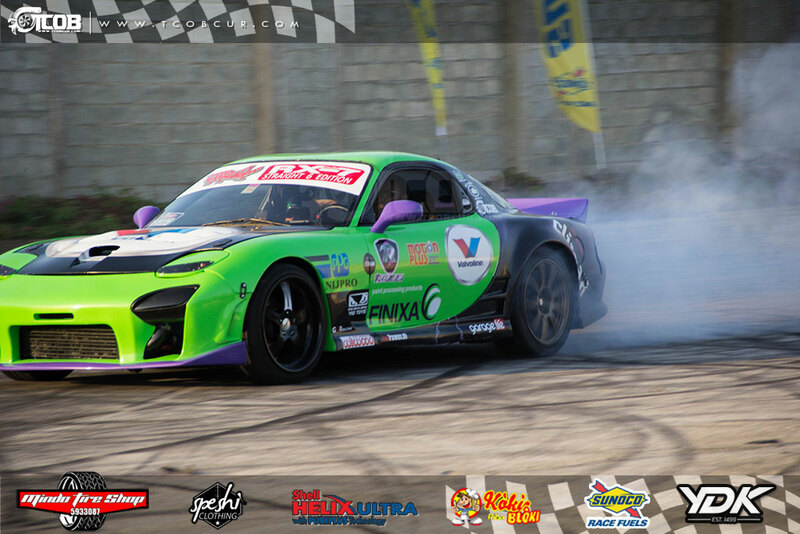 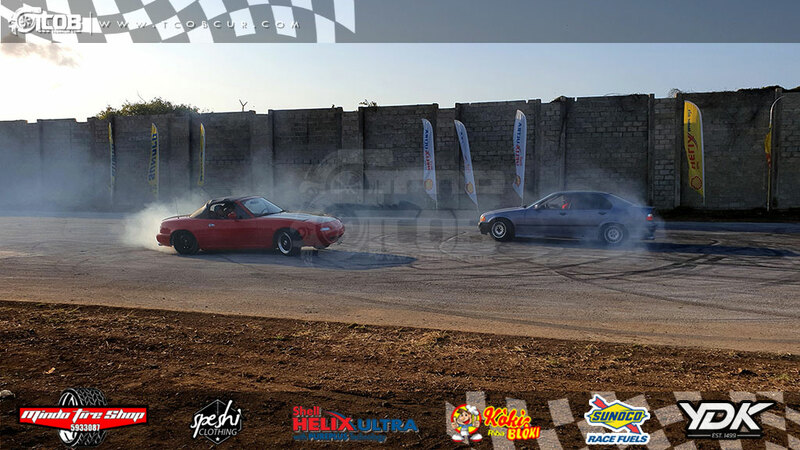 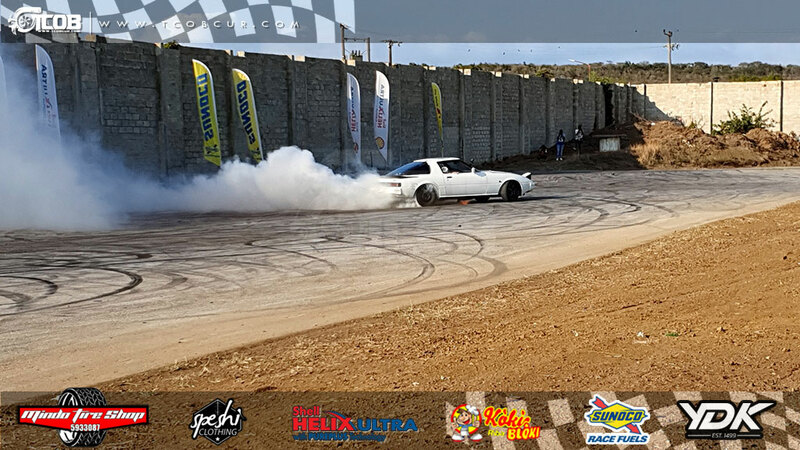 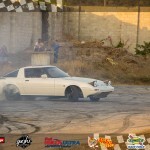 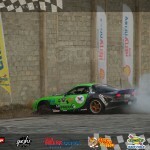 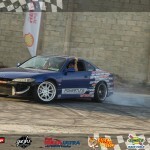 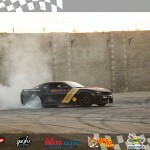 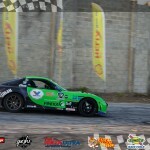 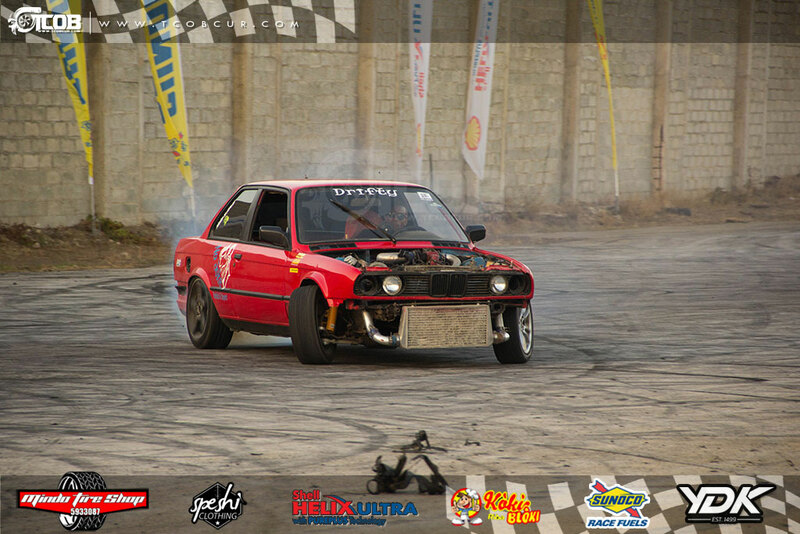 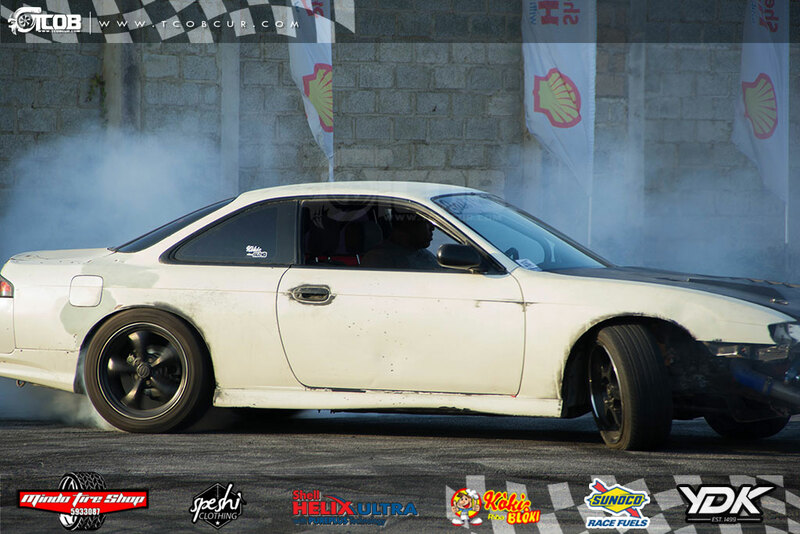 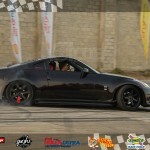 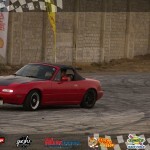 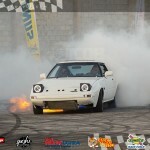 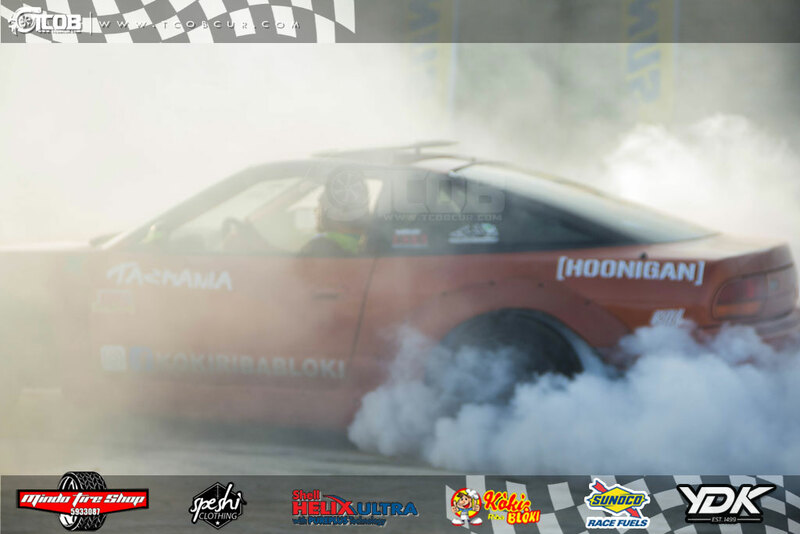 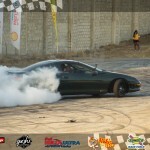 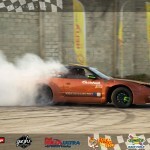 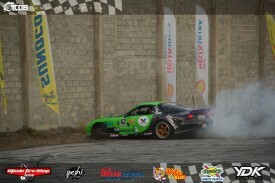 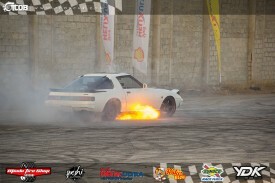 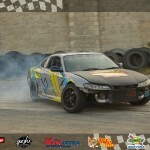 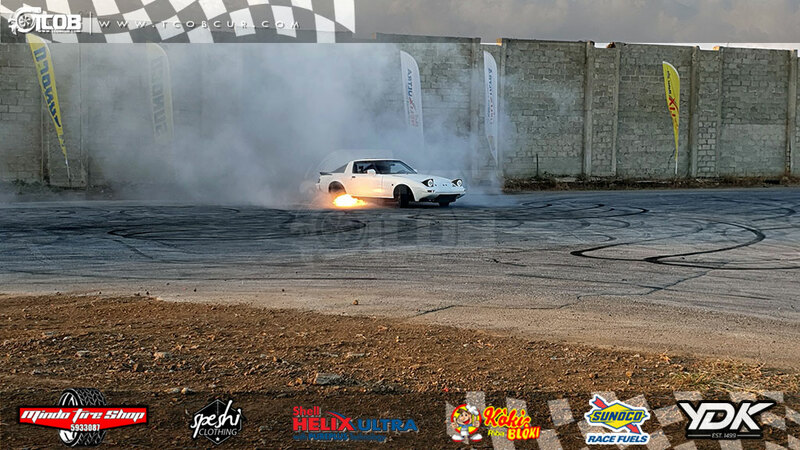 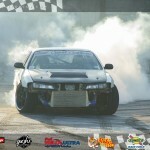 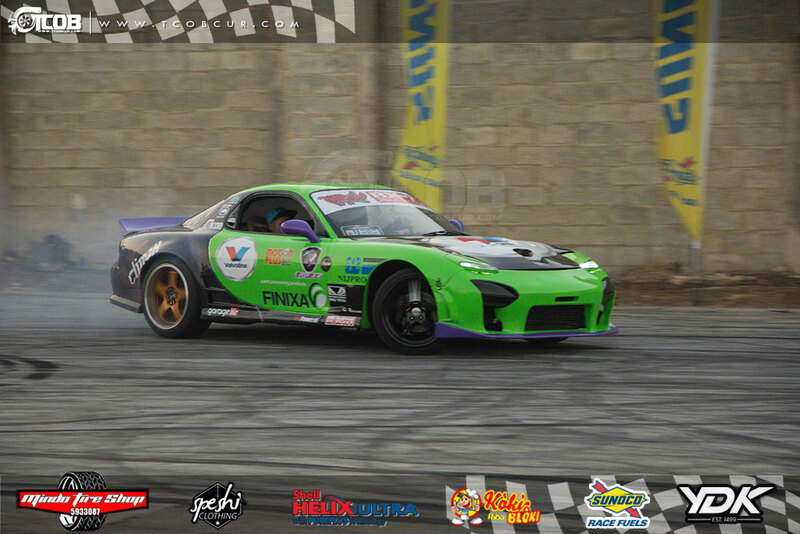 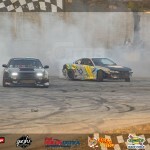 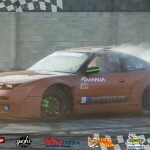 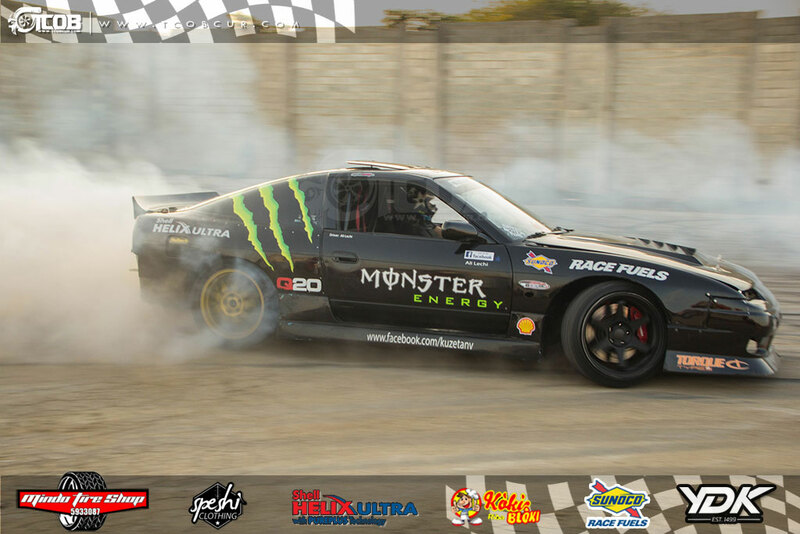 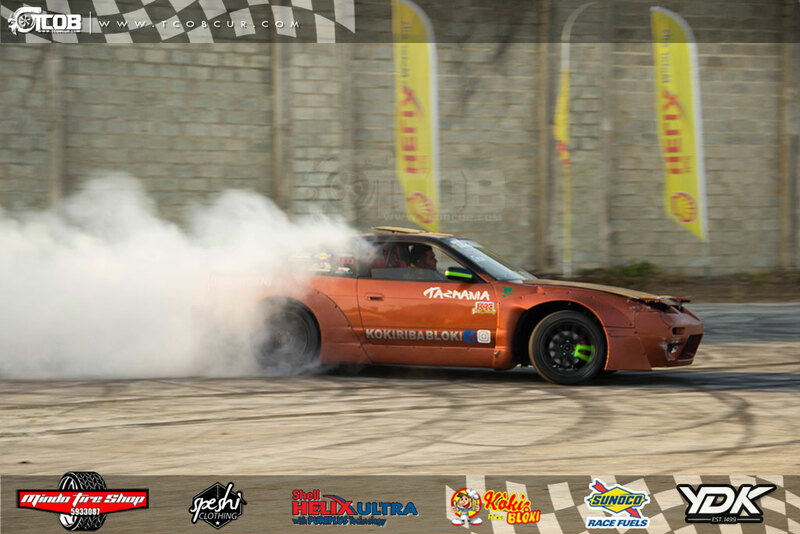 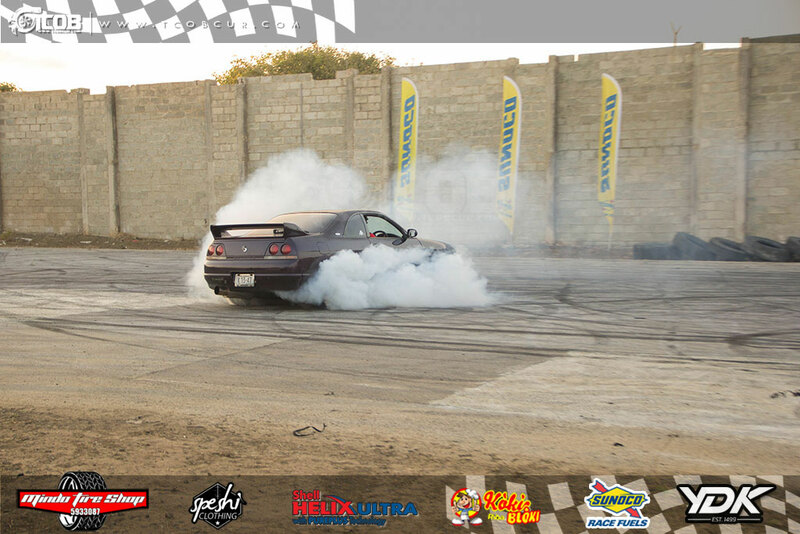 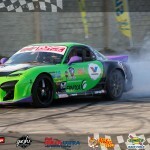 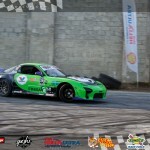 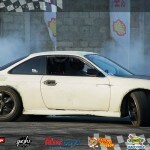 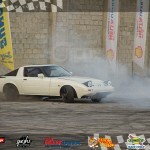 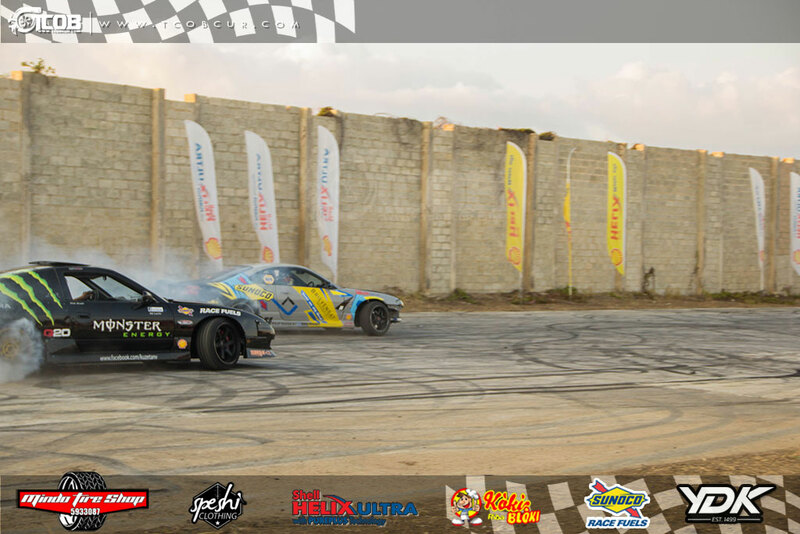 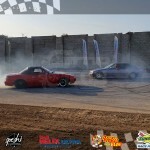 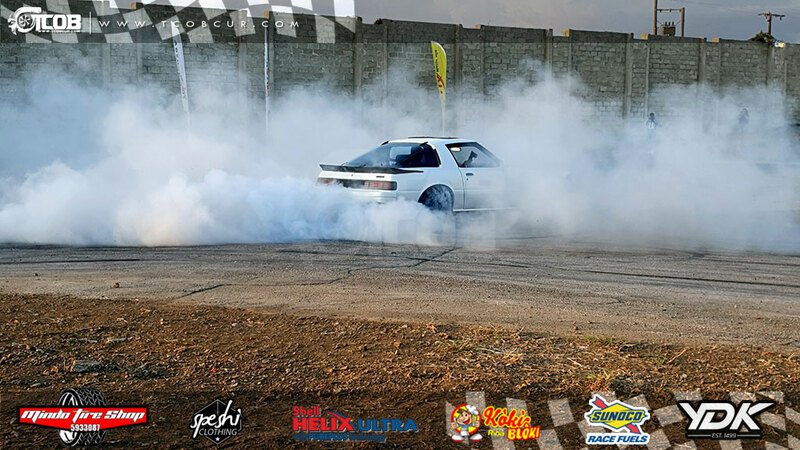 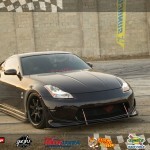 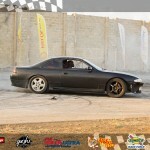 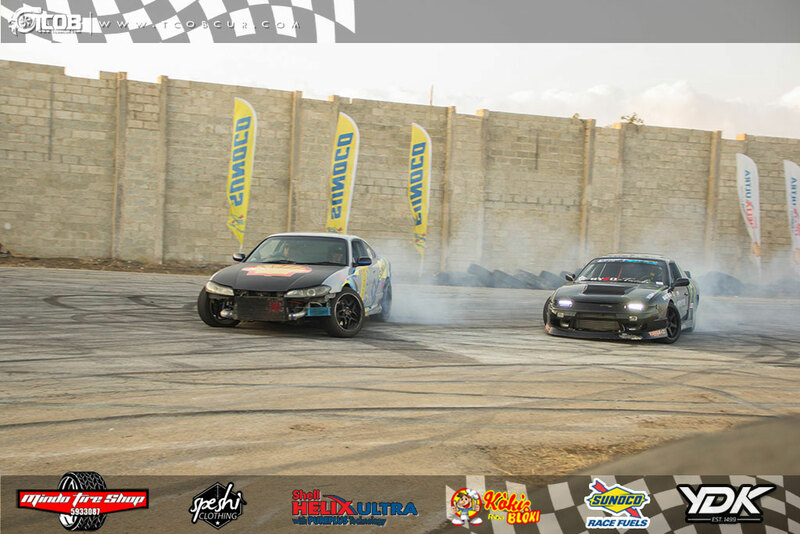 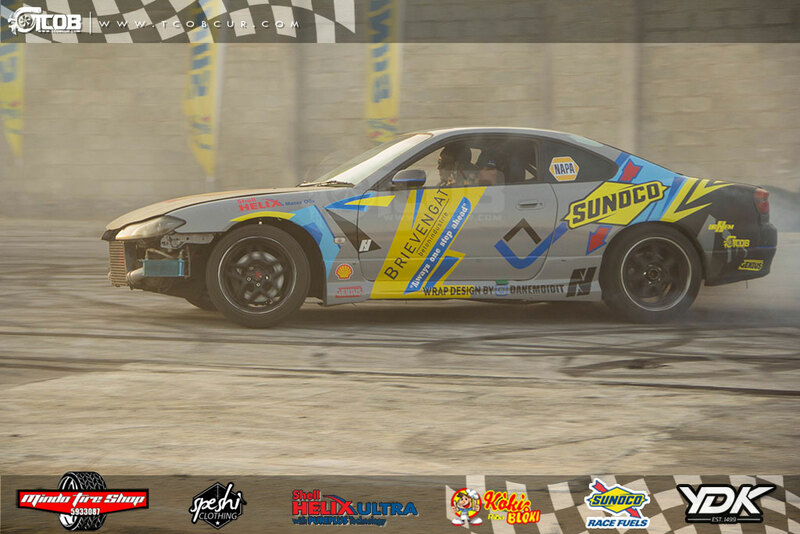 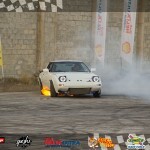 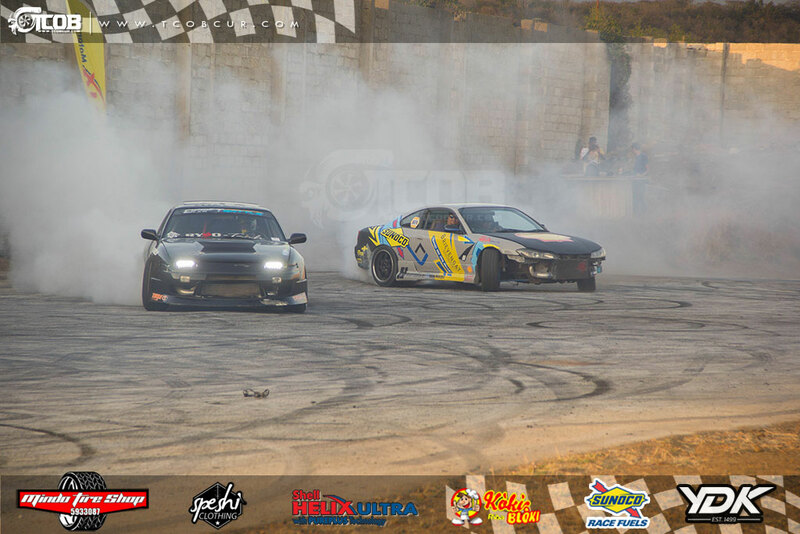 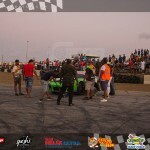 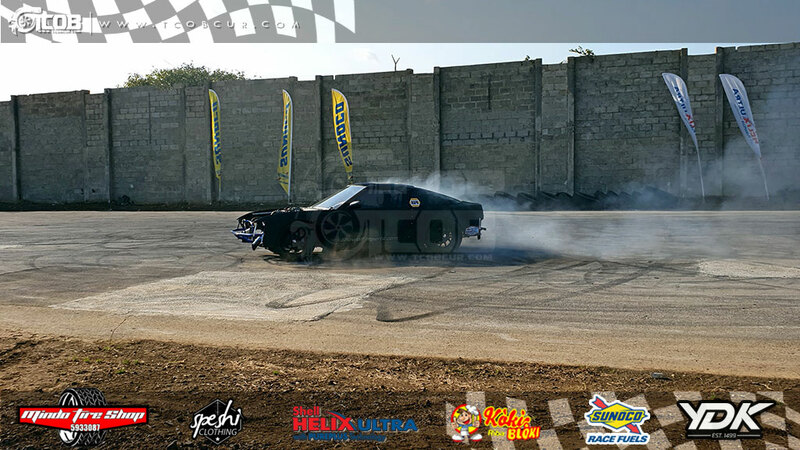 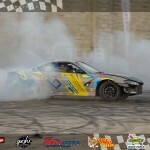 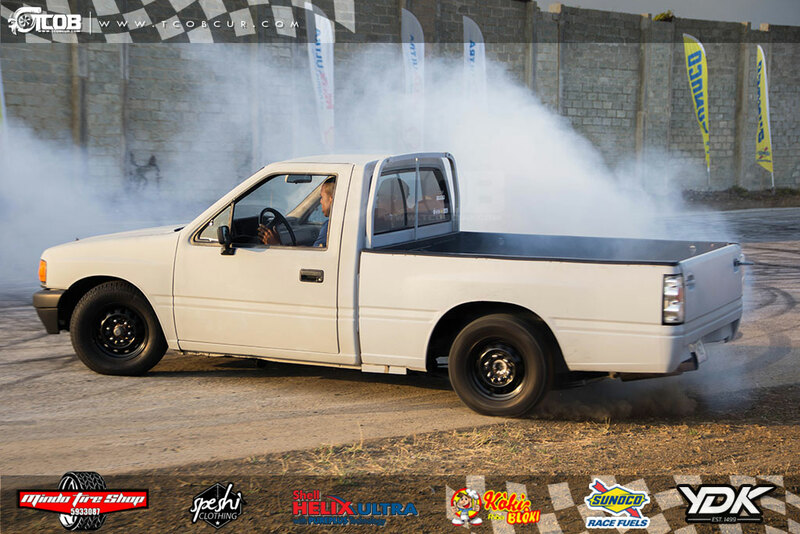 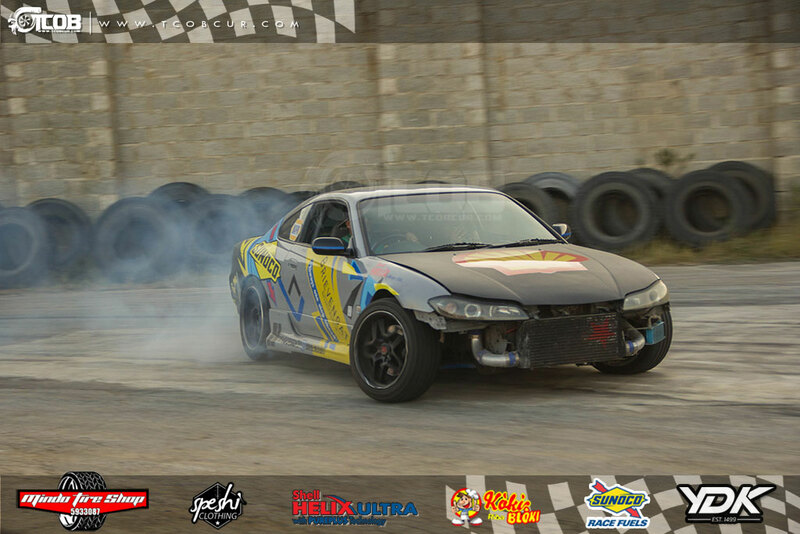 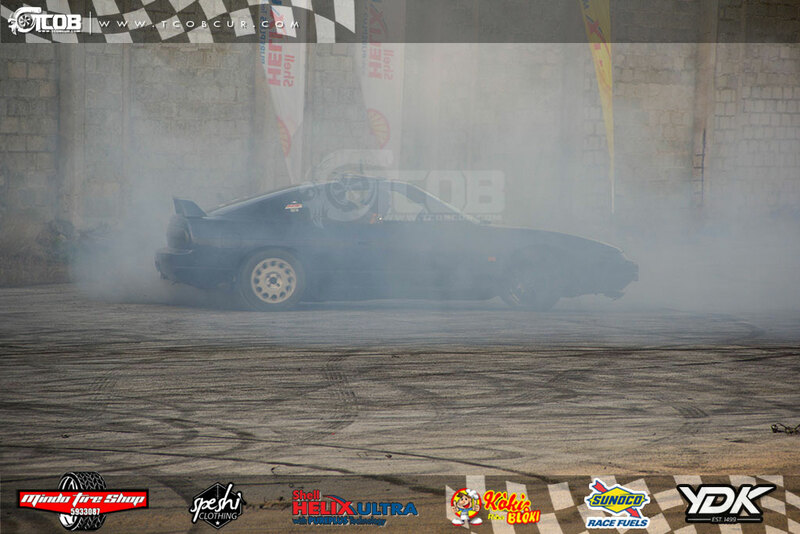 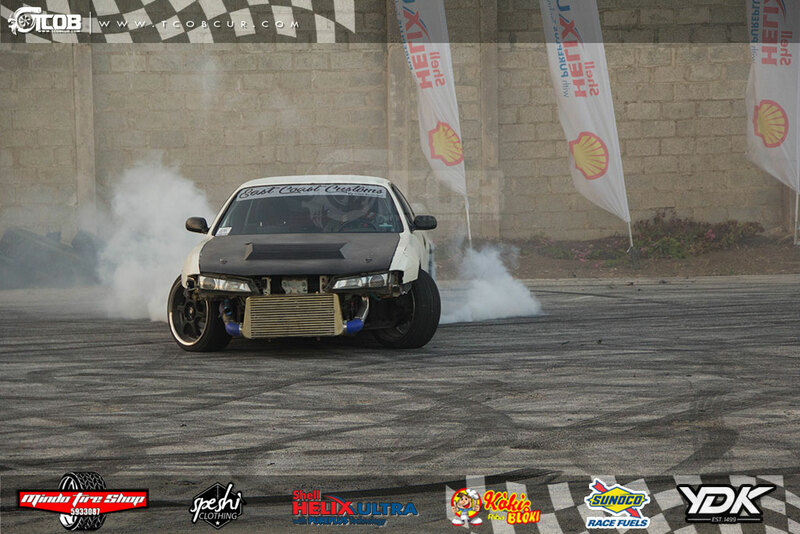 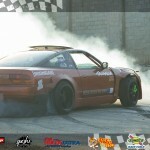 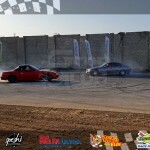 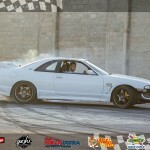 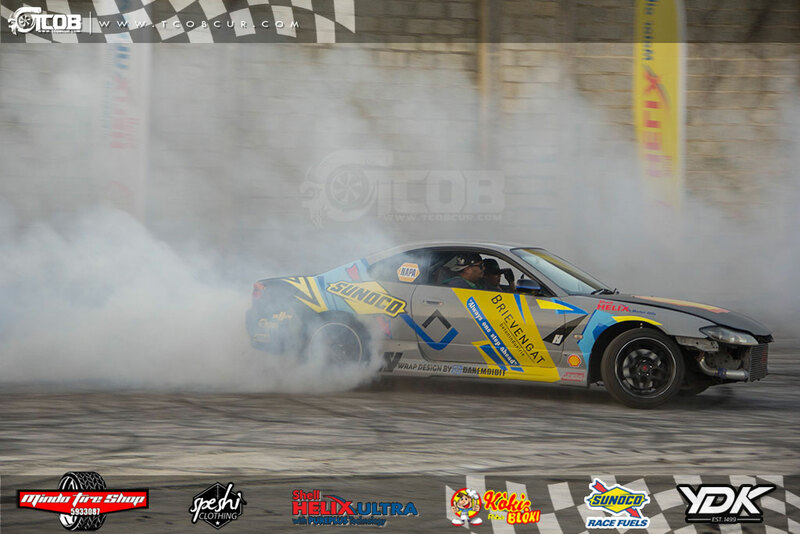 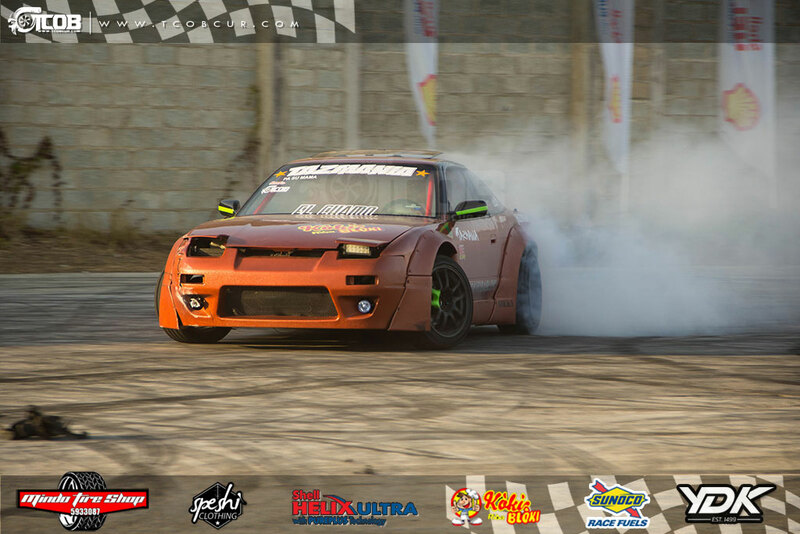 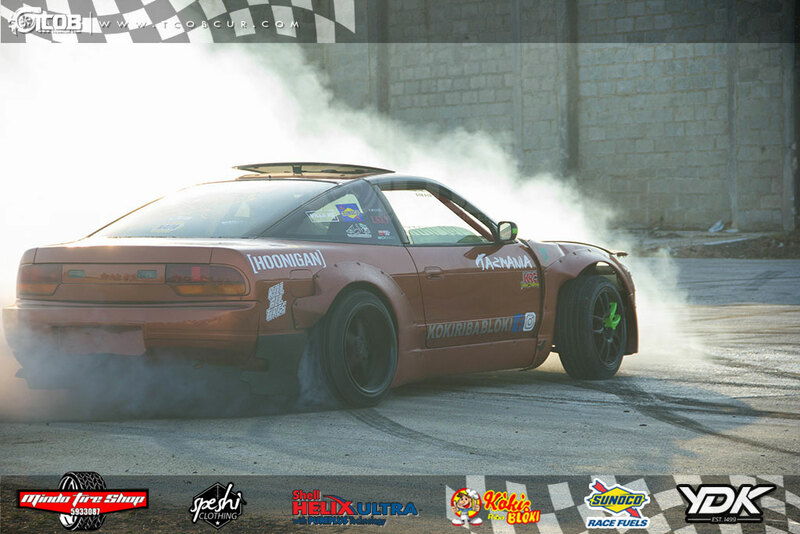 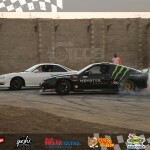 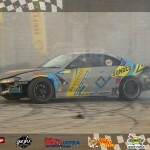 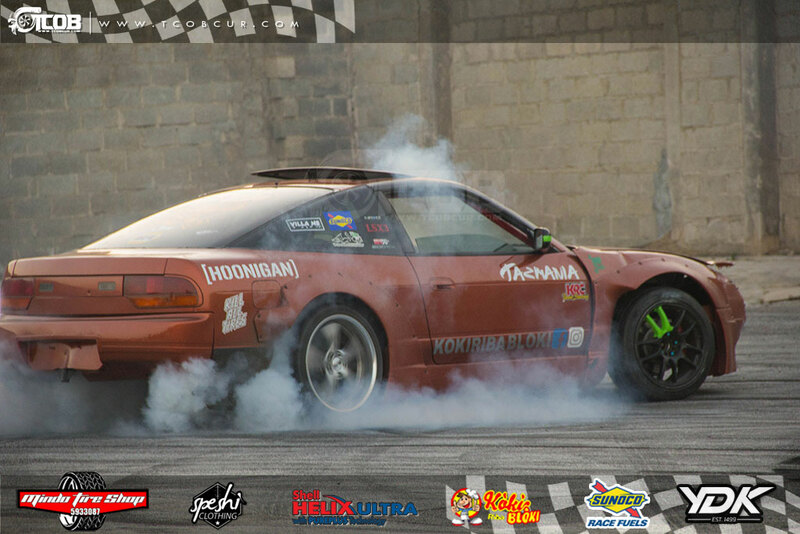 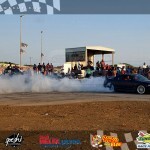 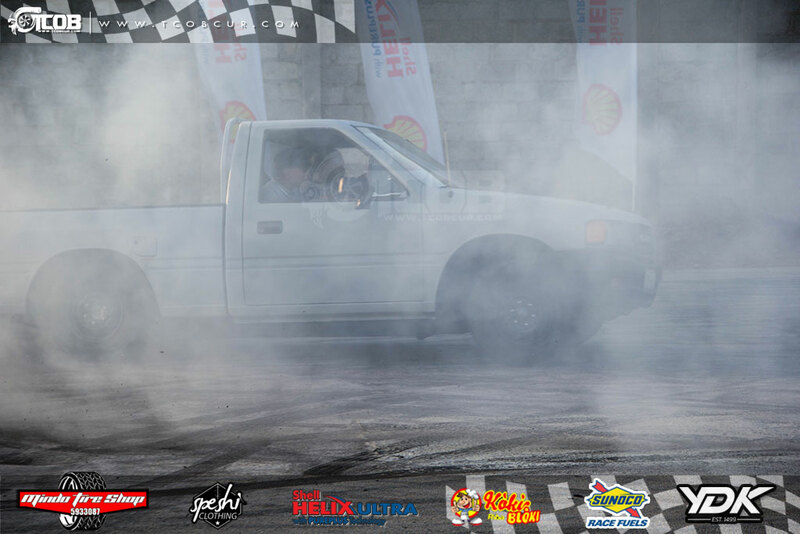 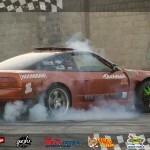 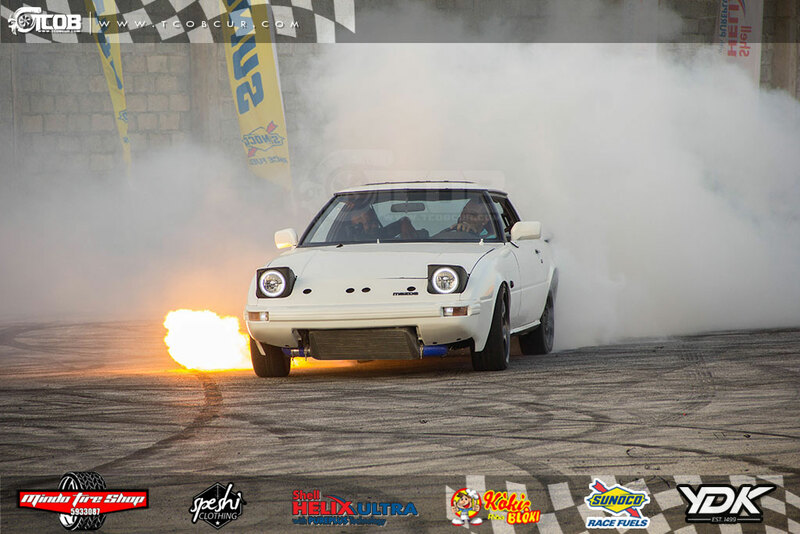 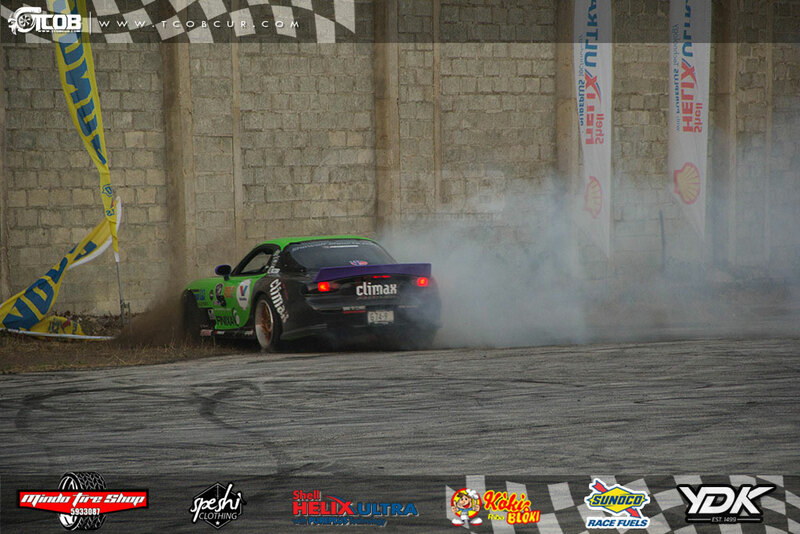 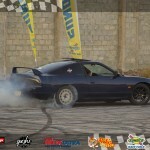 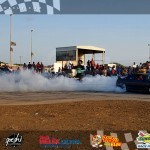 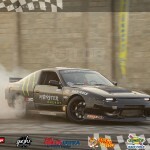 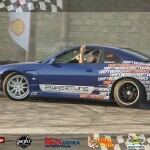 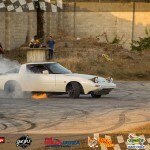 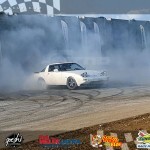 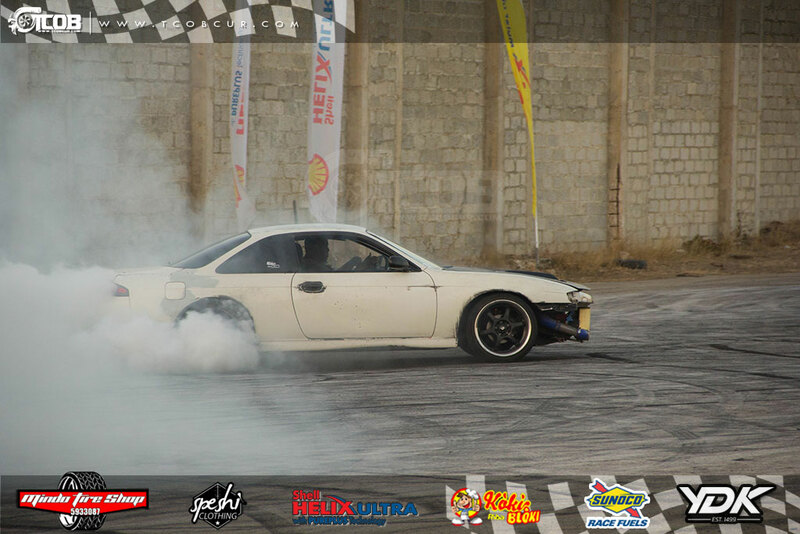 Erderly lit the place up with his FB Mazda RX-7, powered by an FD 13B turbo engine. 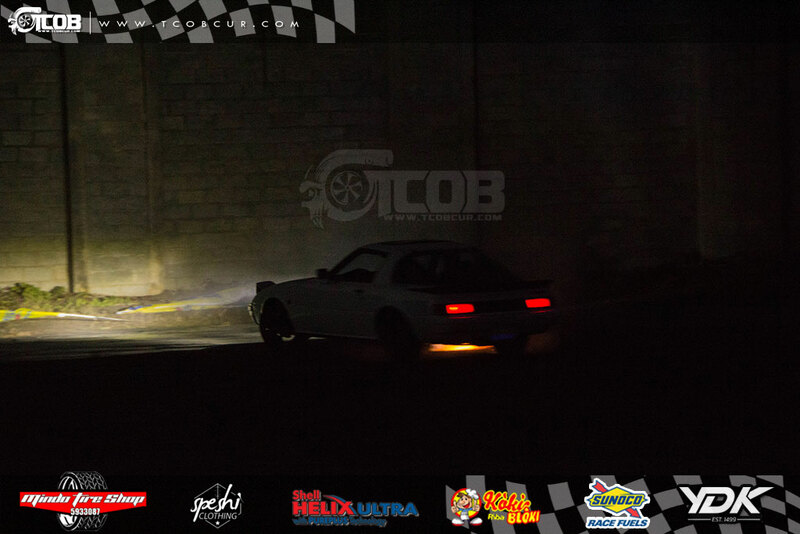 When it was getting dark, he came out again. 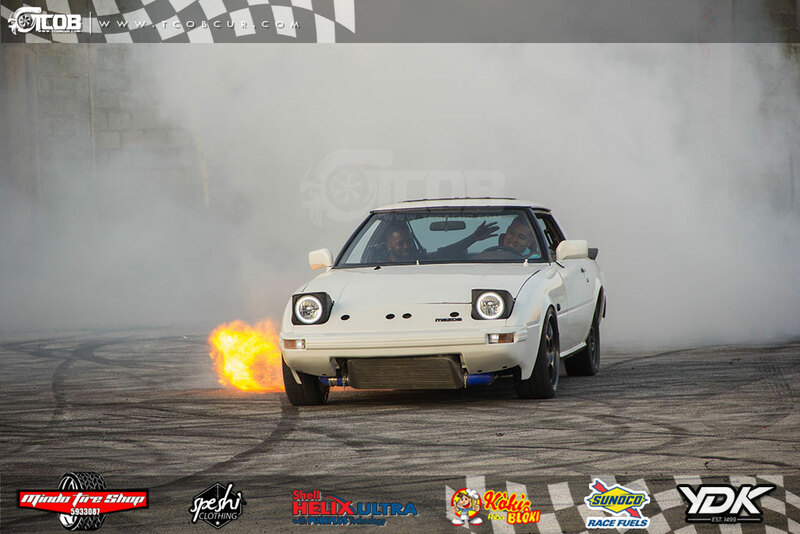 He lit the place up with his flames. 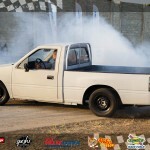 Shugrion showed up also in a pickup truck and had a blast. 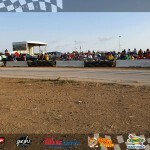 Many new drivers also stepped up and went on to put down some fever for us to see. 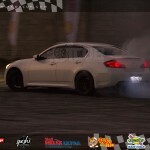 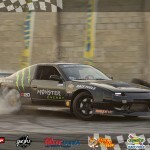 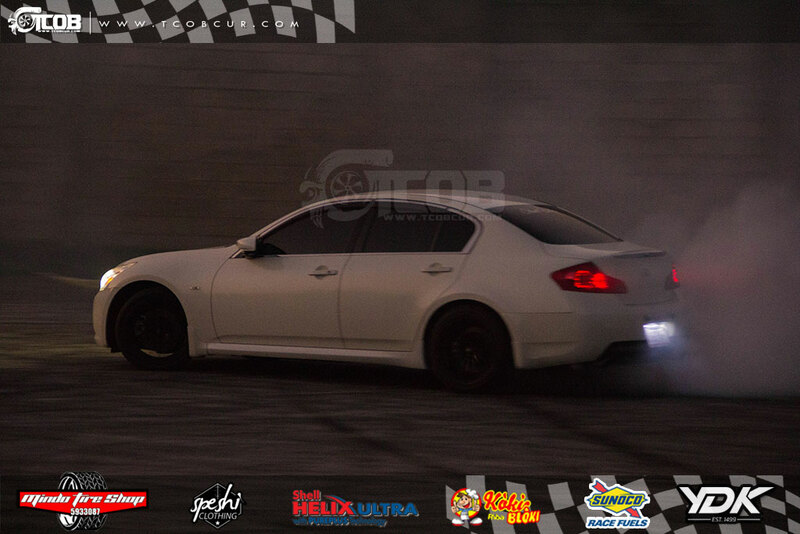 From Mazda Miata’s to Toyota Altezza’s, from BMW’s to Nissan 200SX, it was a HOON party. 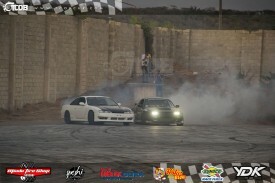 The local drifters also made their presence known. Ali and Cesar and Claudio did some tandem runs, that made everybody stand up. 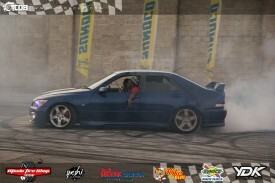 Claudio was not to be left behind also. 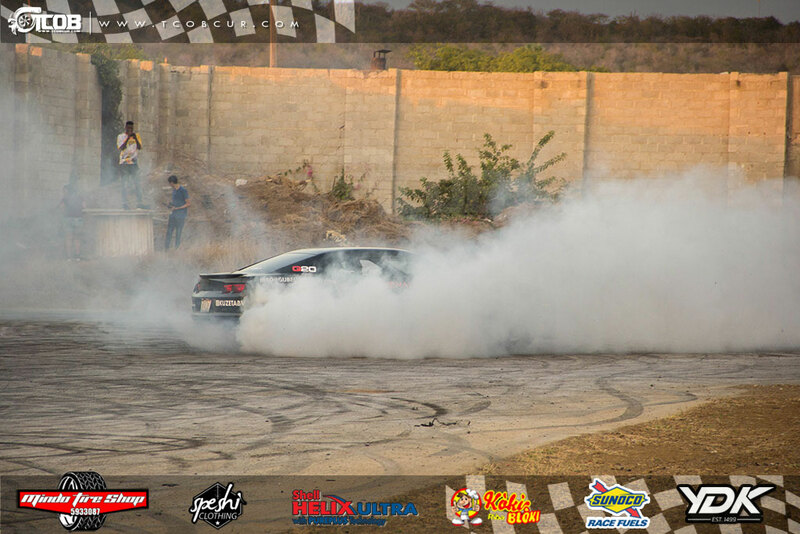 They gave him many cars to run, and he slayed them all. 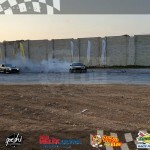 Even when being chased down by Ali, he kept cool and continued to drift like he always does. 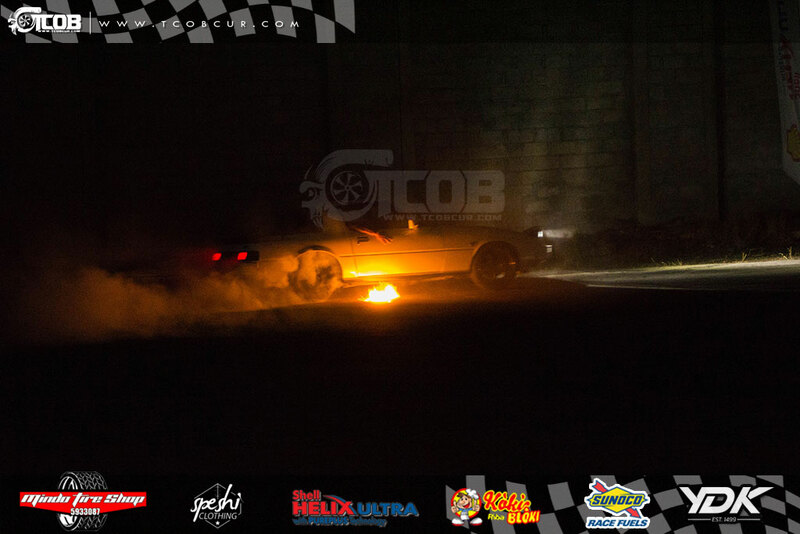 He encountered one of the worse failures that can happen to a car. 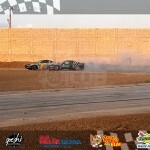 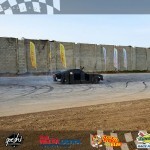 His steering wheel (input)shaft broke on him just as he was exiting the loop. 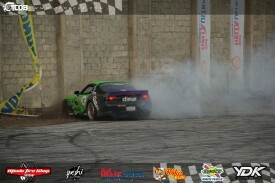 Luckily he managed to stop the car just before it reached the wall. 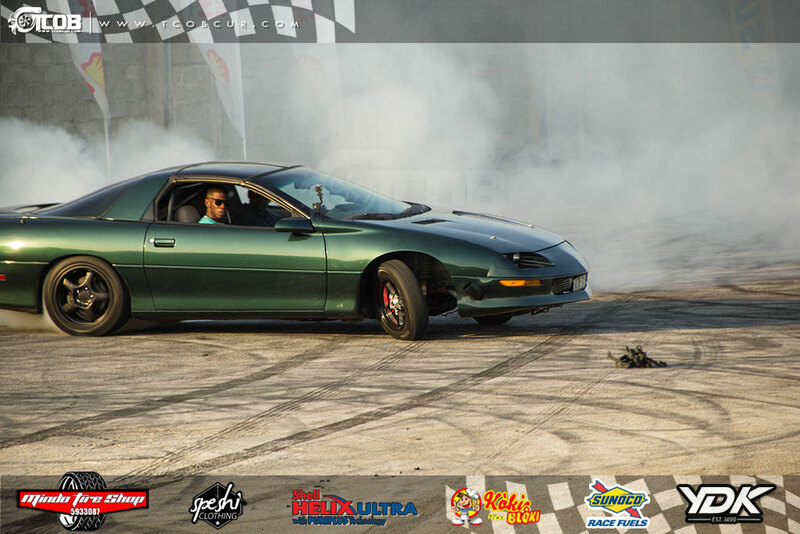 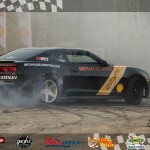 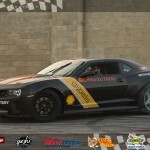 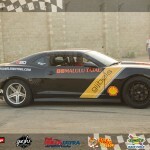 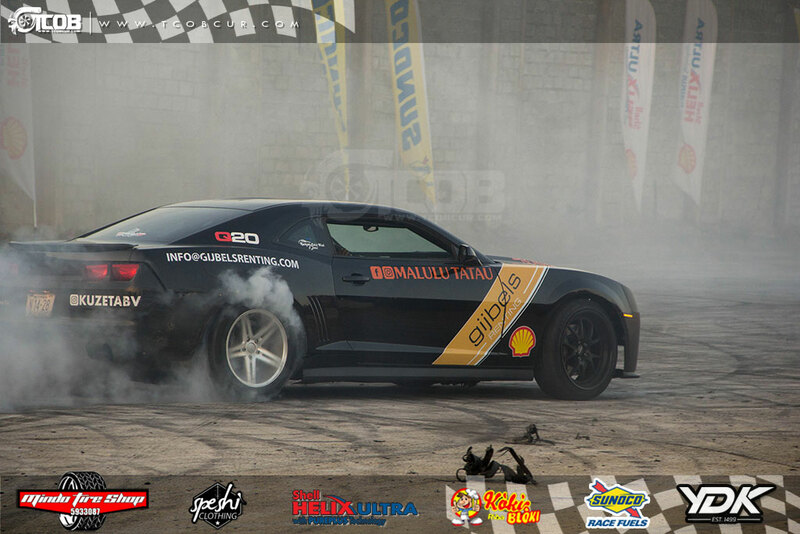 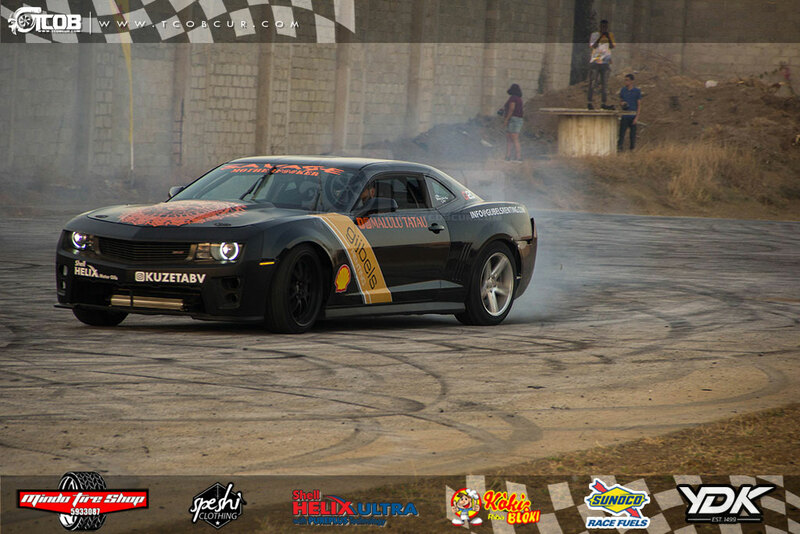 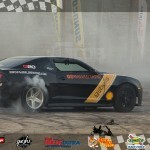 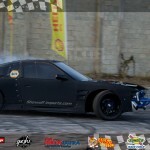 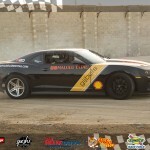 Event organizer Gabriel de Camara, got his #Savage Camaro back running. 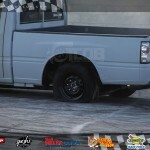 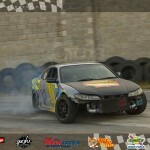 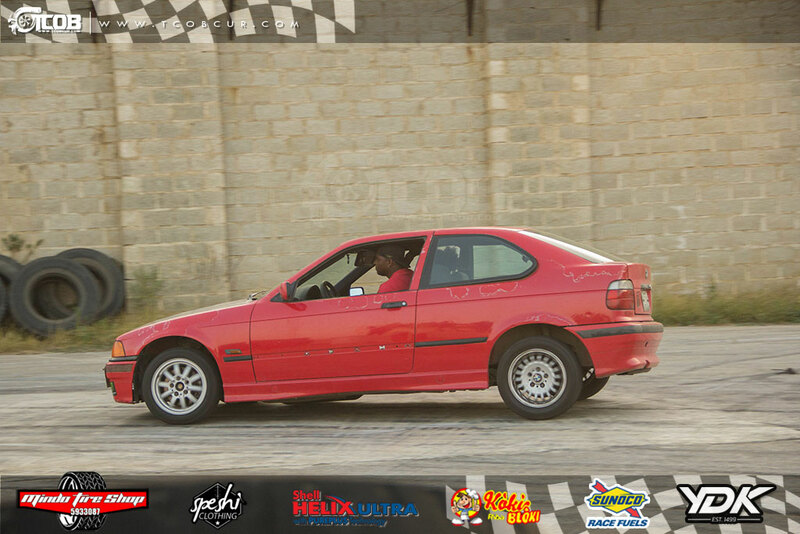 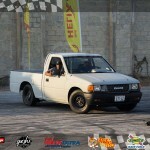 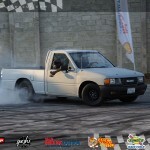 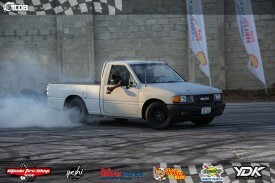 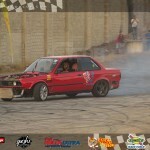 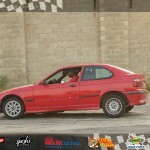 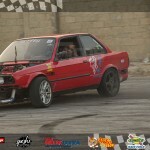 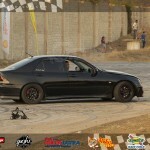 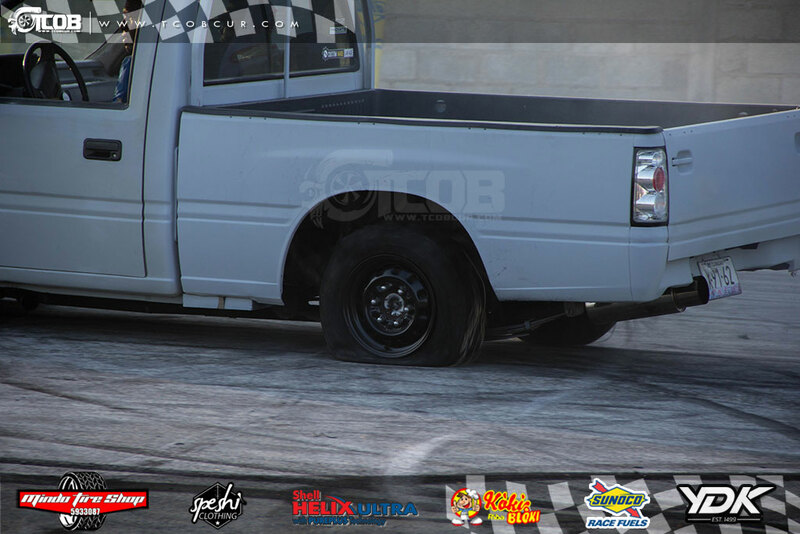 This was after he trashed the gearbox and clutch during the last event. 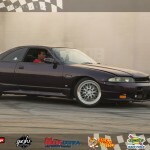 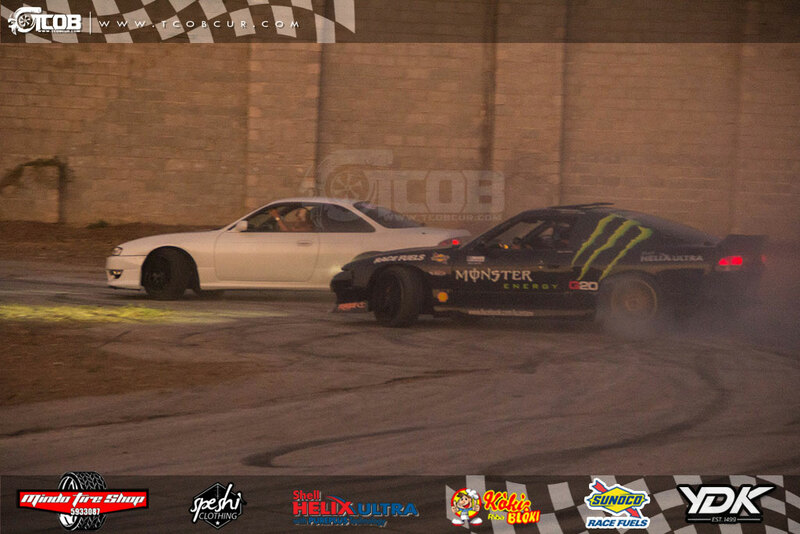 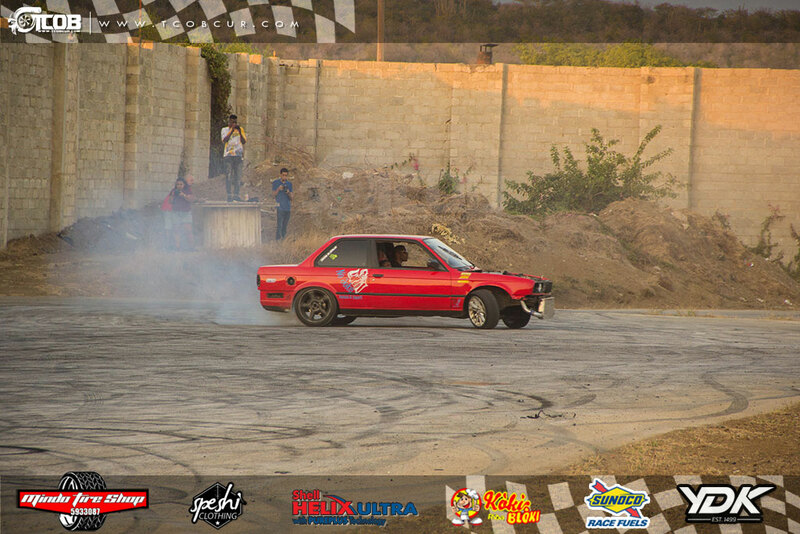 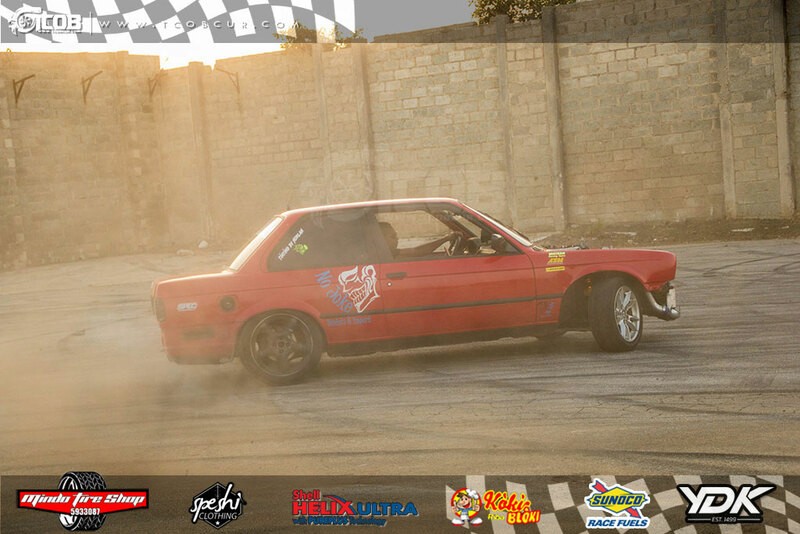 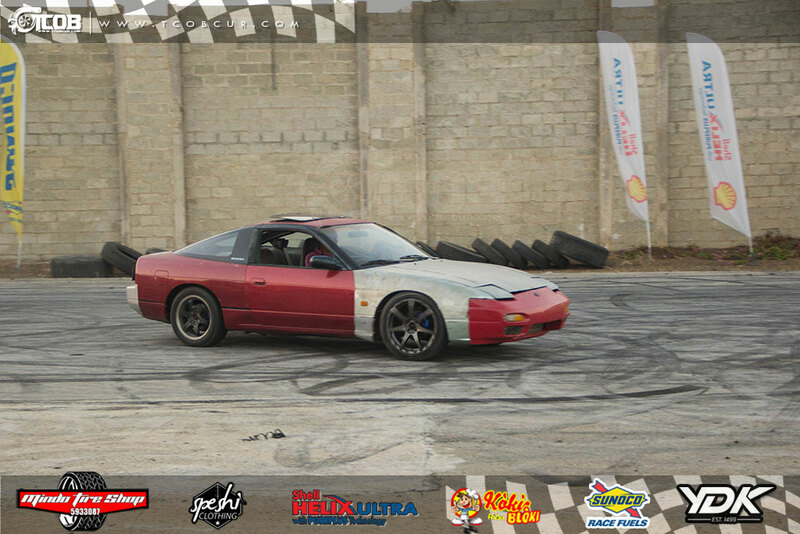 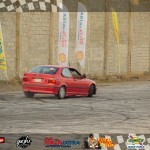 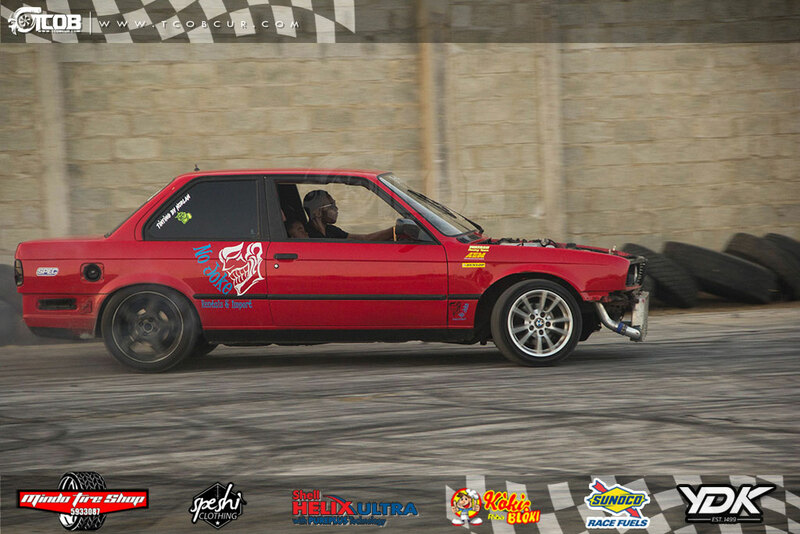 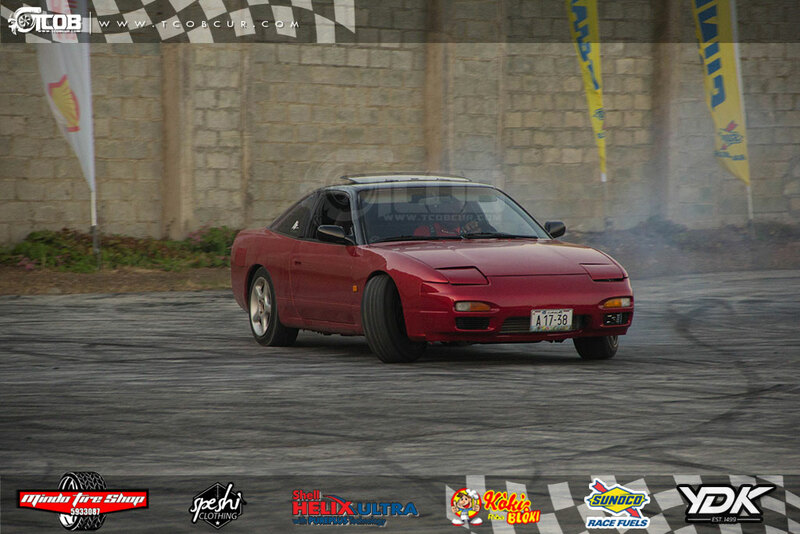 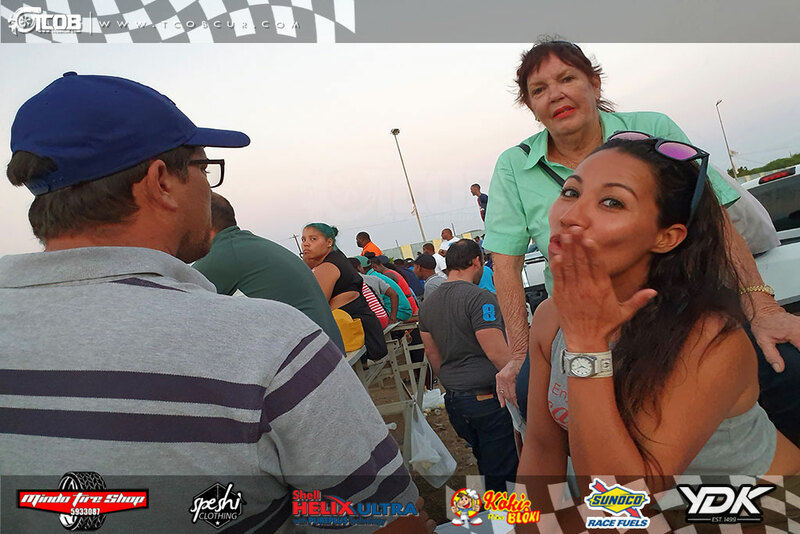 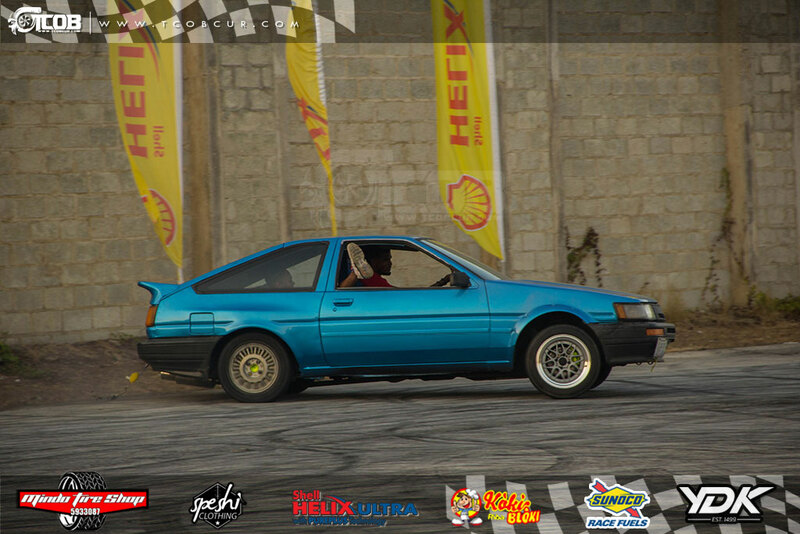 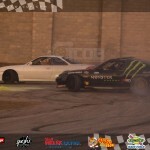 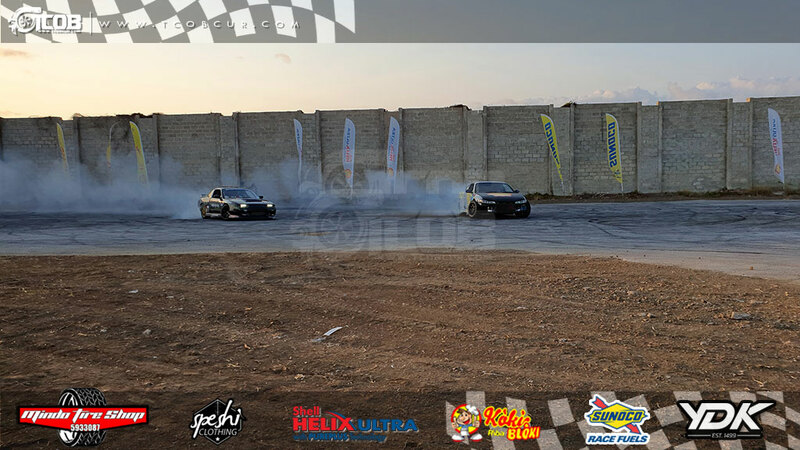 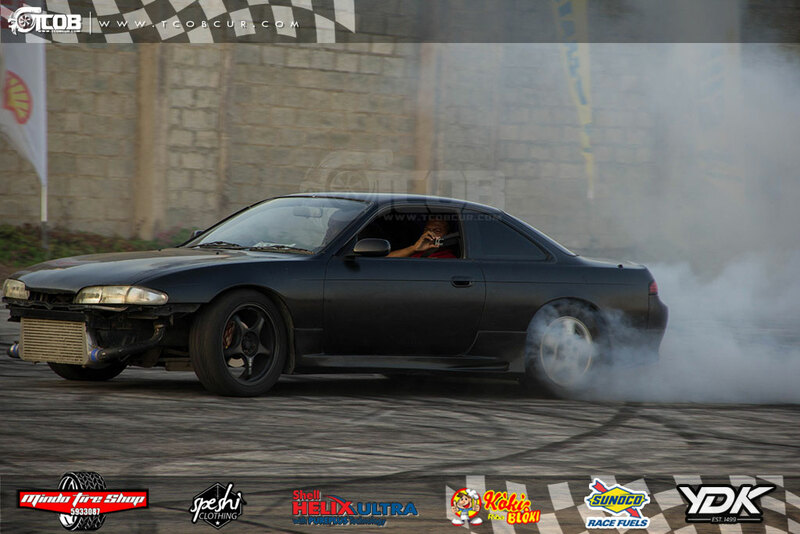 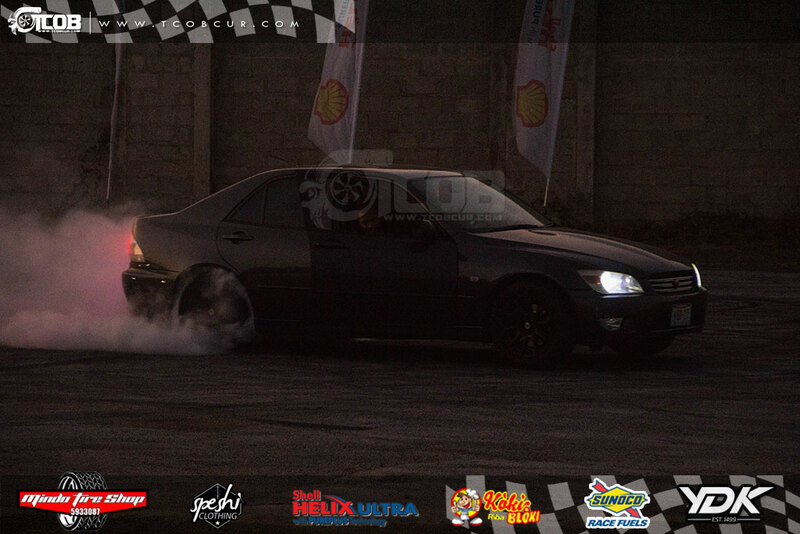 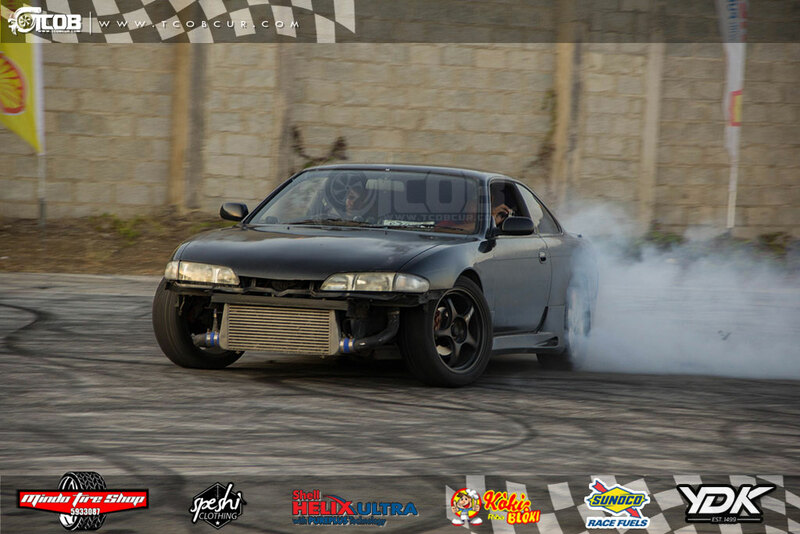 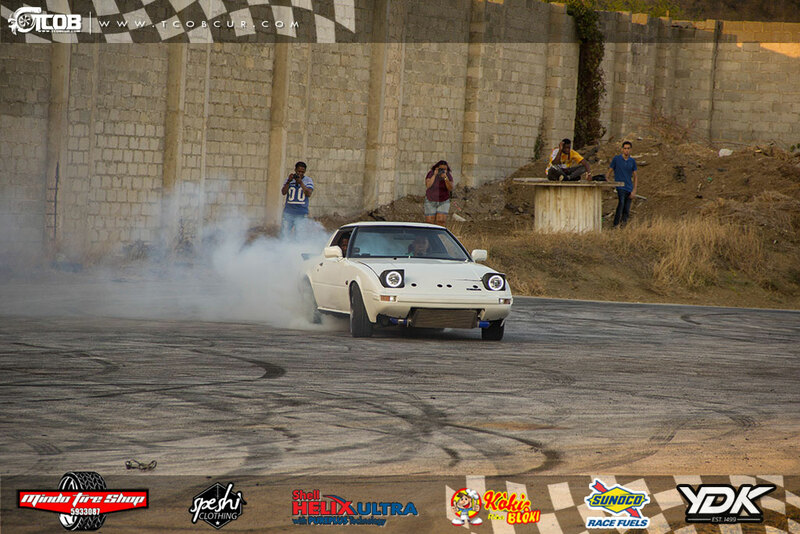 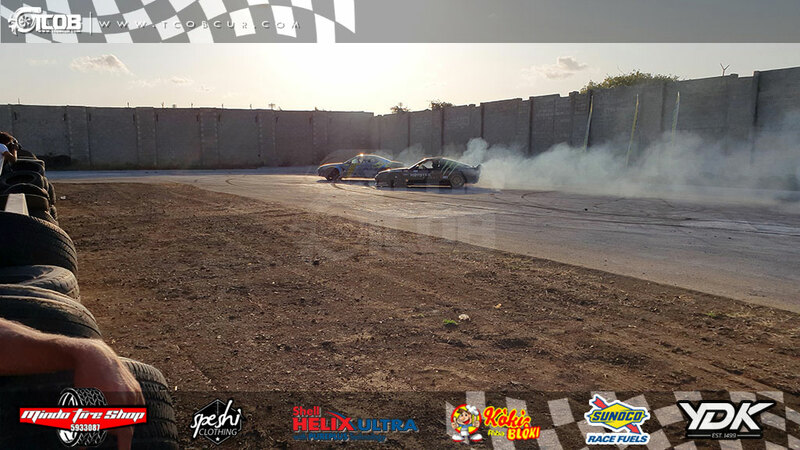 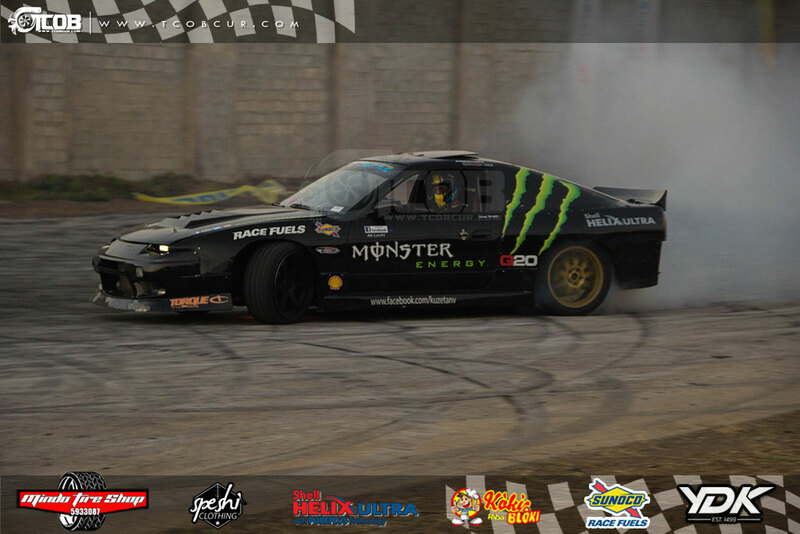 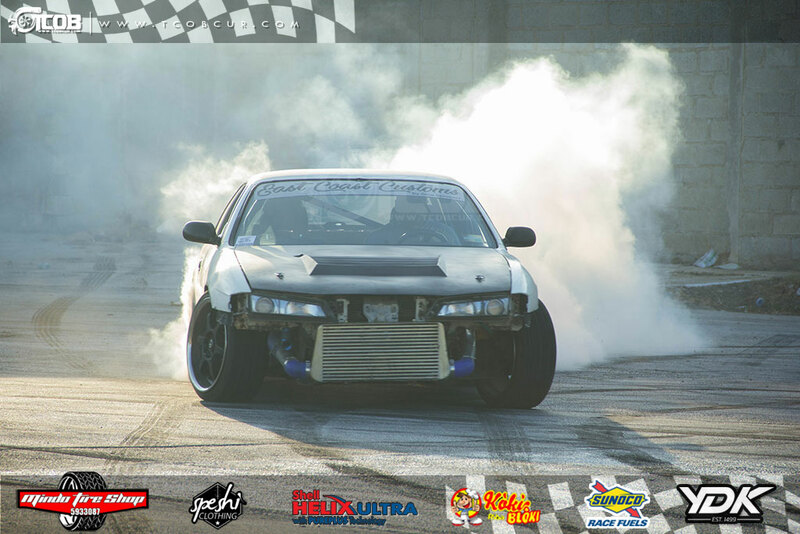 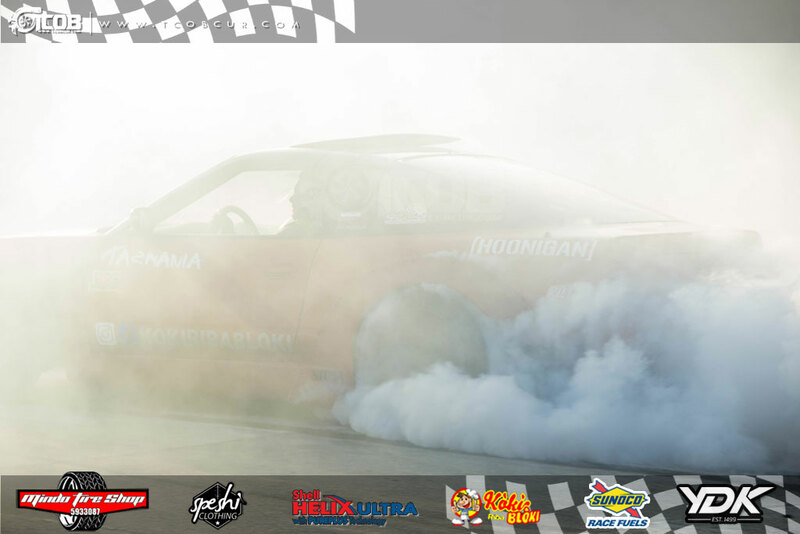 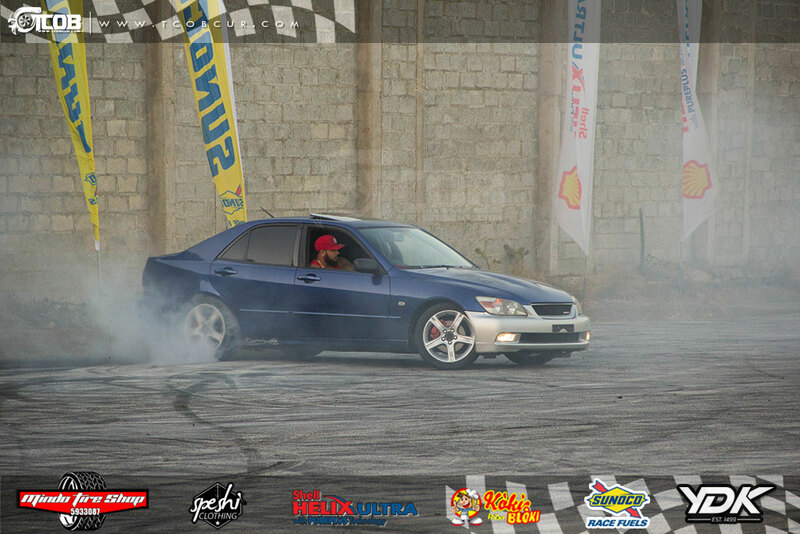 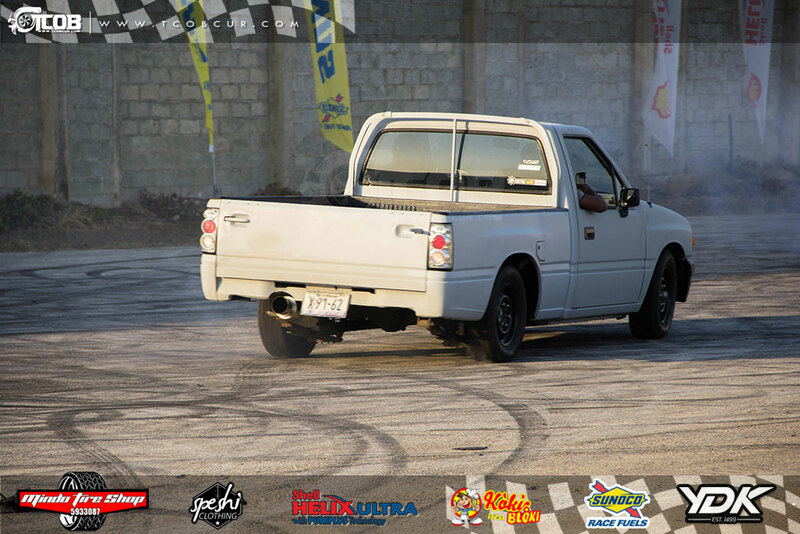 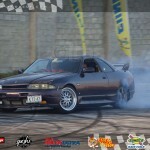 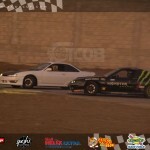 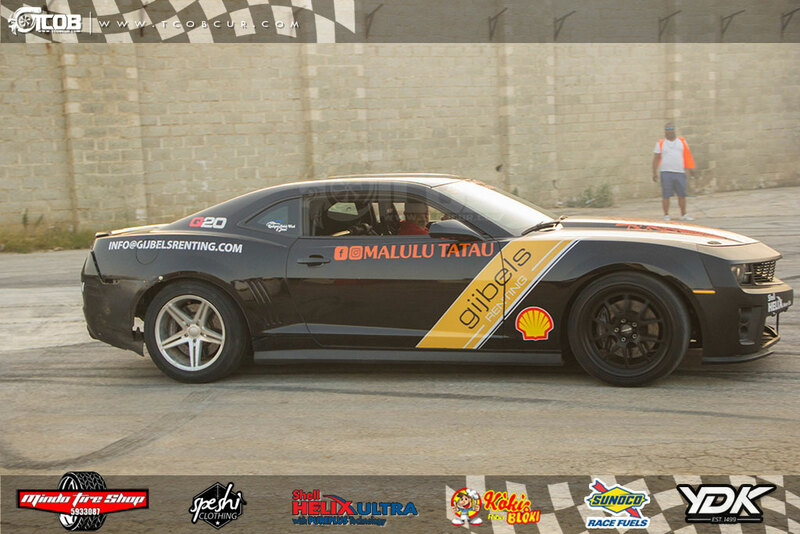 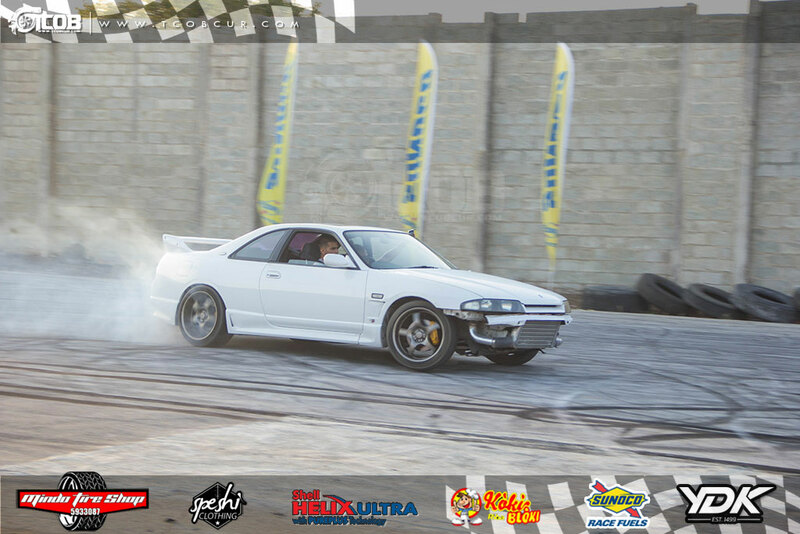 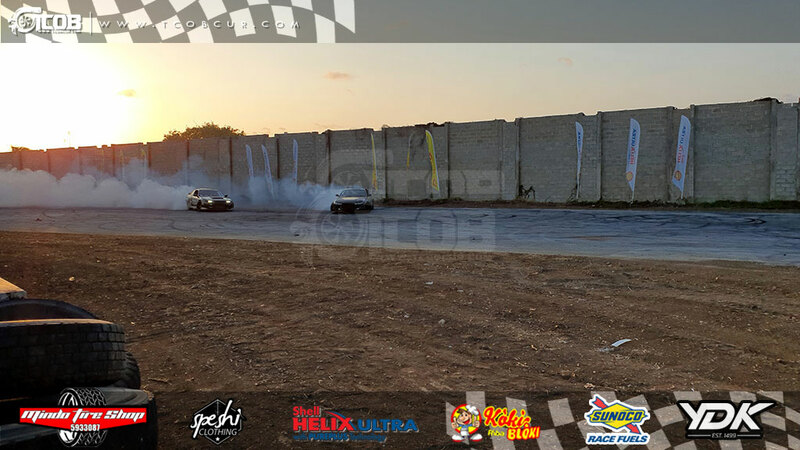 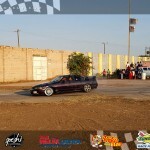 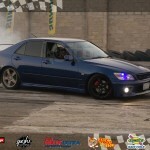 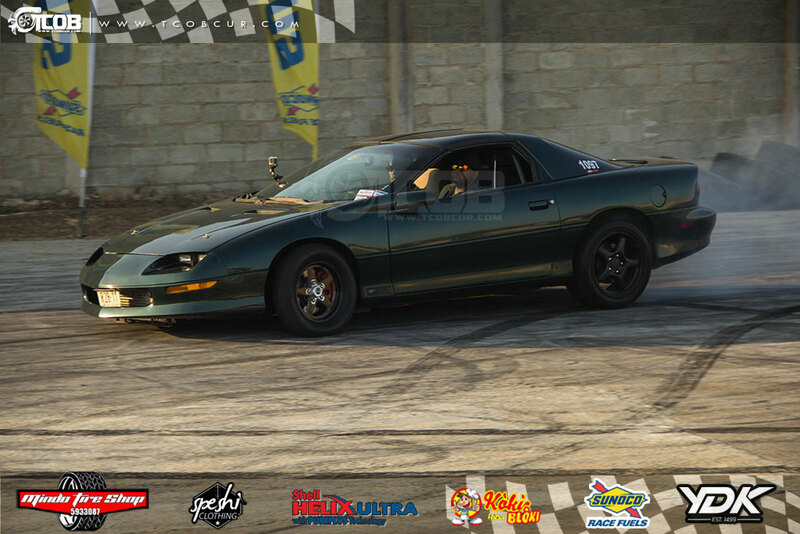 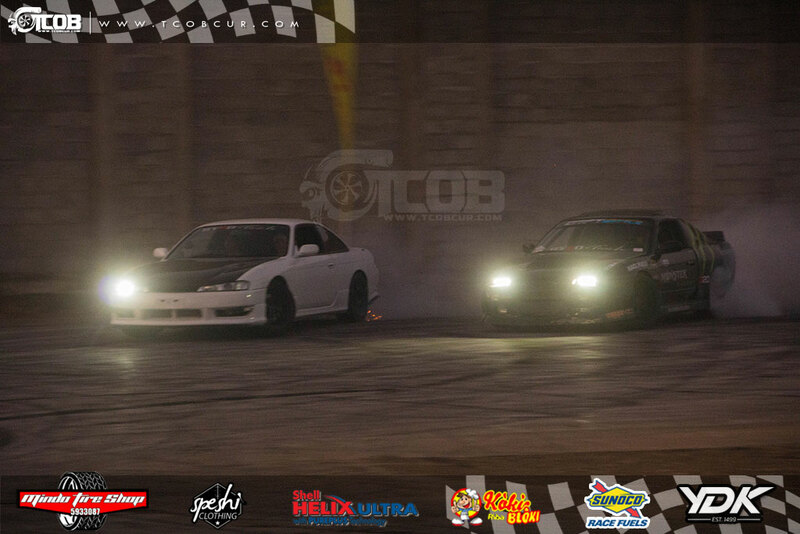 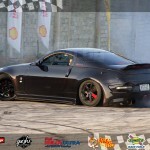 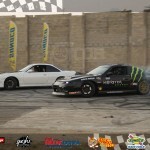 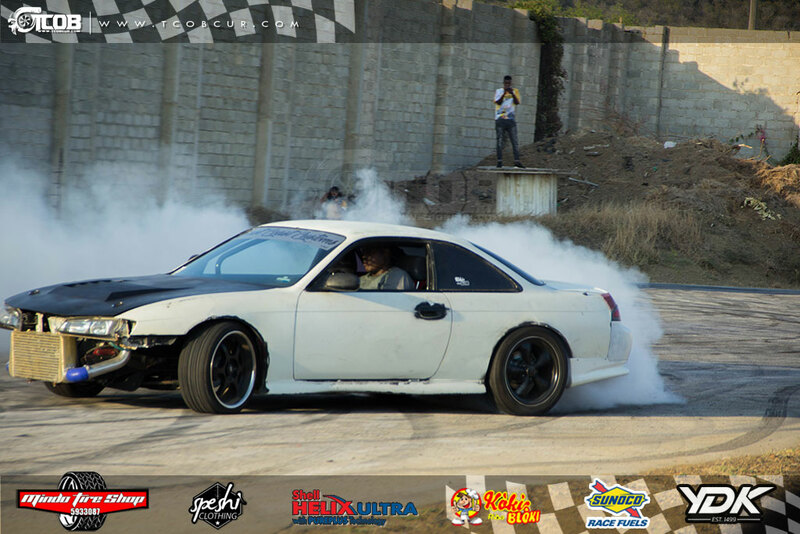 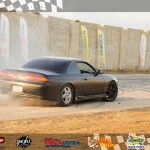 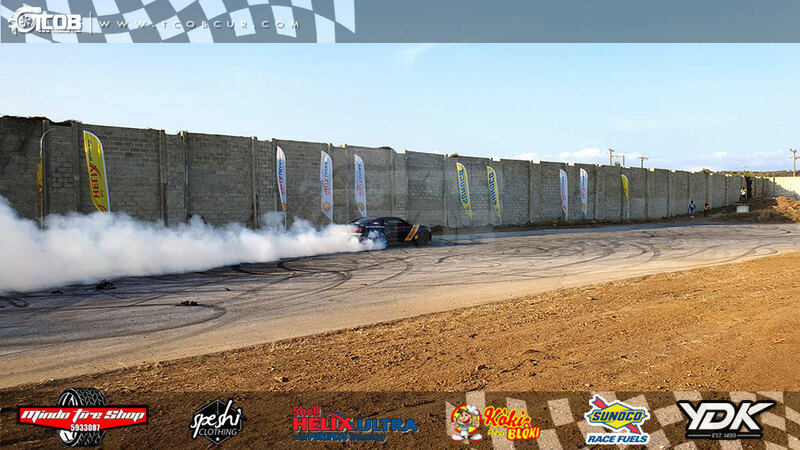 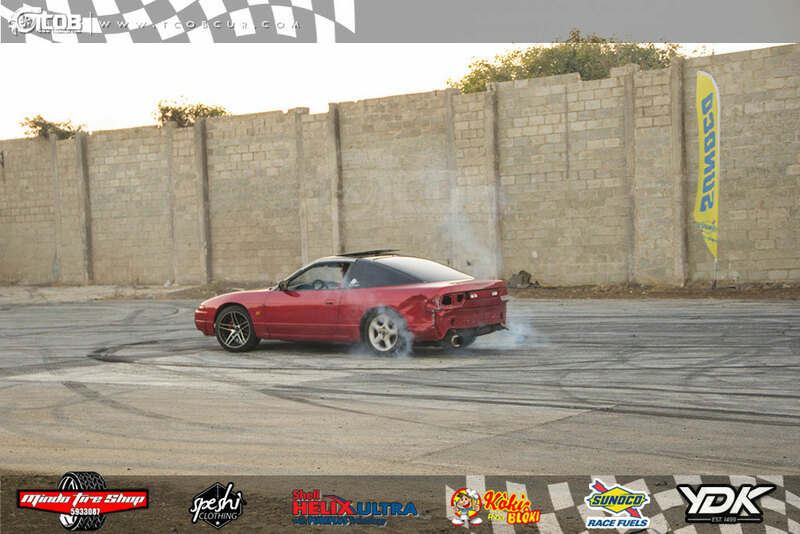 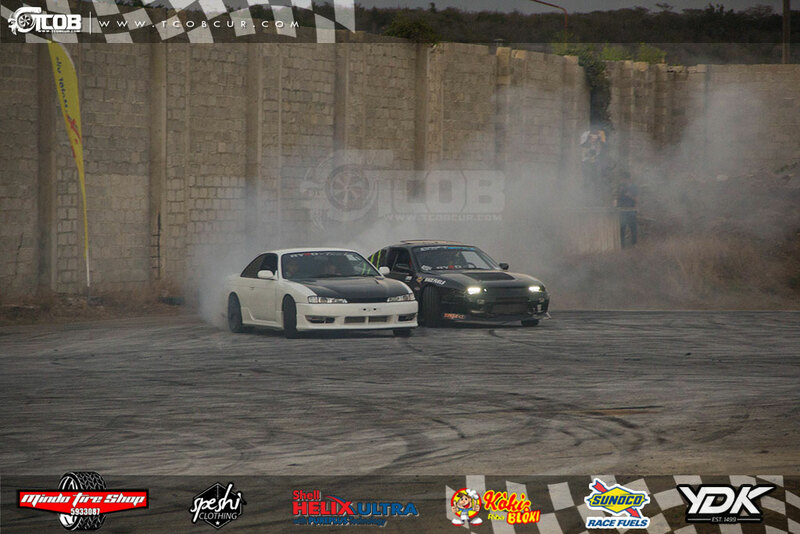 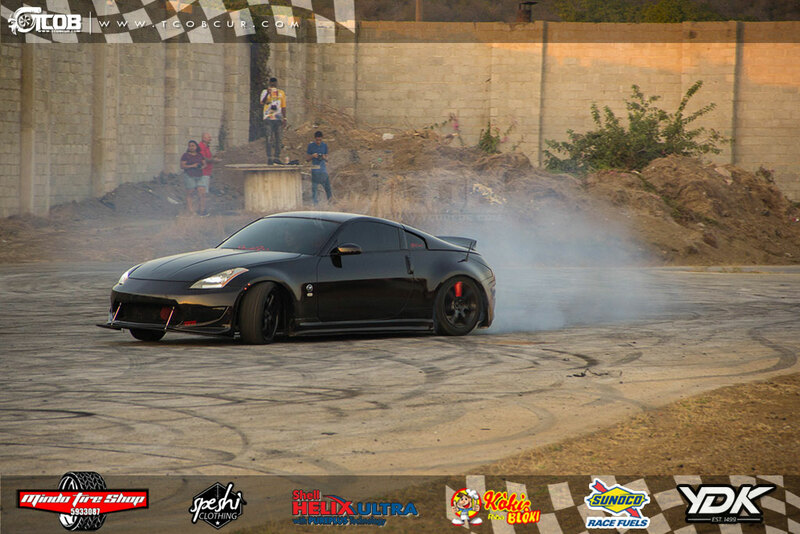 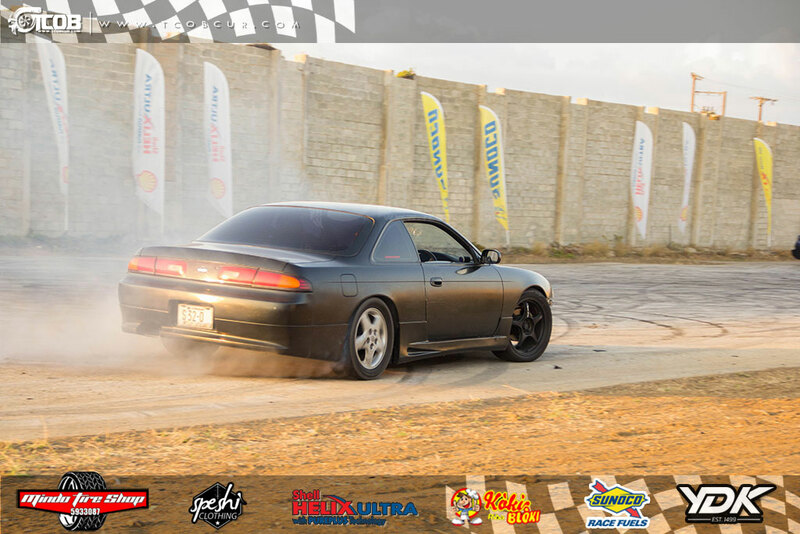 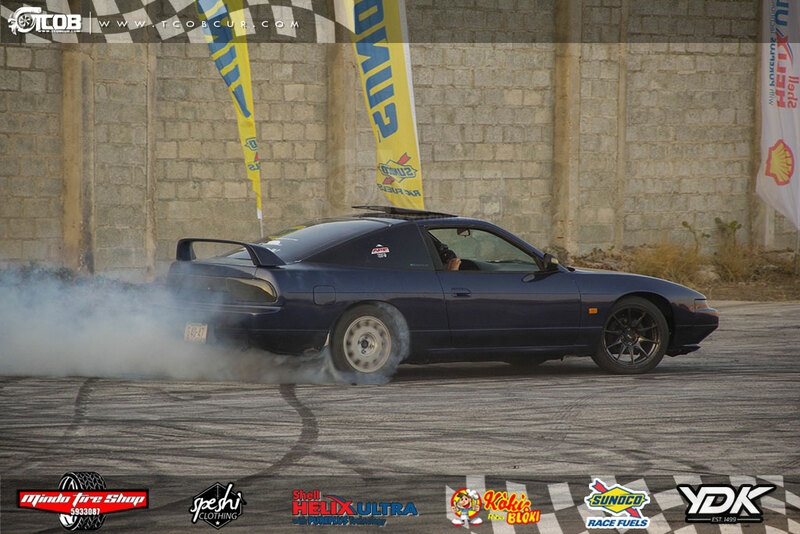 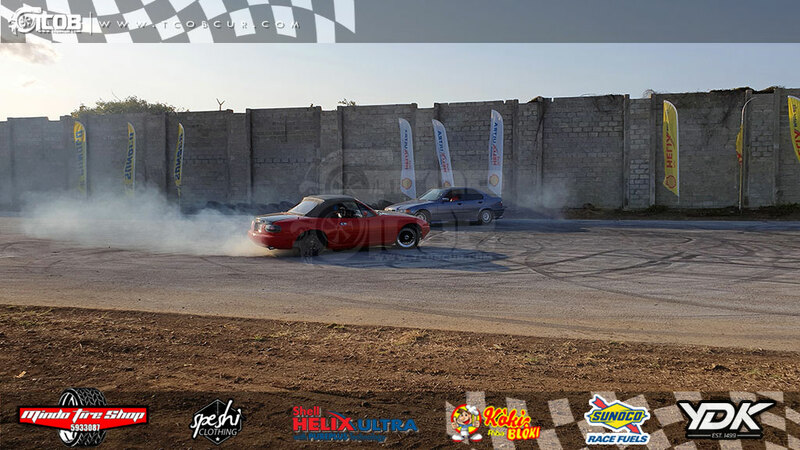 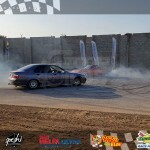 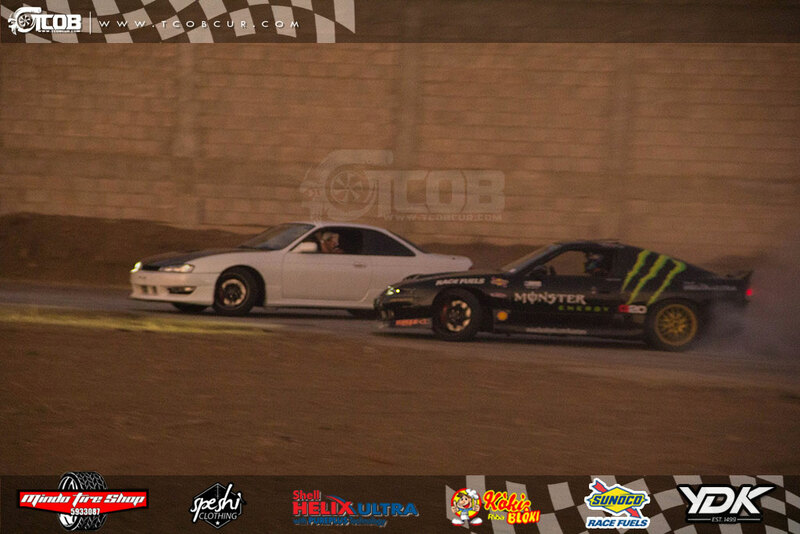 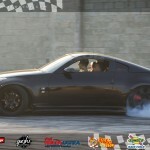 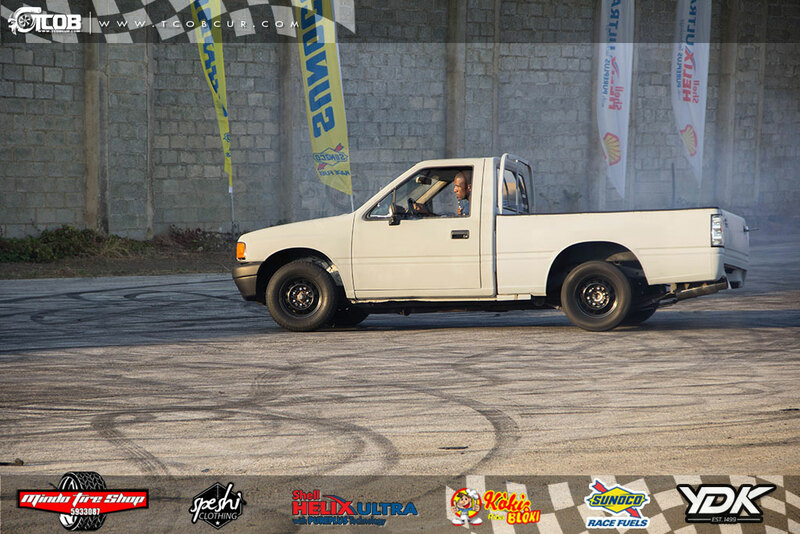 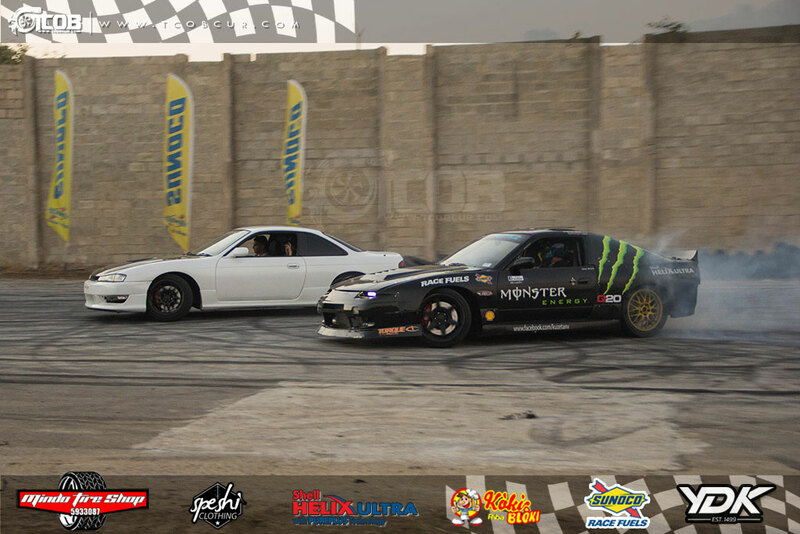 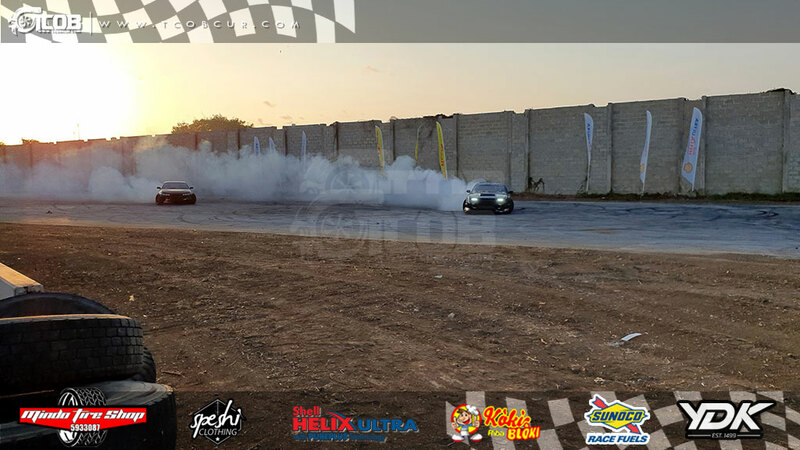 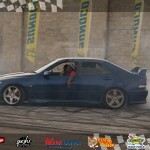 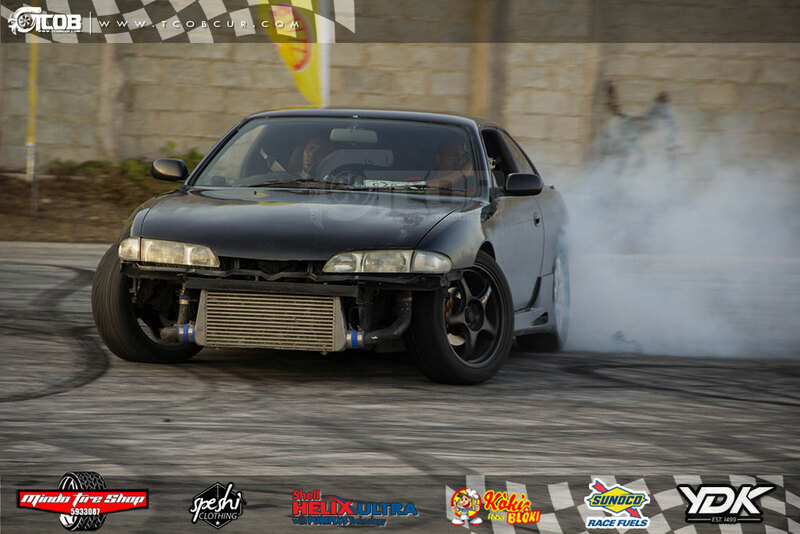 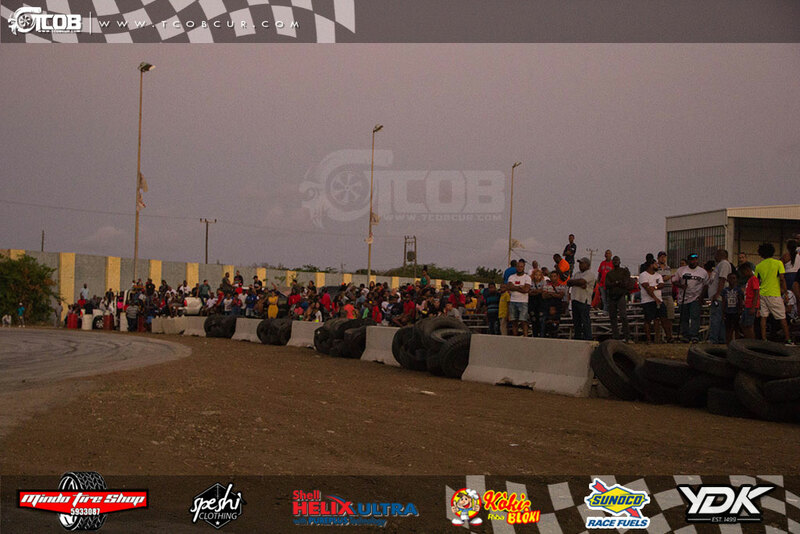 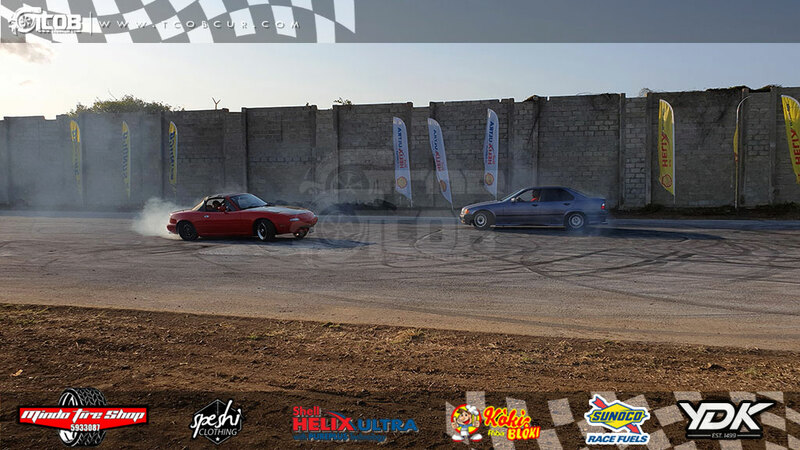 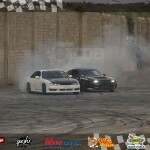 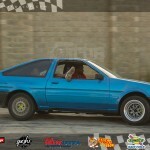 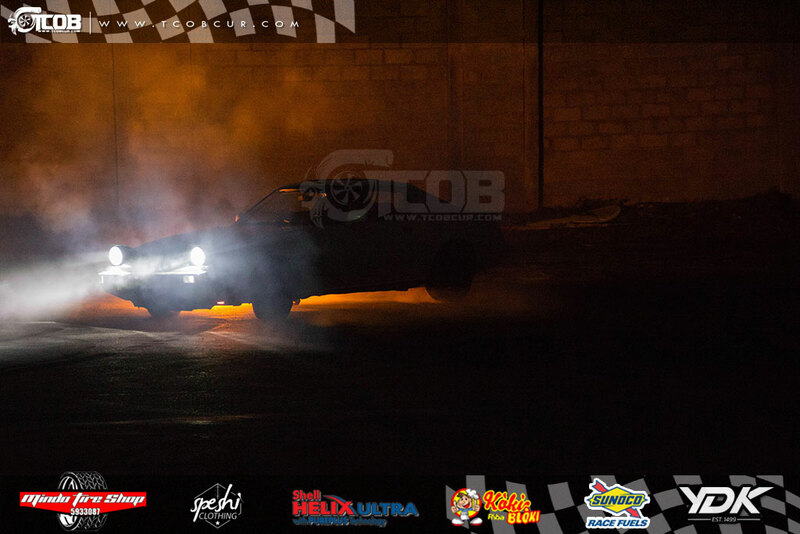 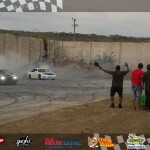 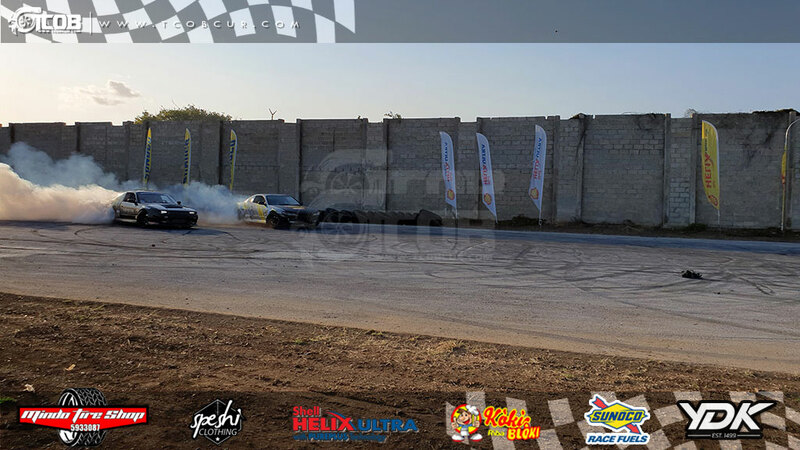 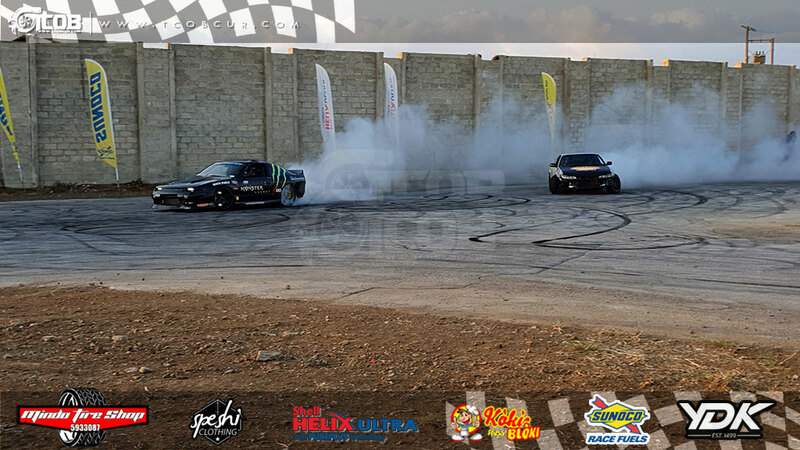 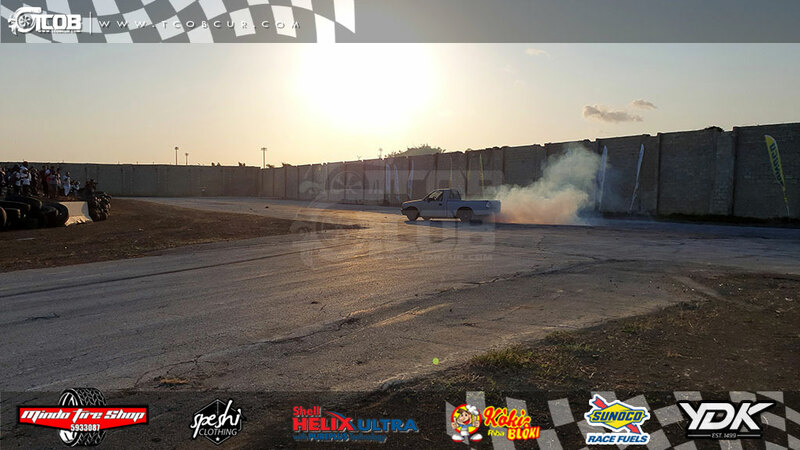 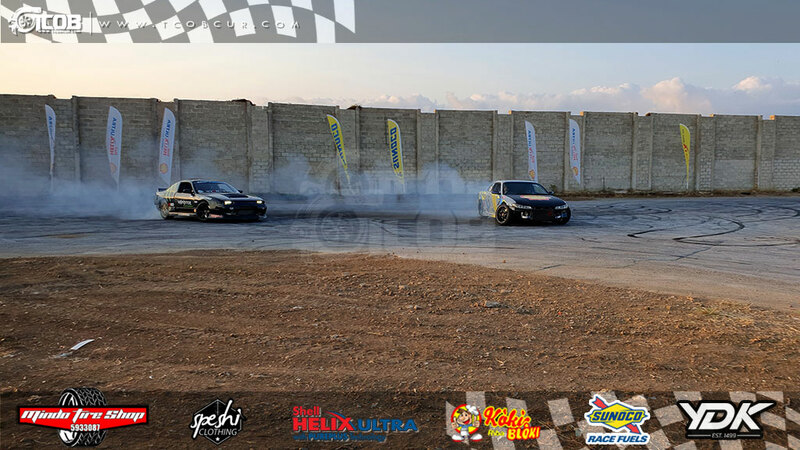 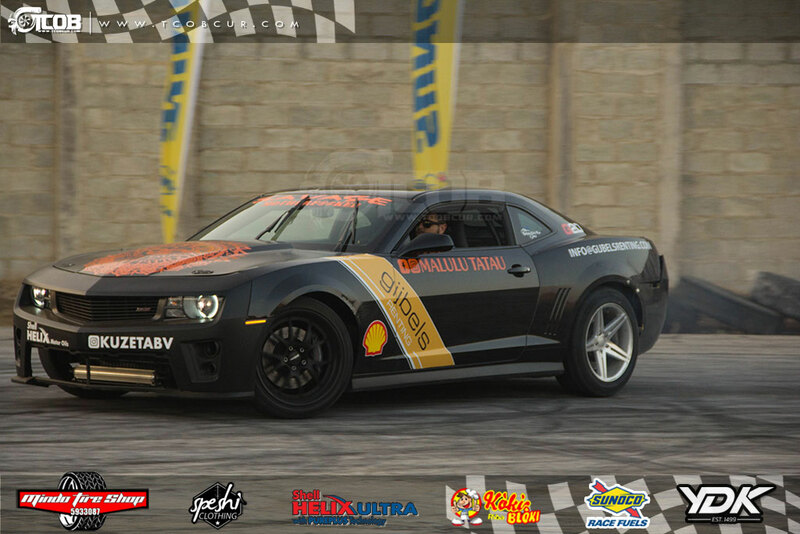 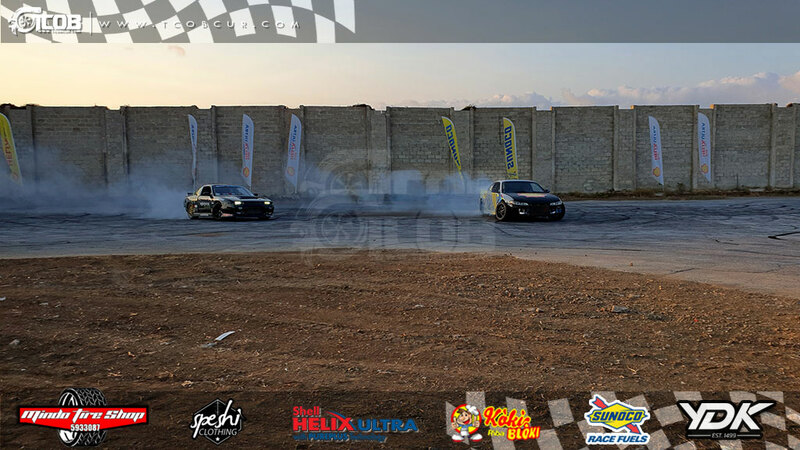 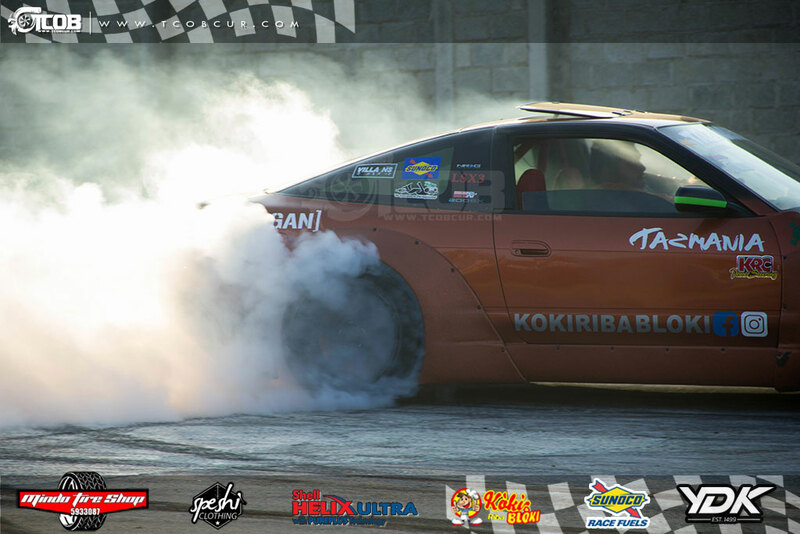 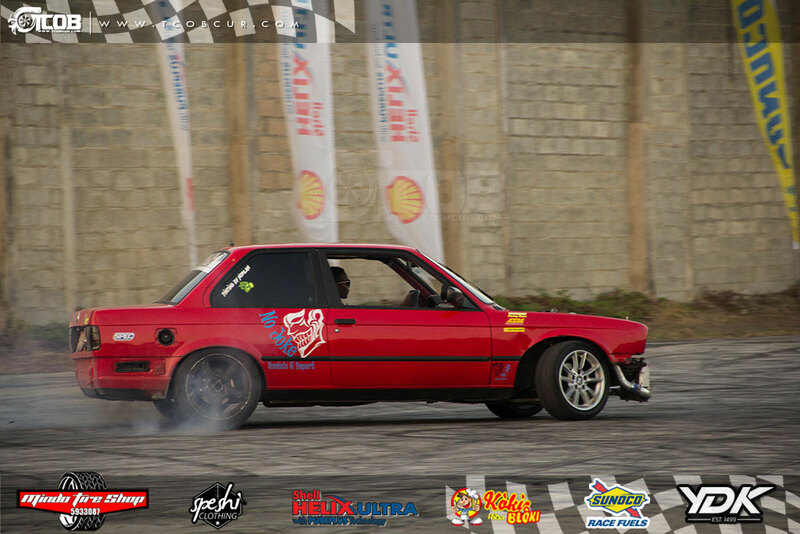 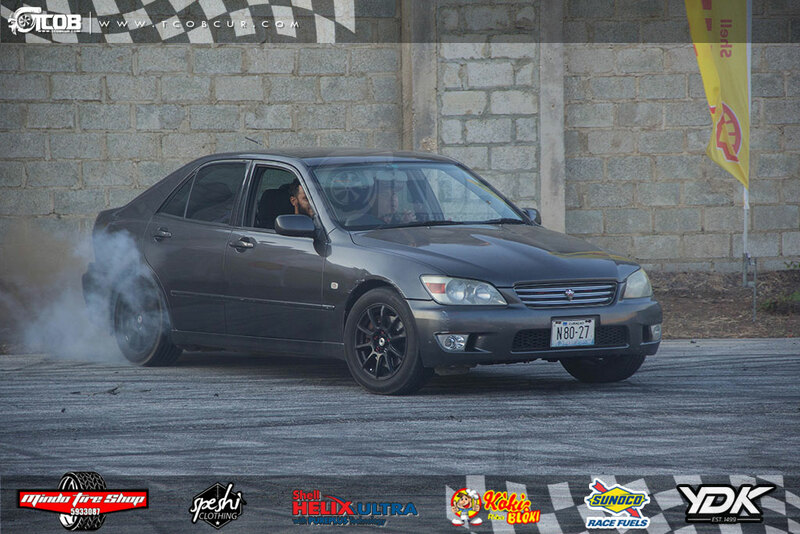 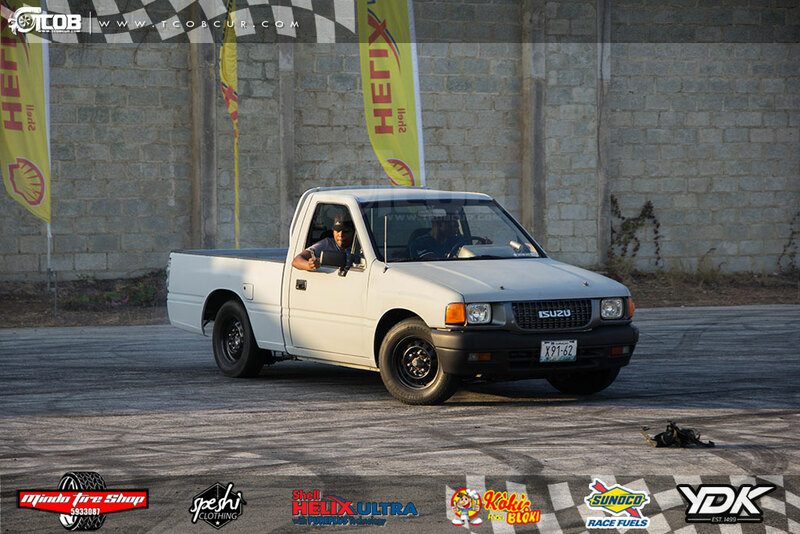 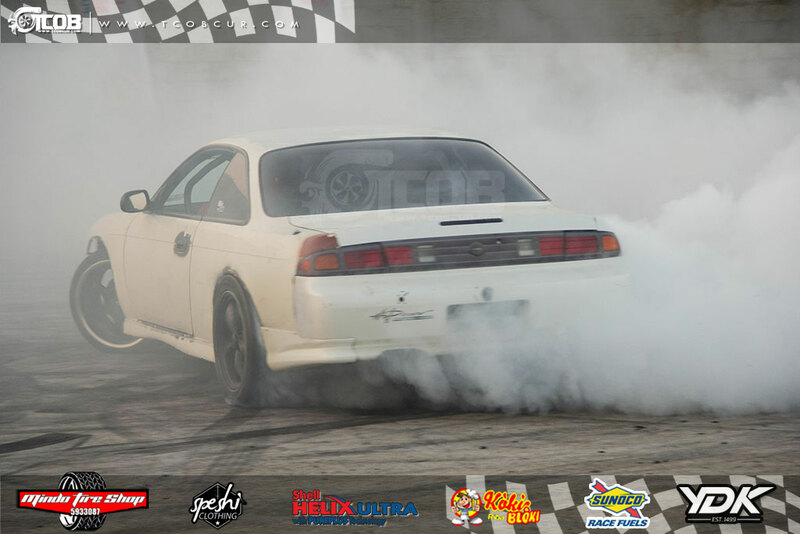 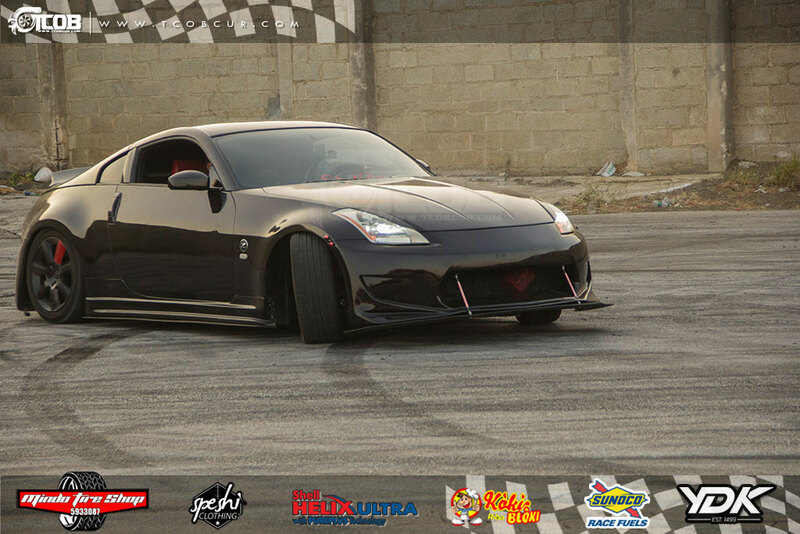 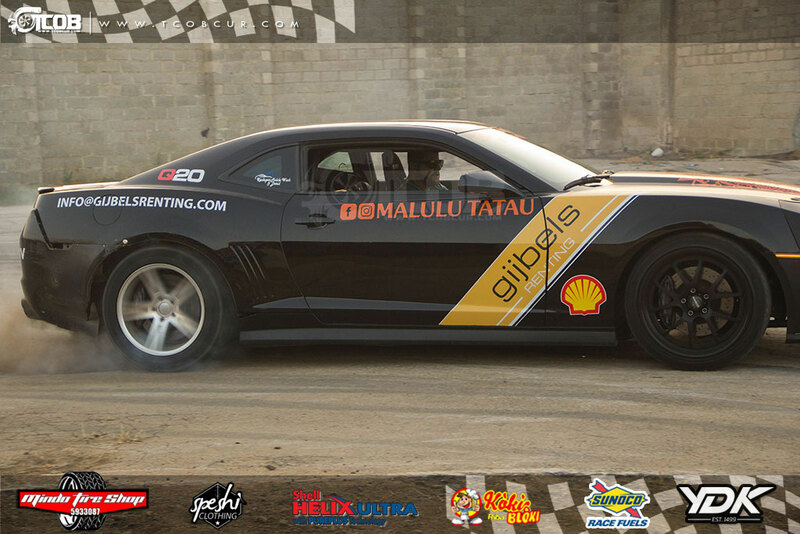 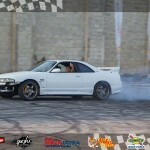 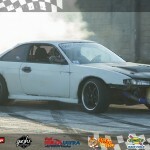 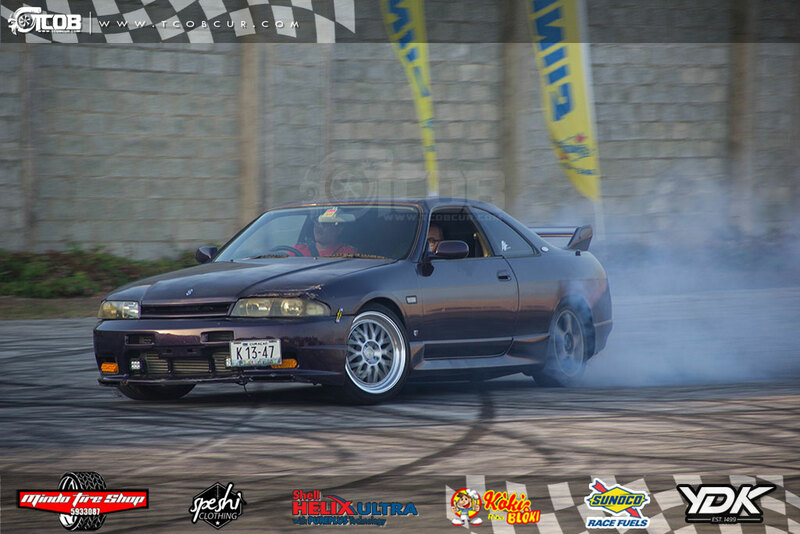 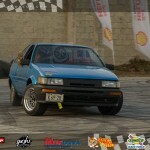 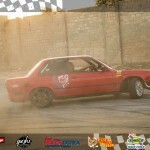 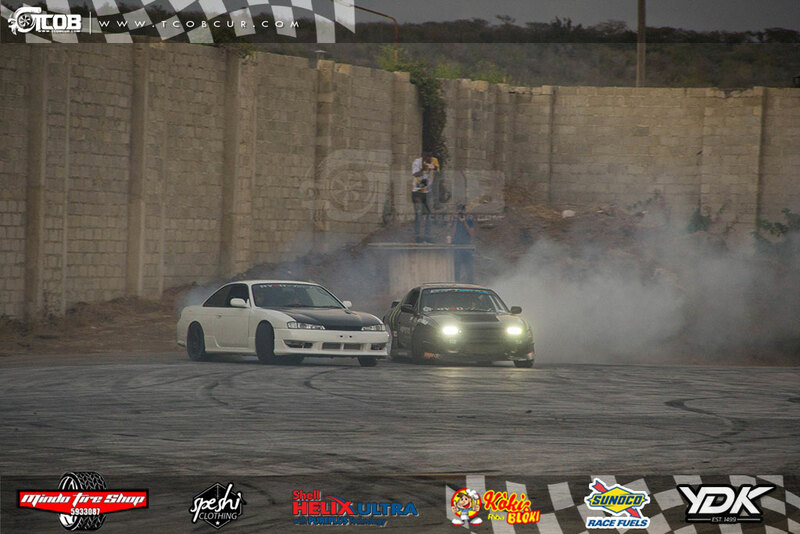 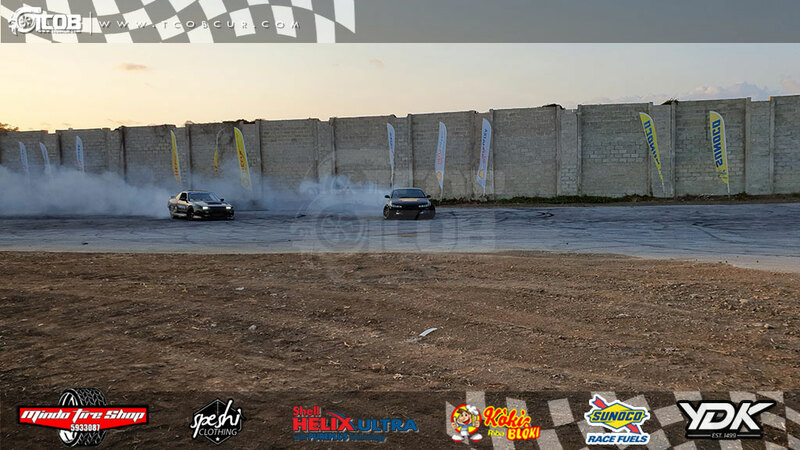 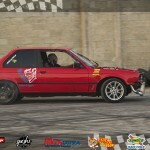 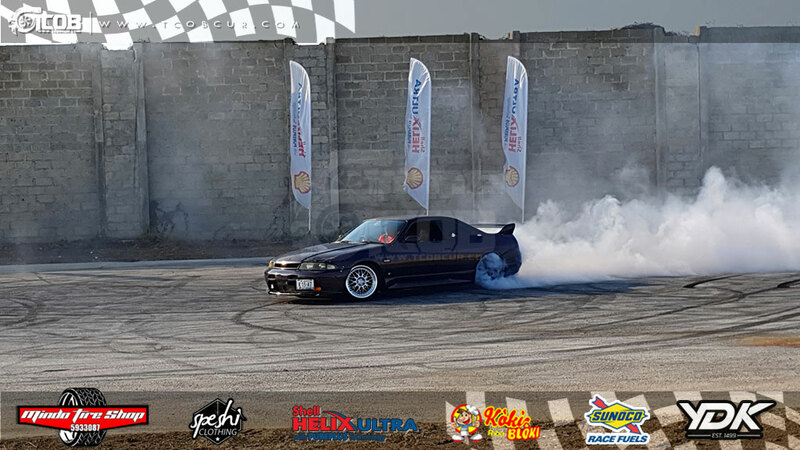 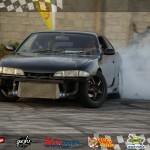 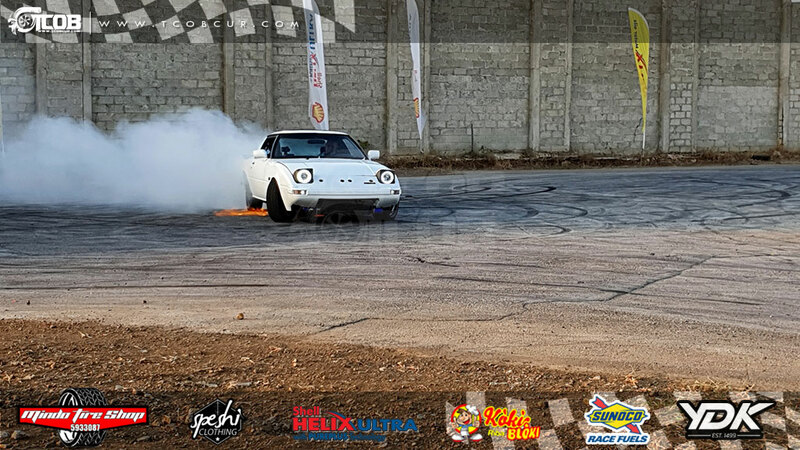 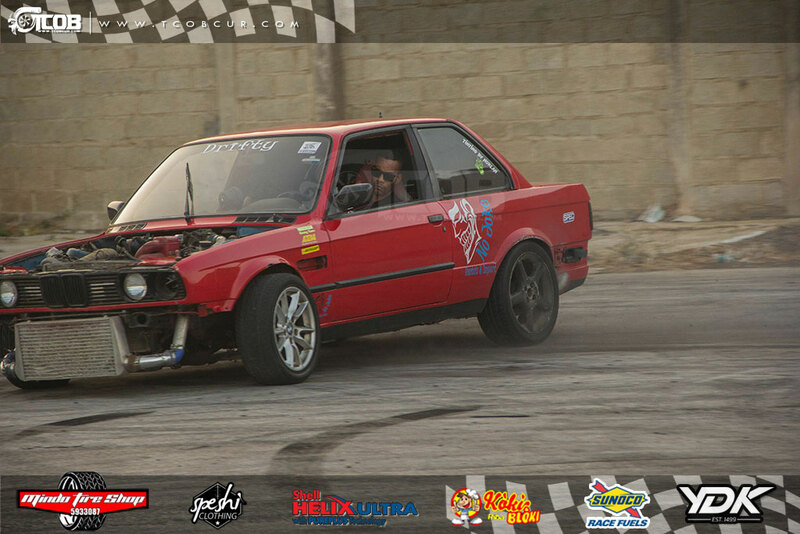 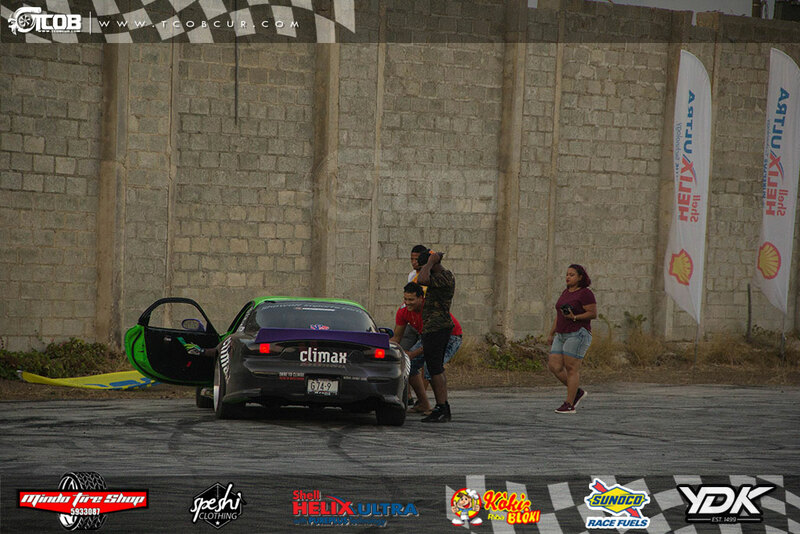 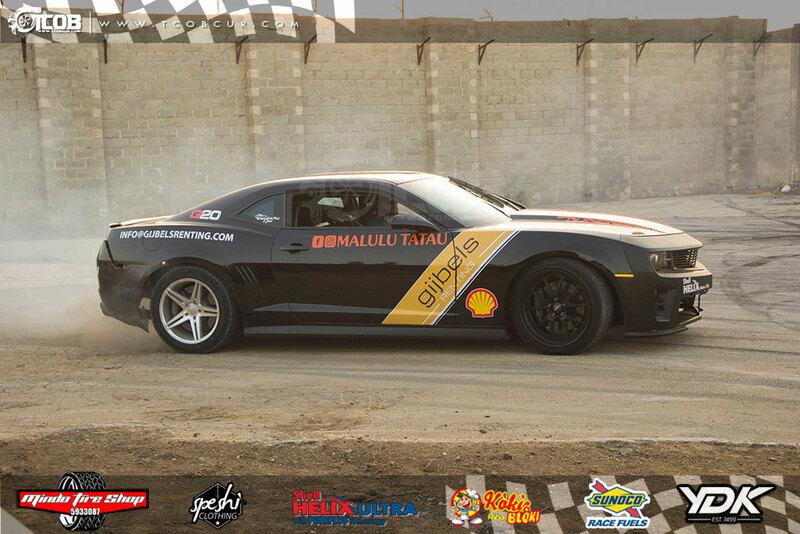 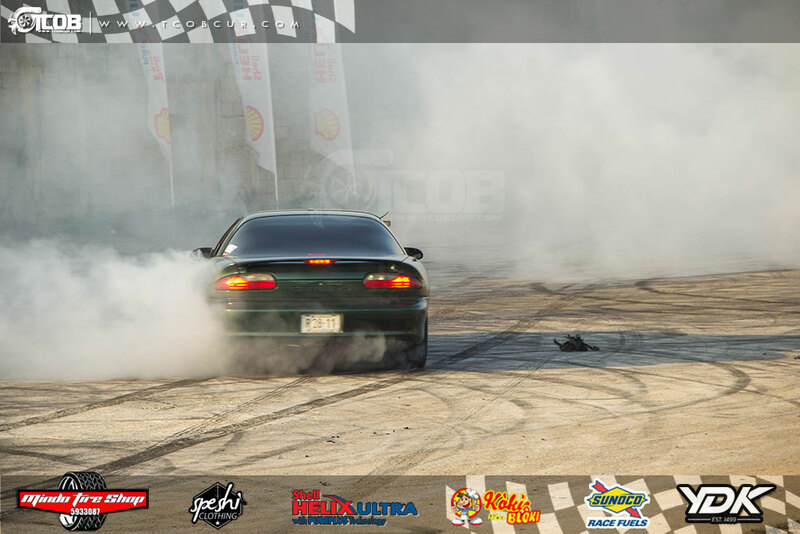 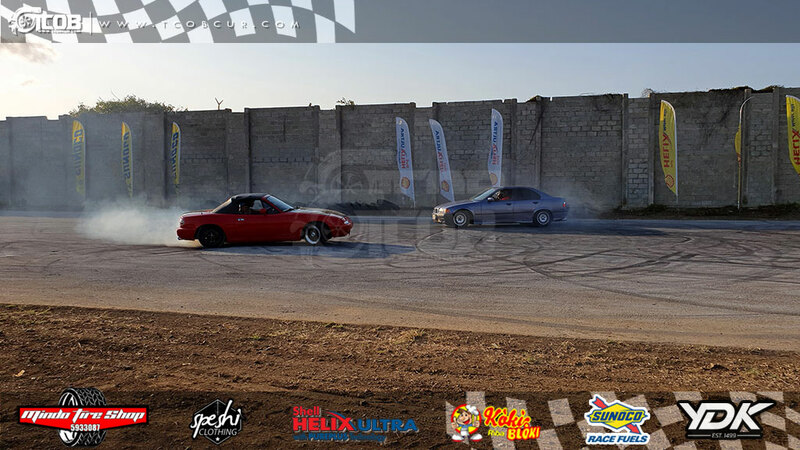 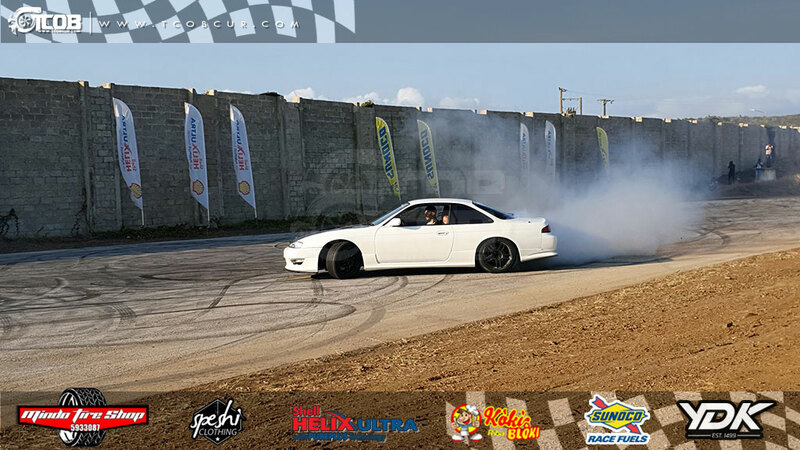 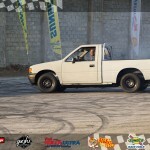 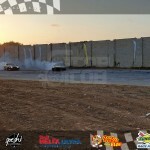 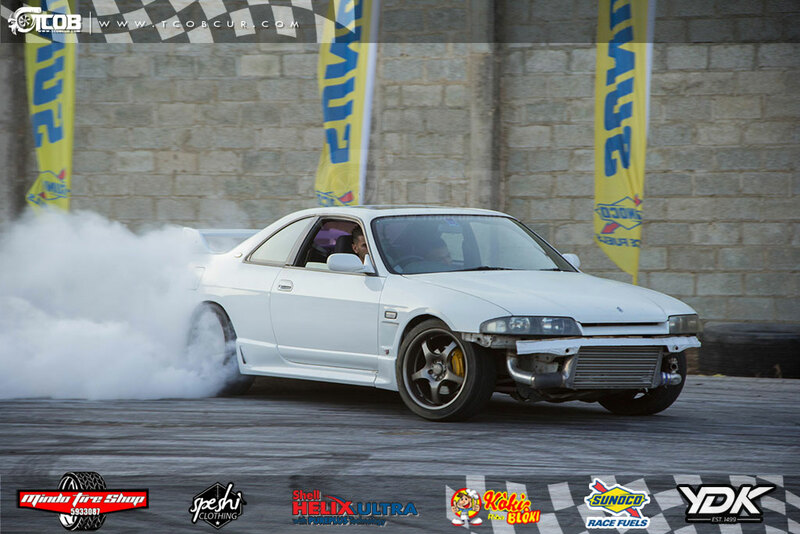 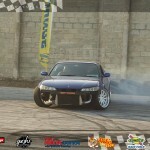 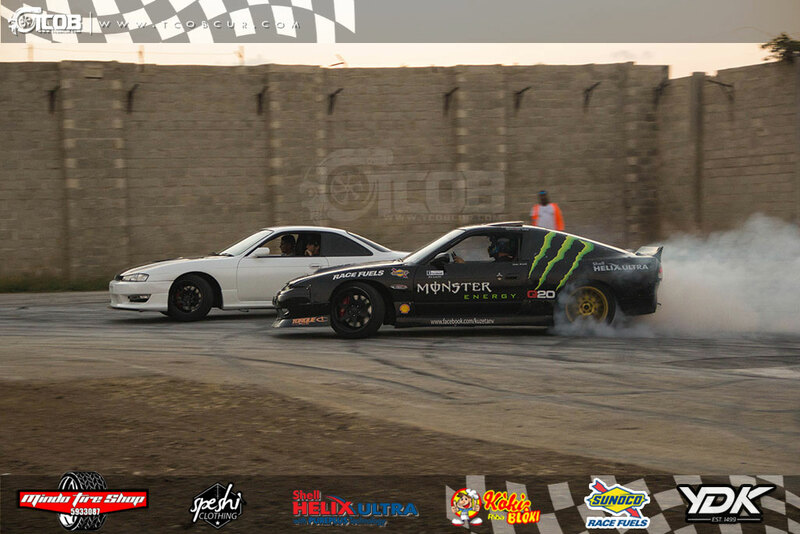 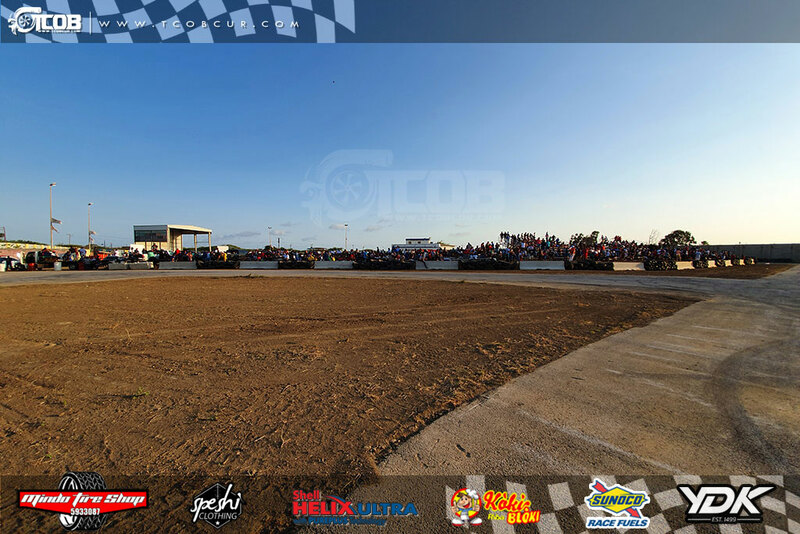 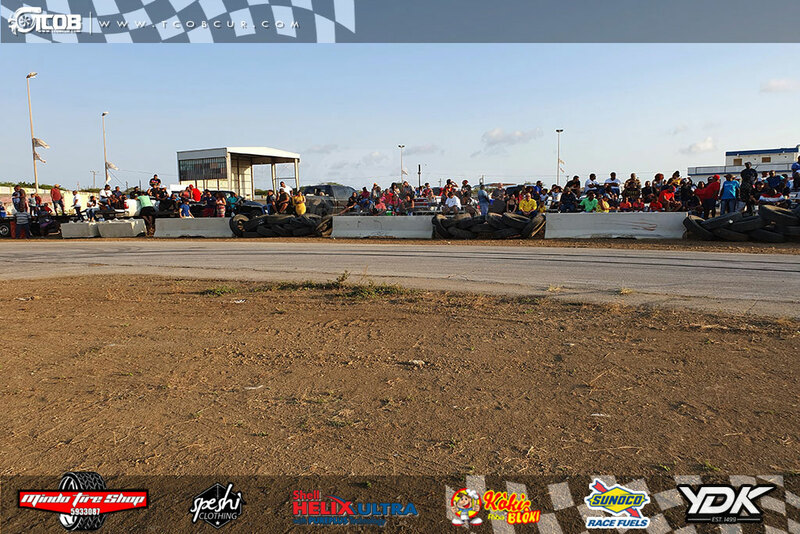 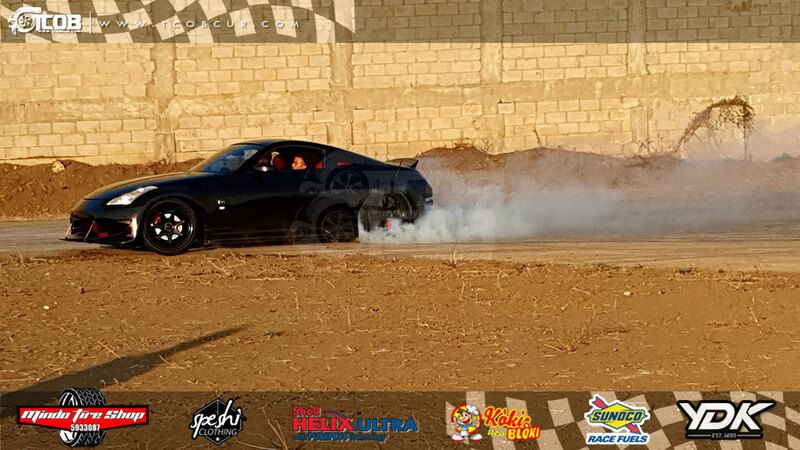 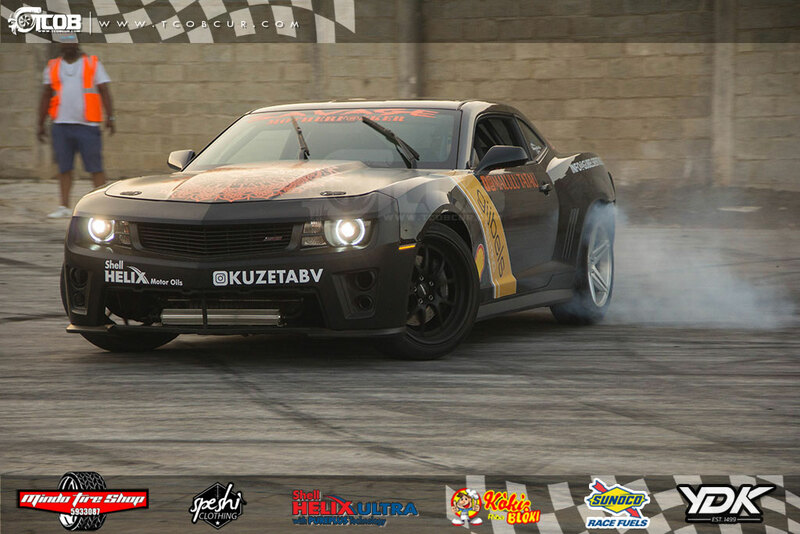 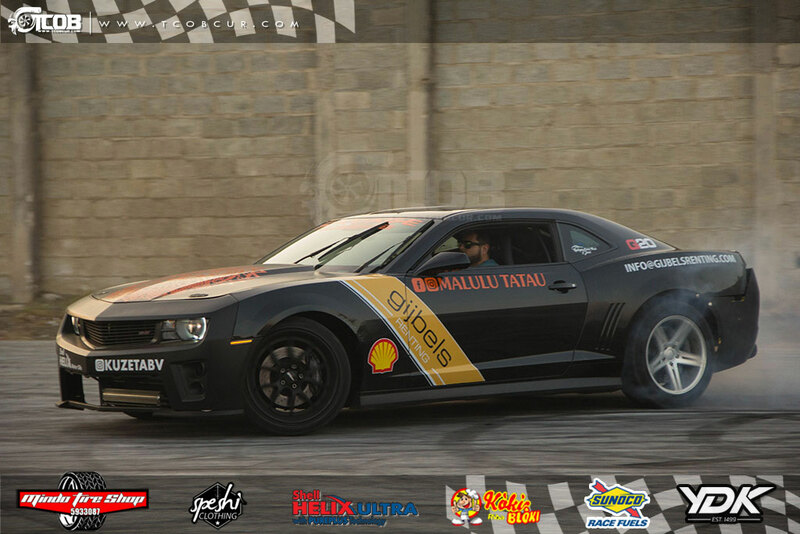 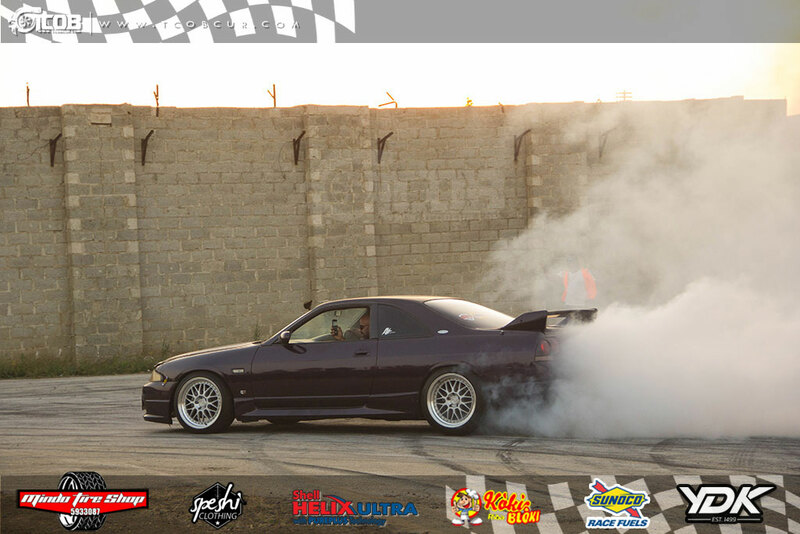 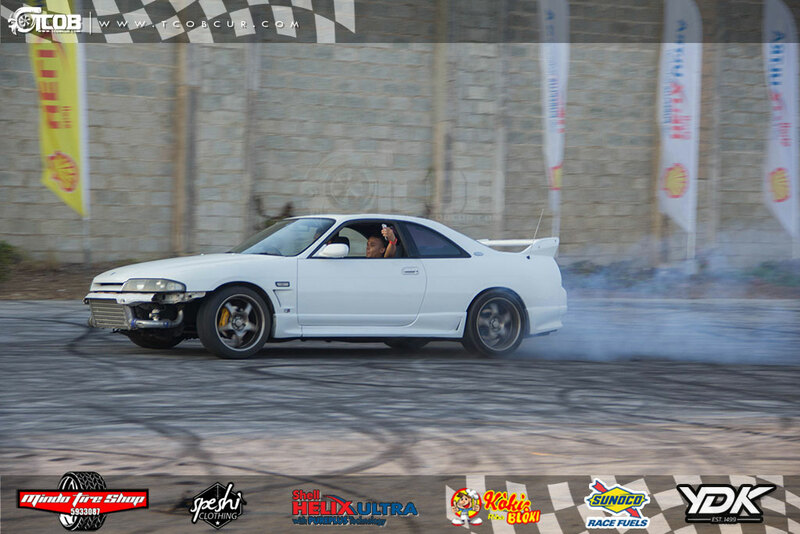 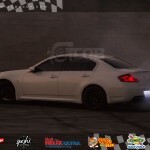 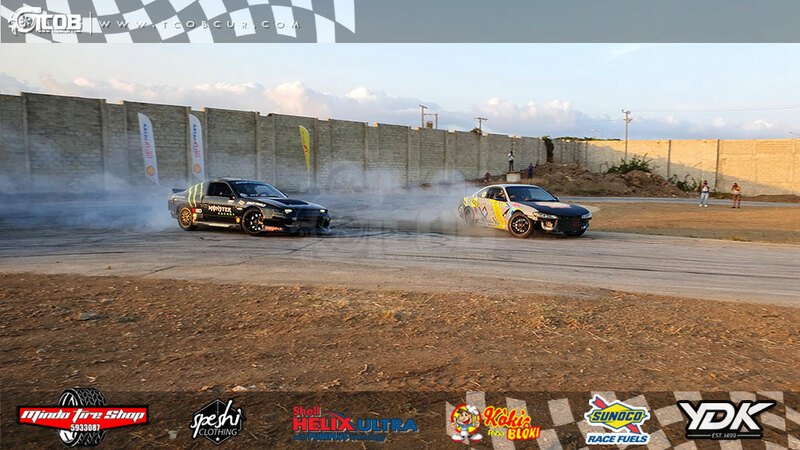 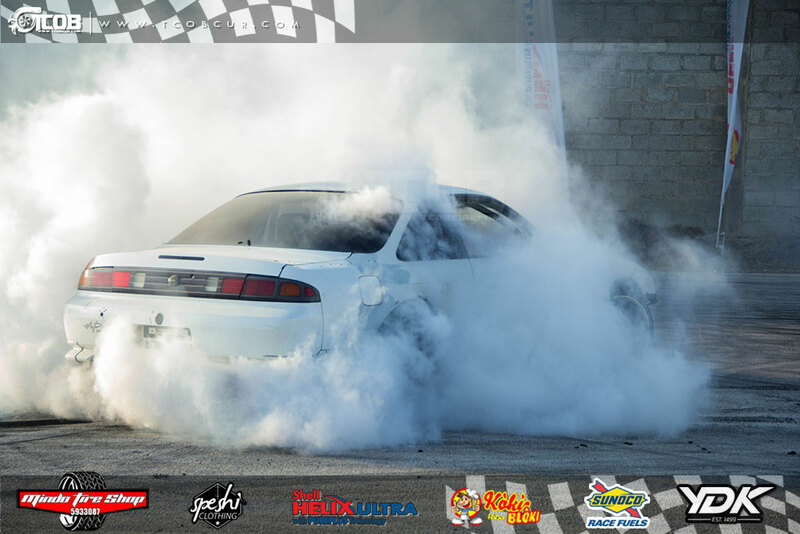 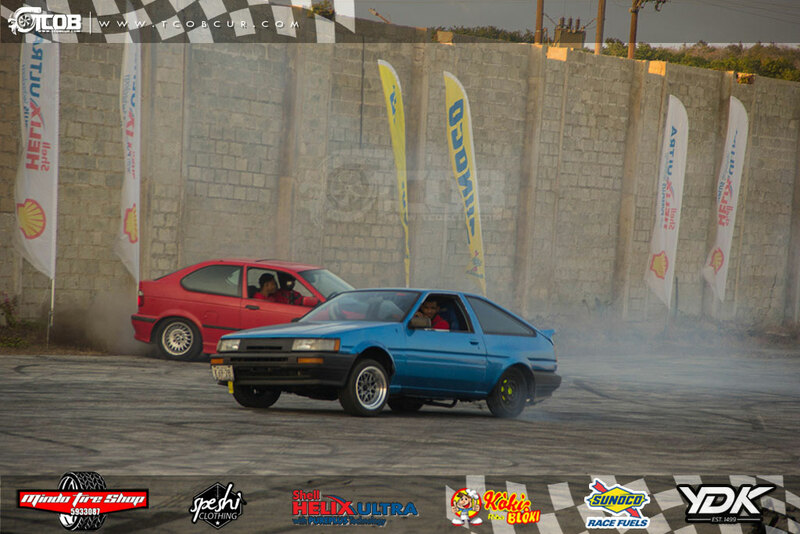 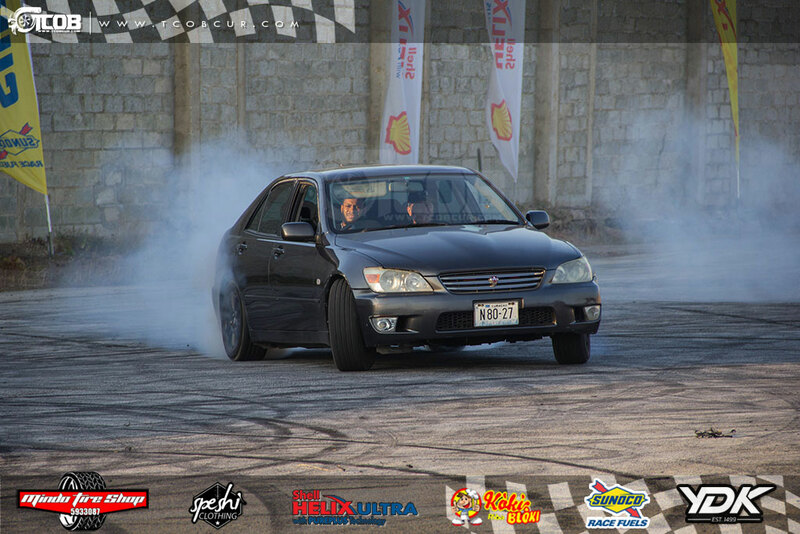 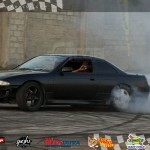 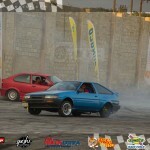 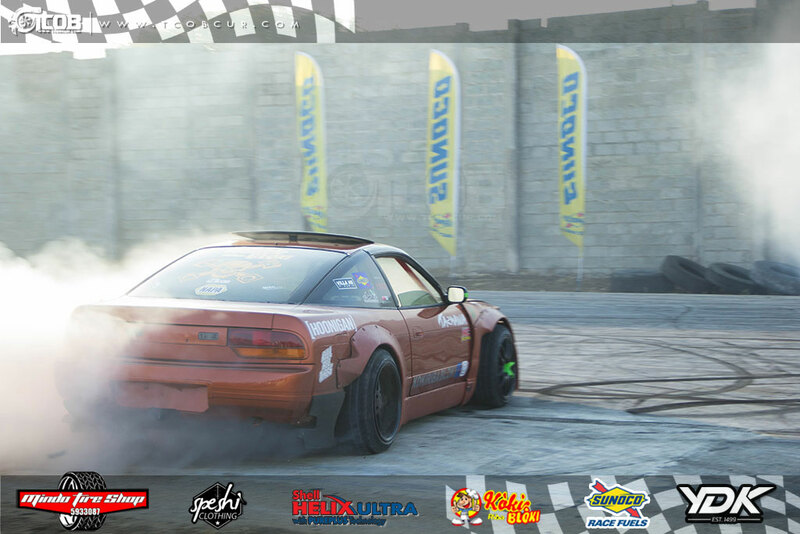 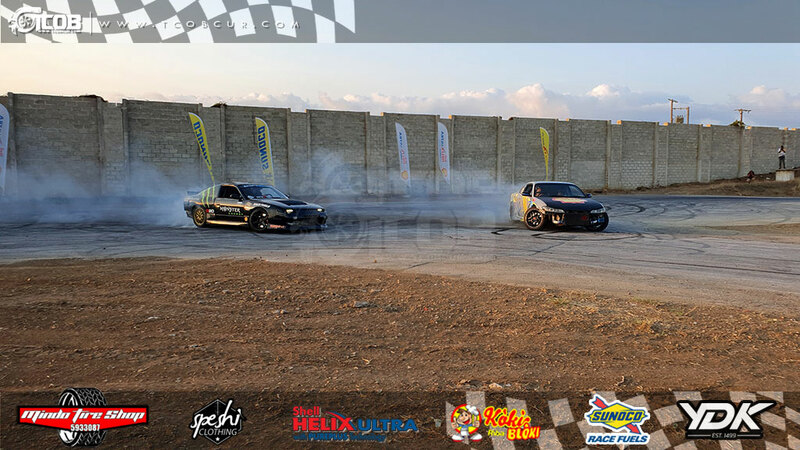 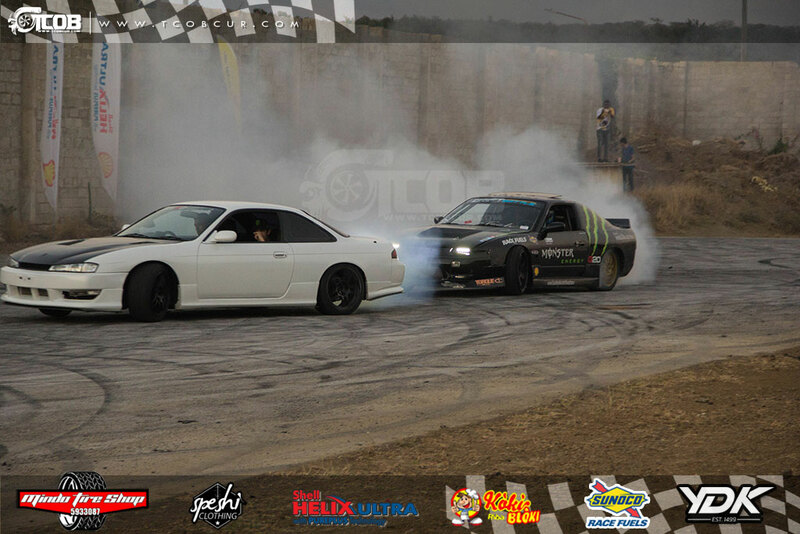 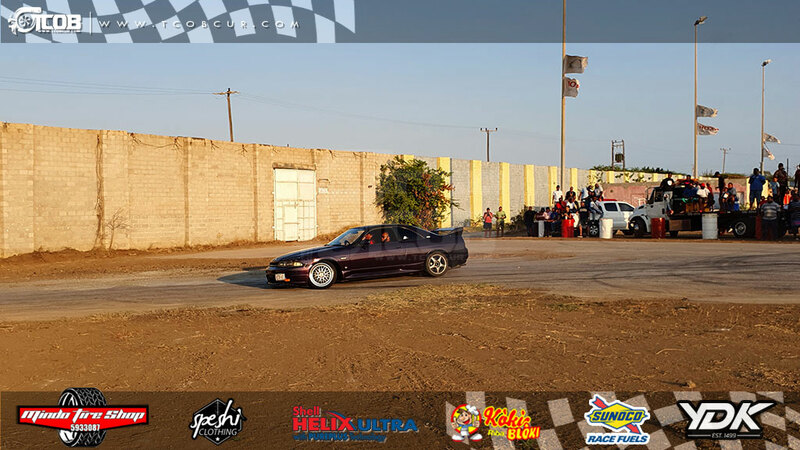 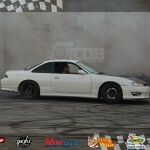 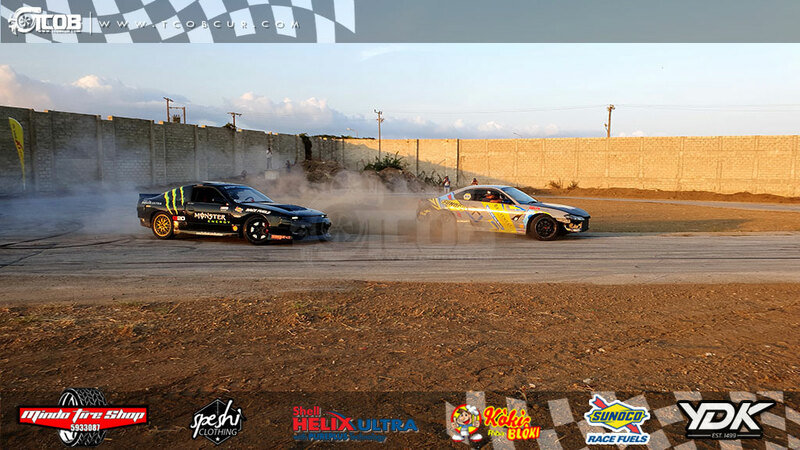 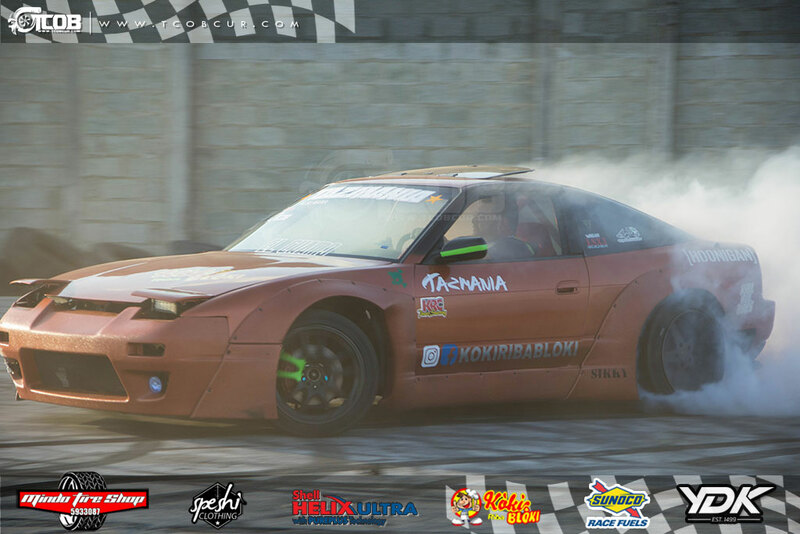 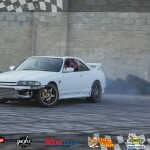 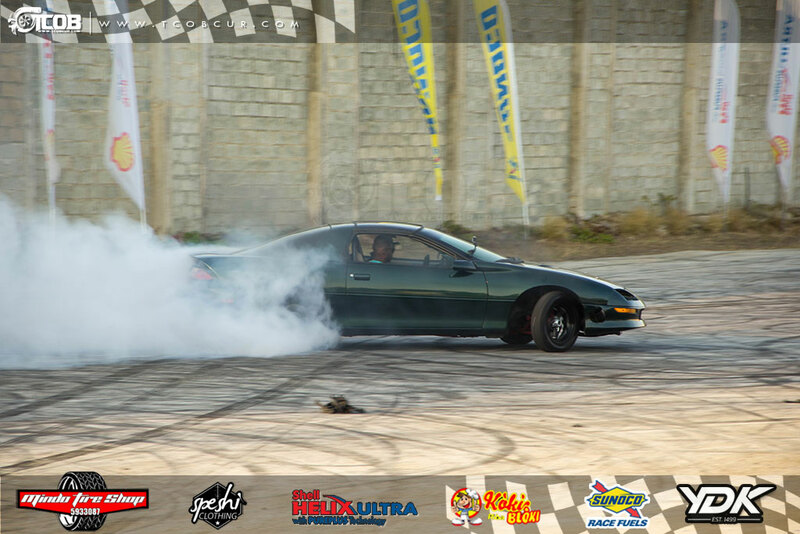 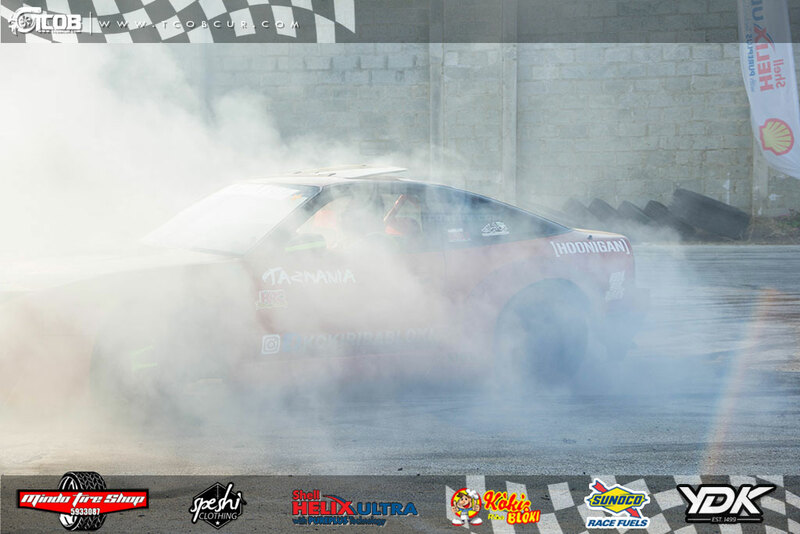 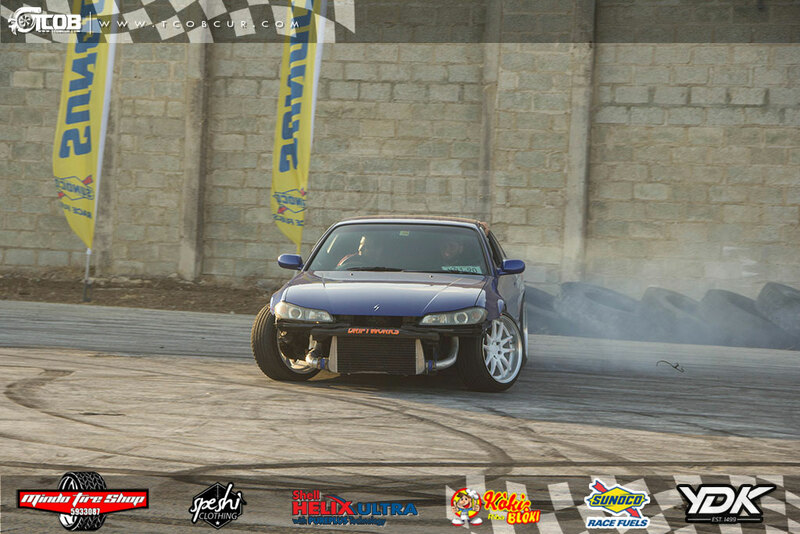 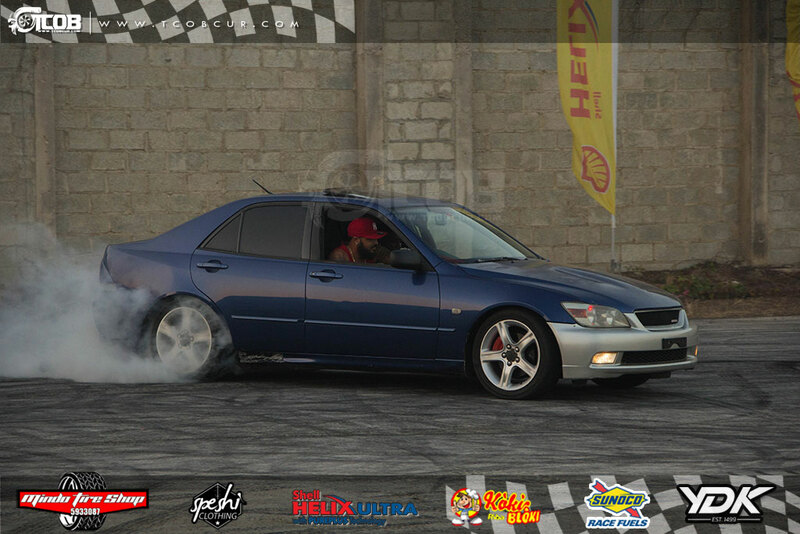 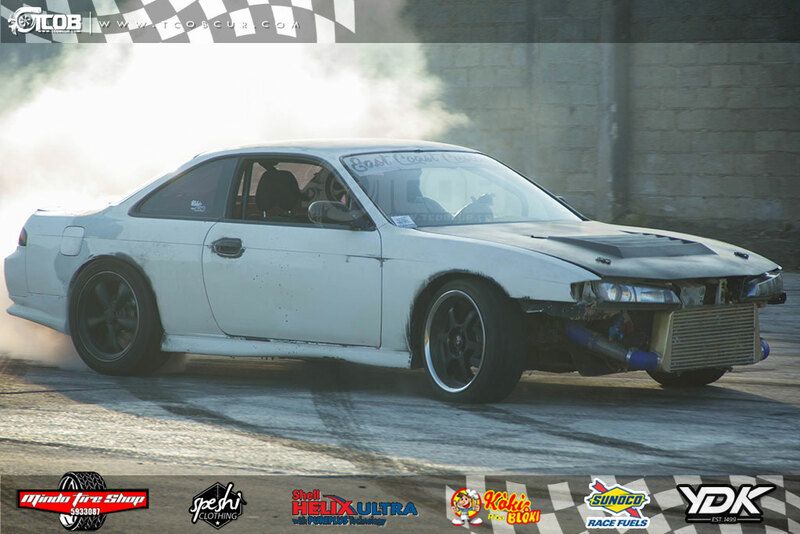 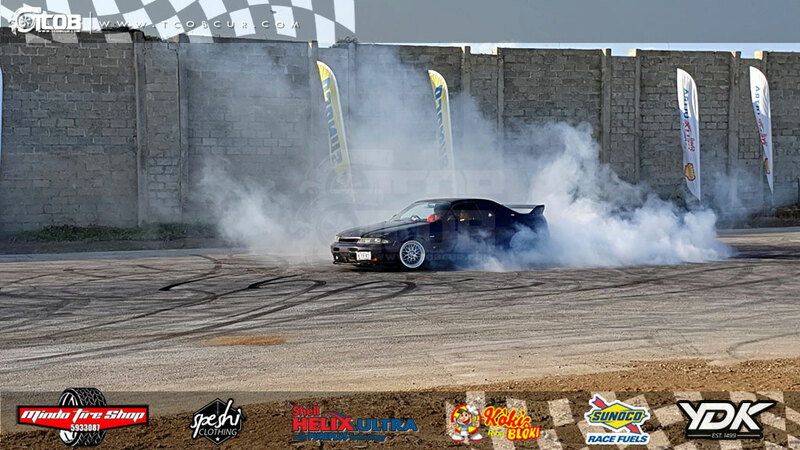 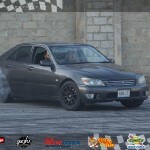 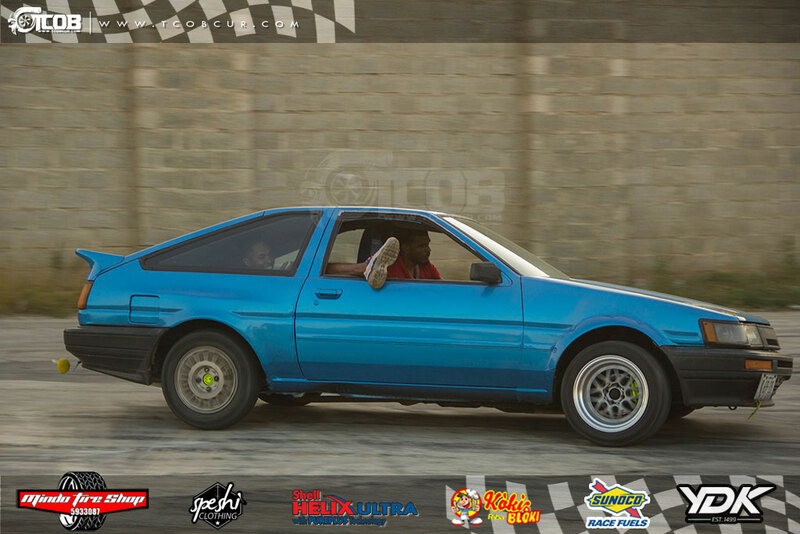 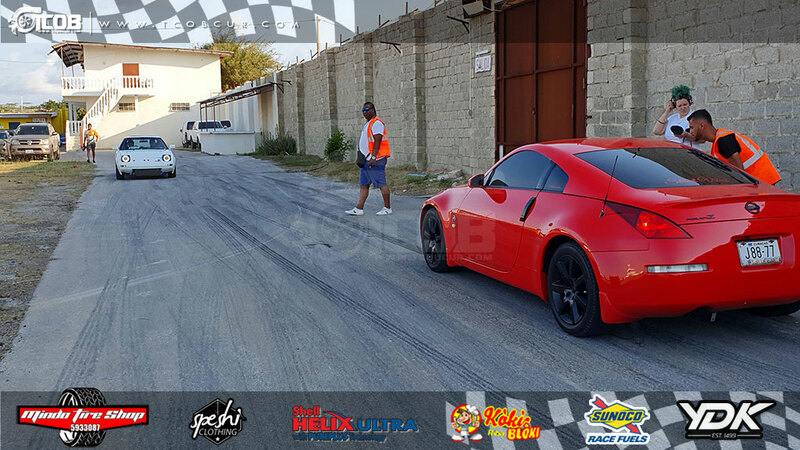 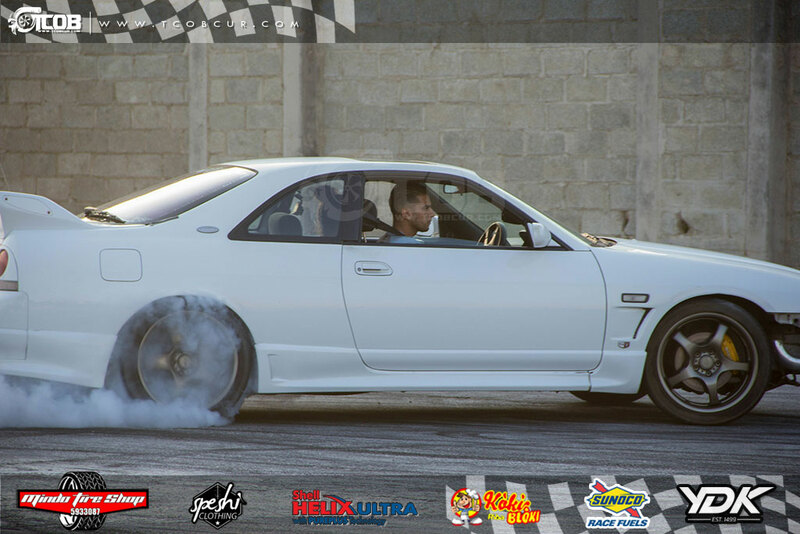 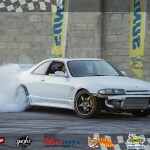 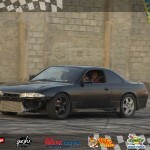 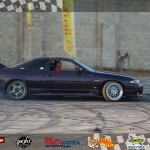 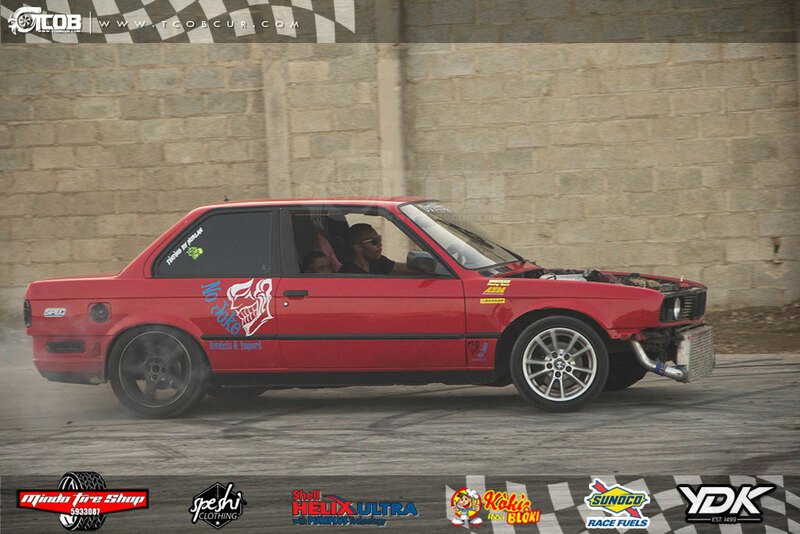 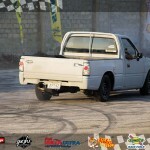 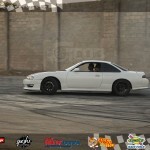 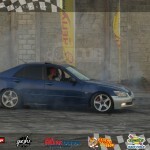 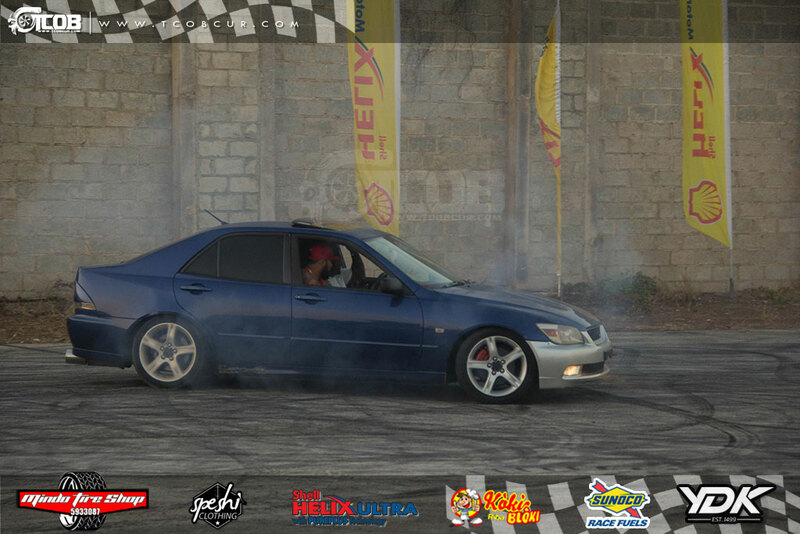 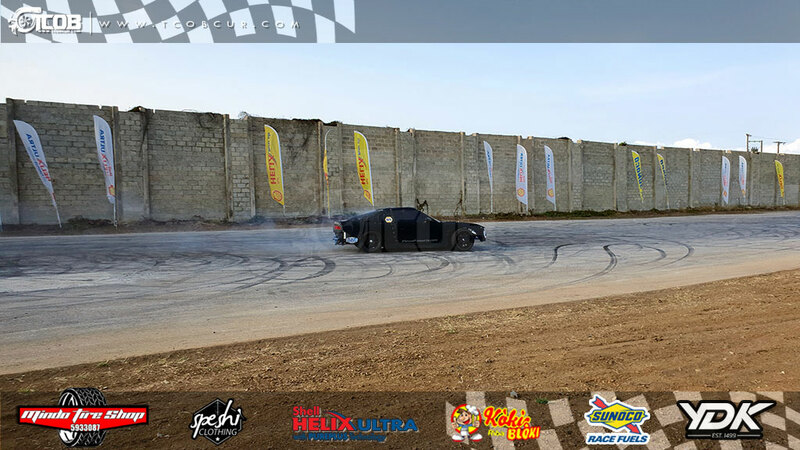 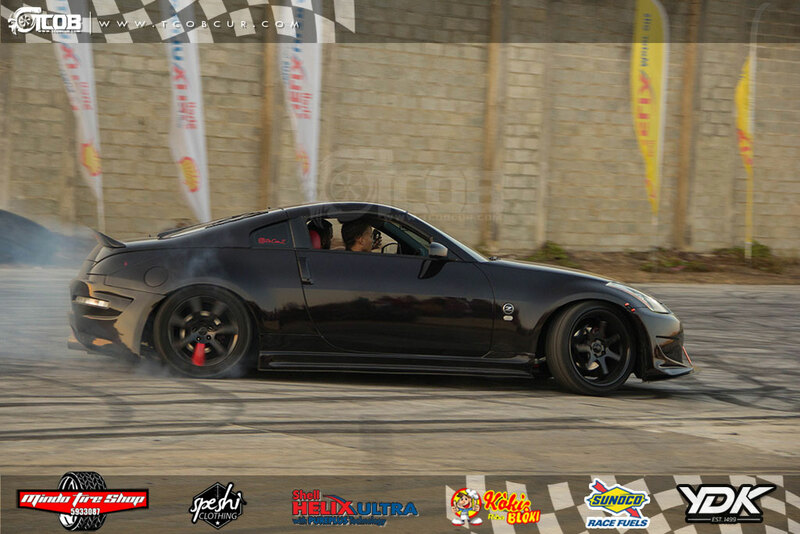 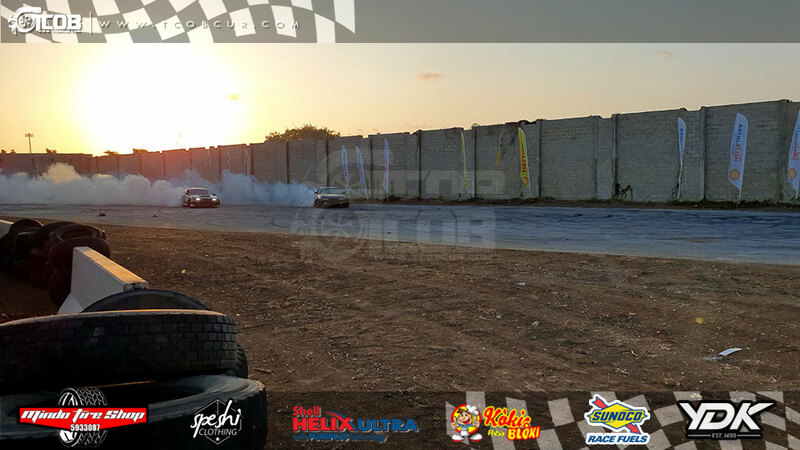 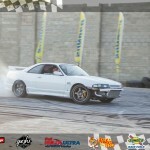 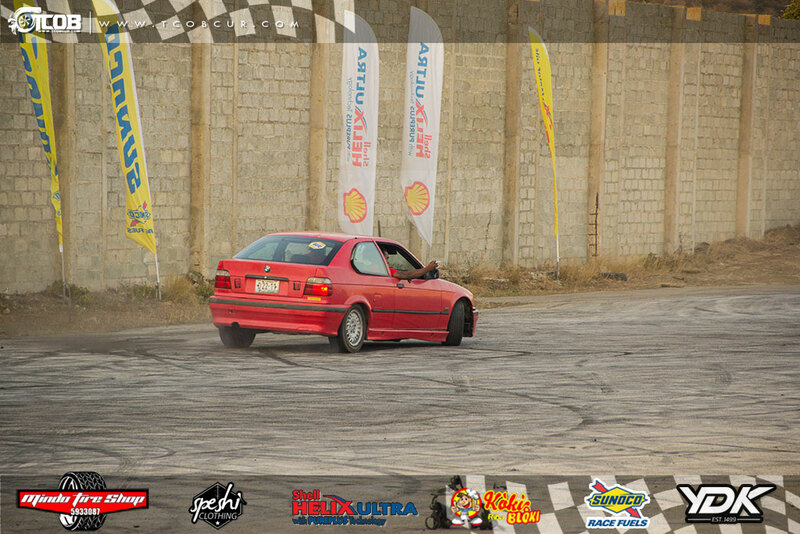 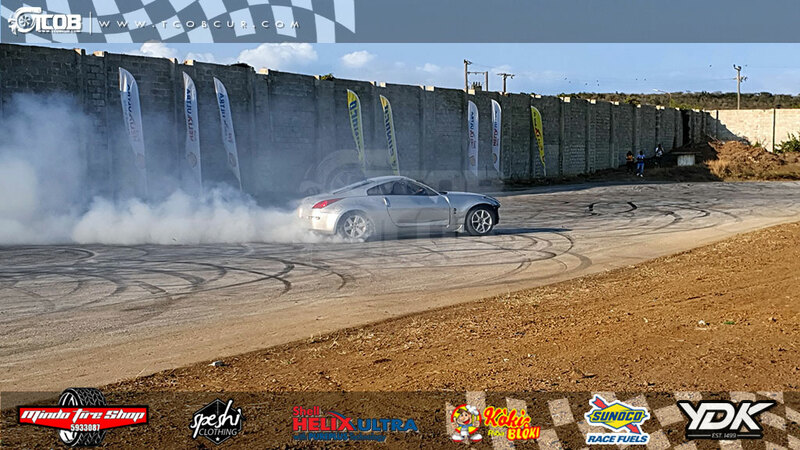 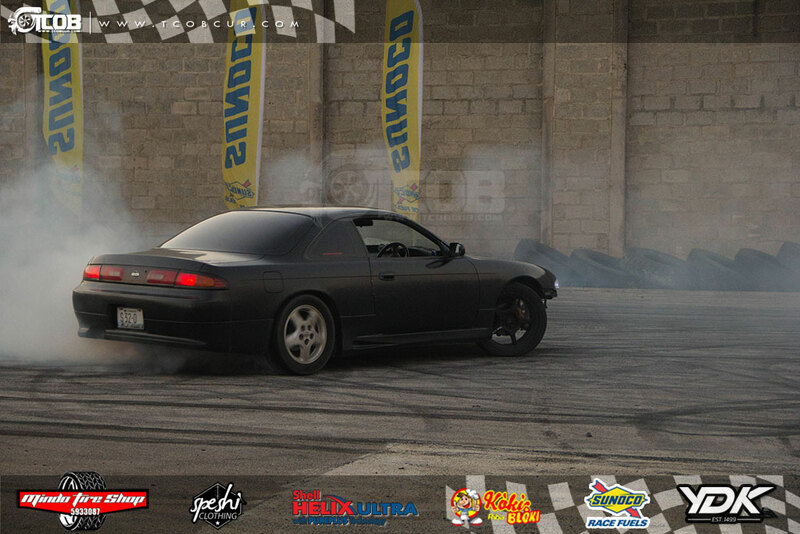 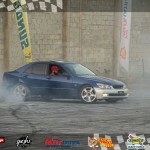 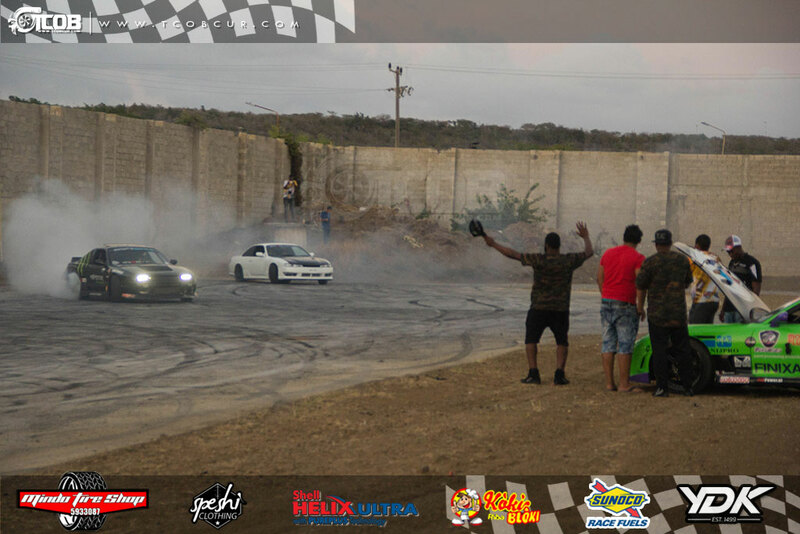 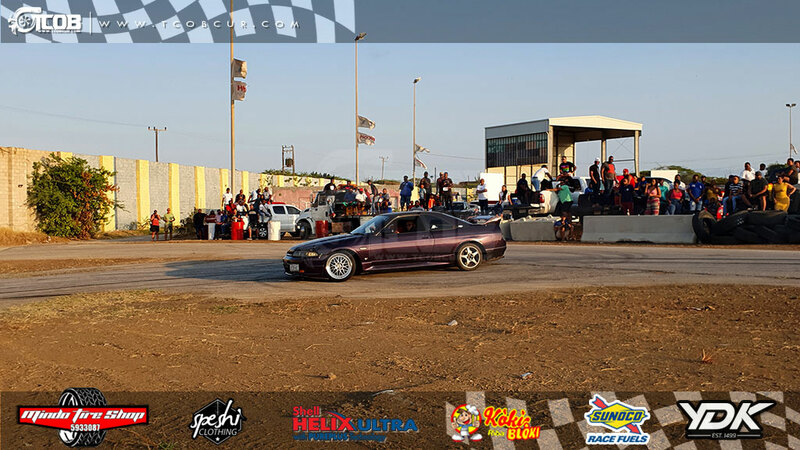 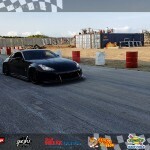 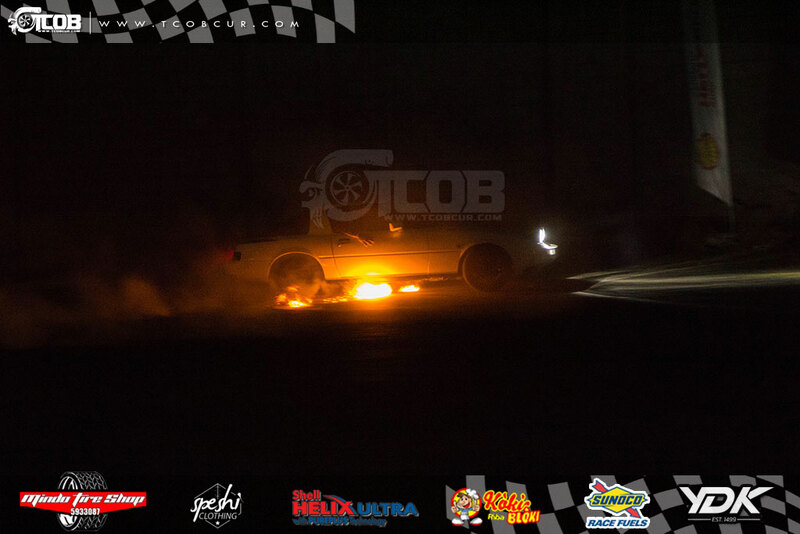 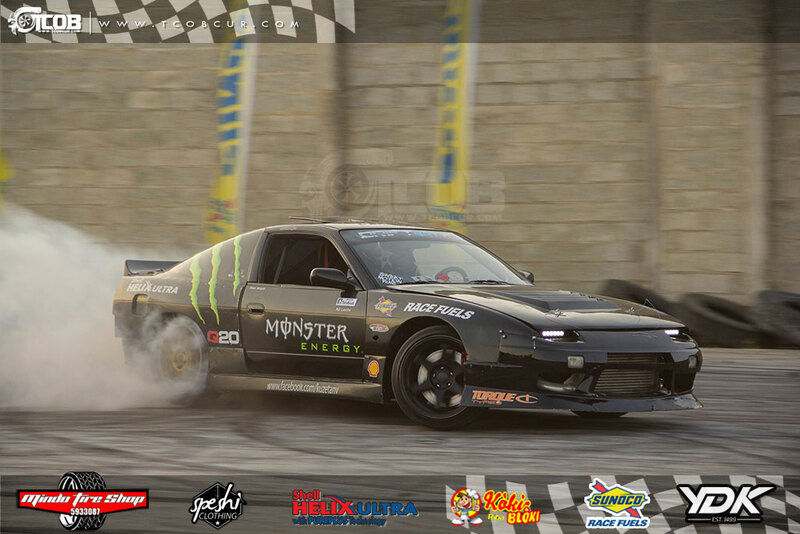 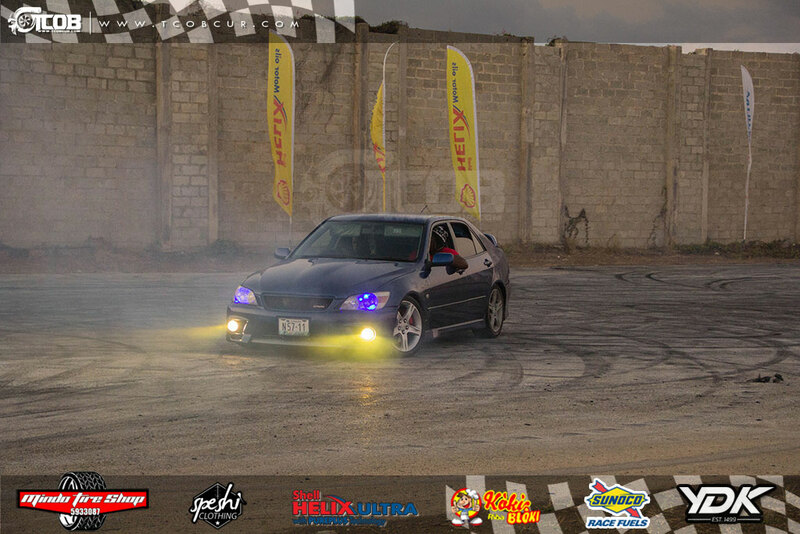 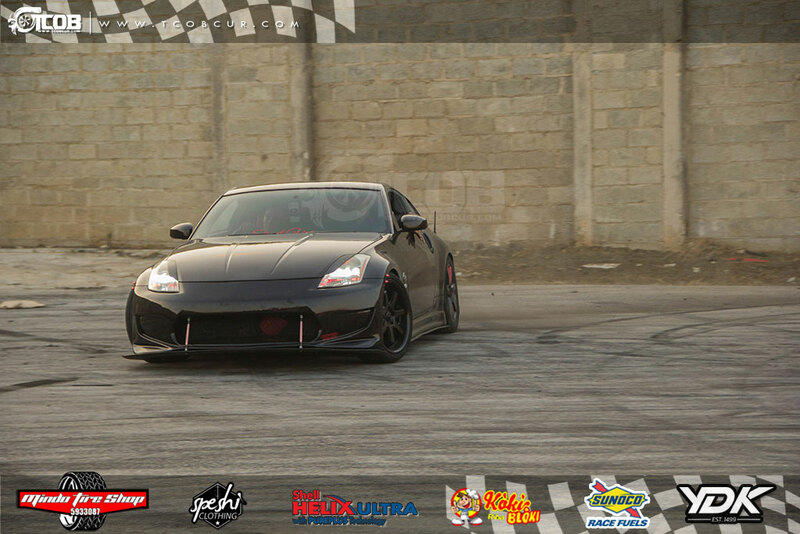 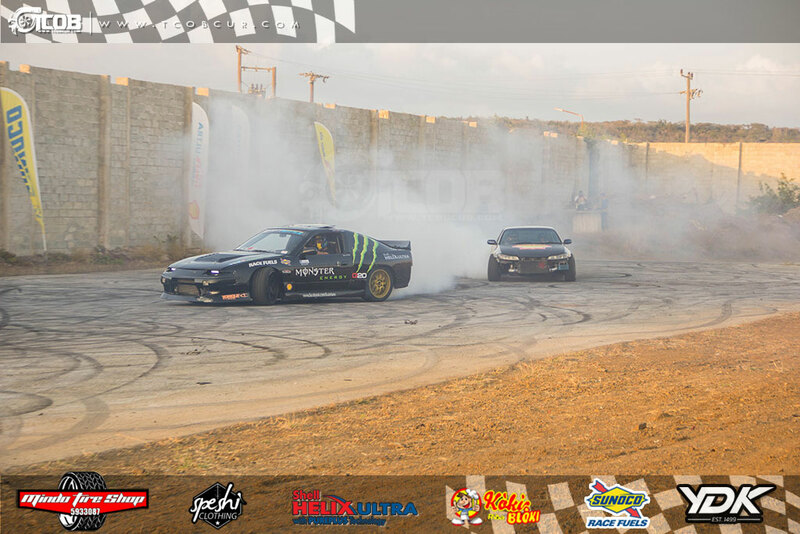 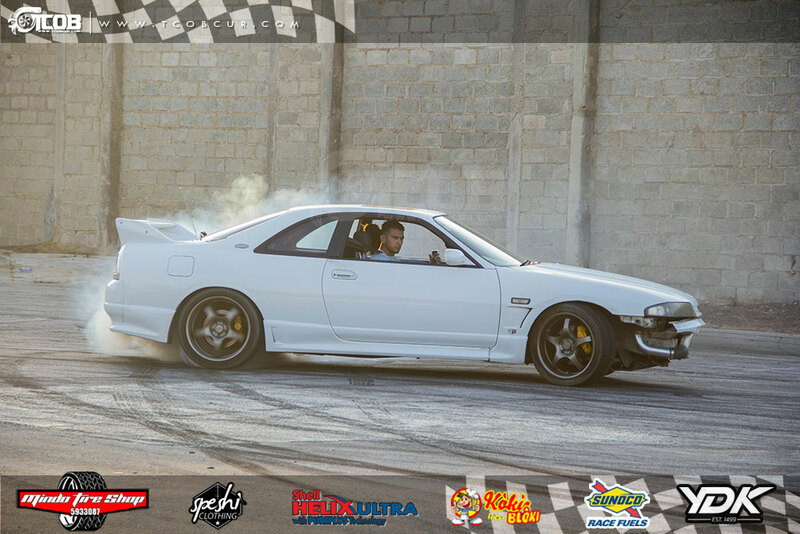 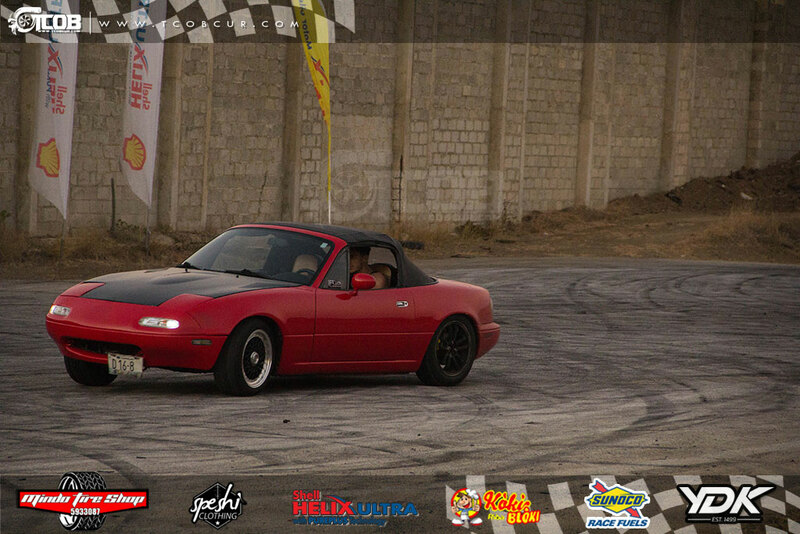 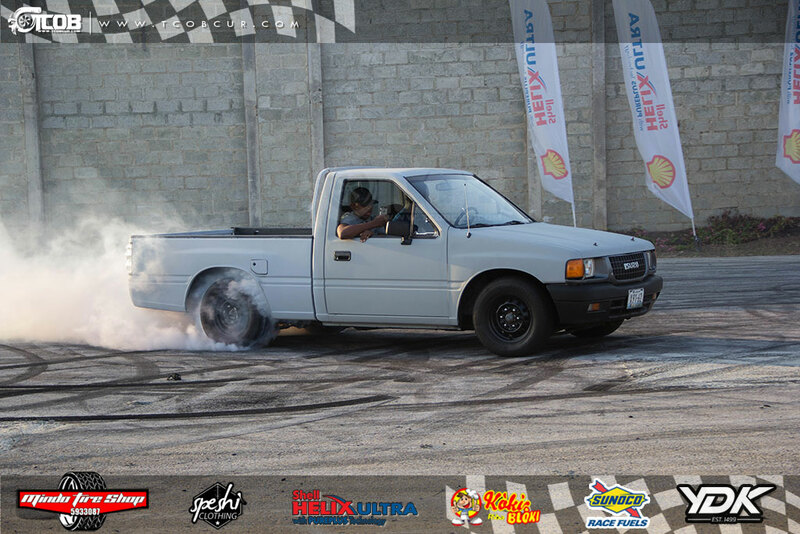 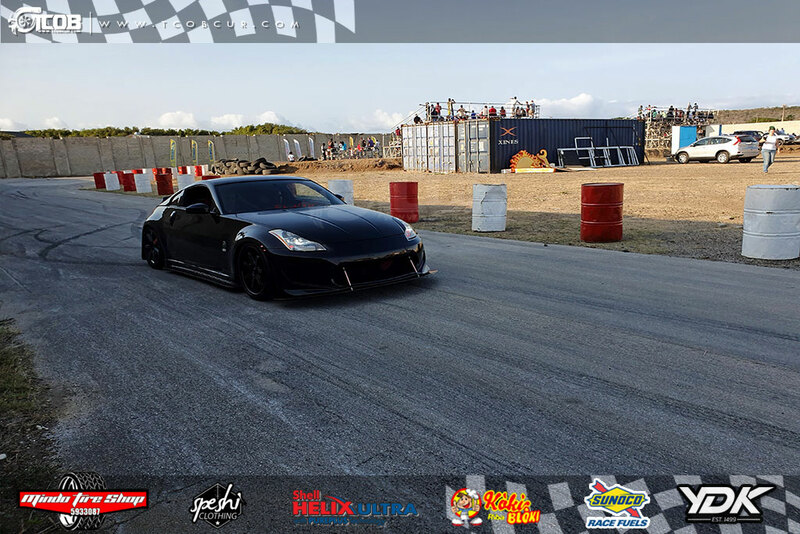 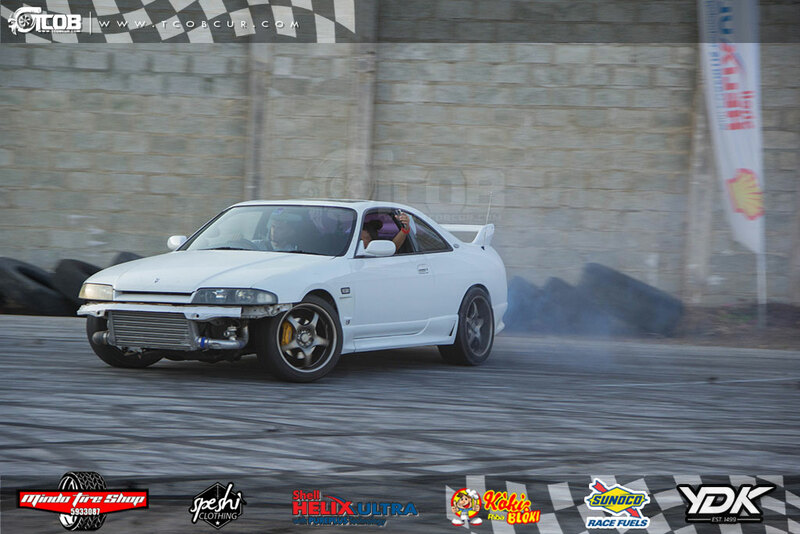 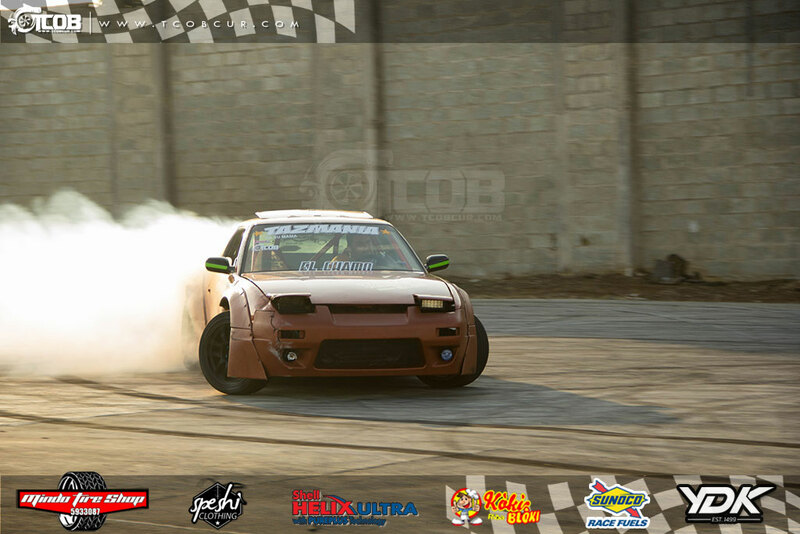 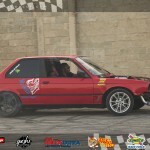 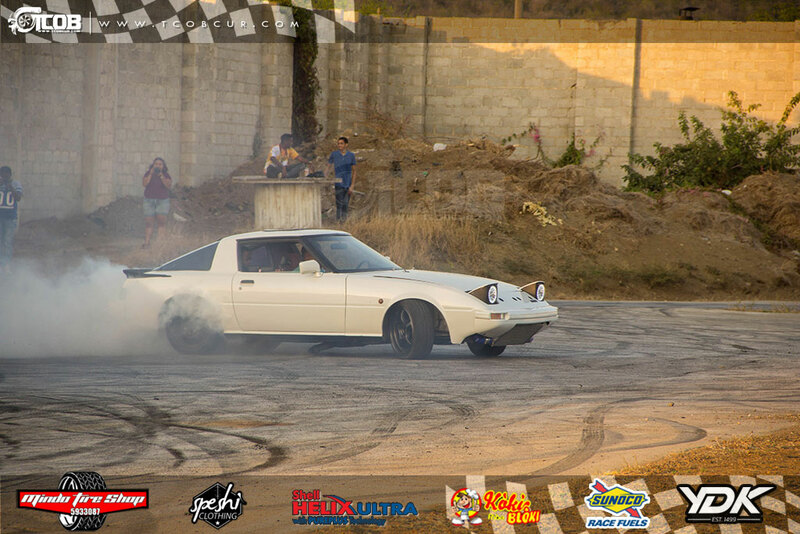 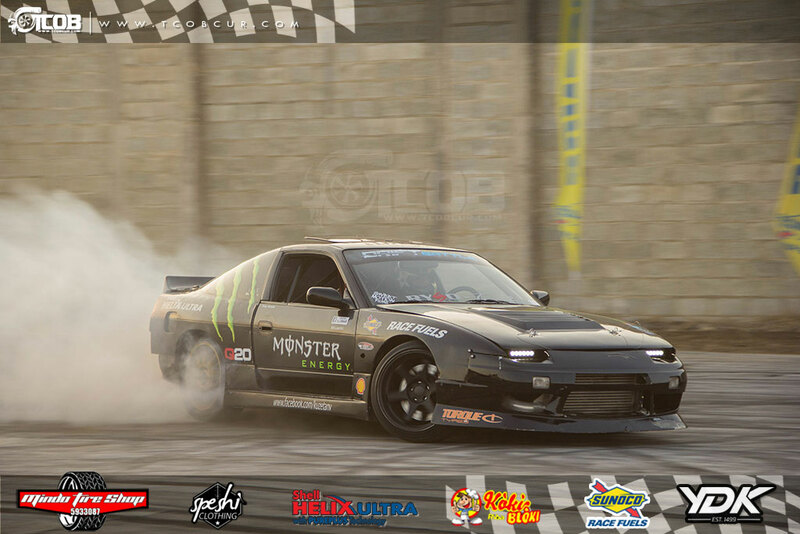 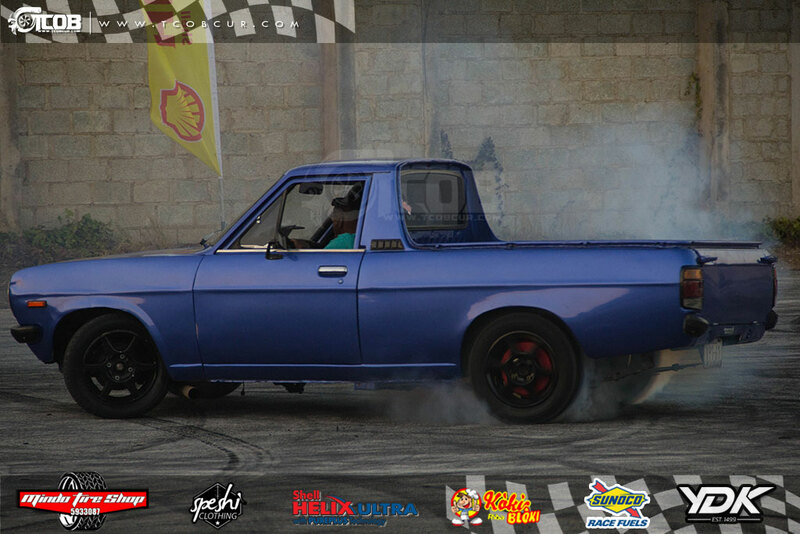 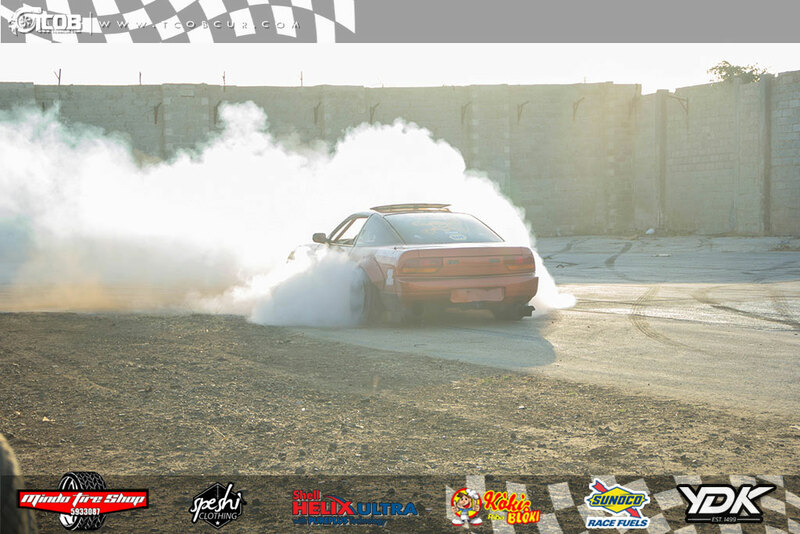 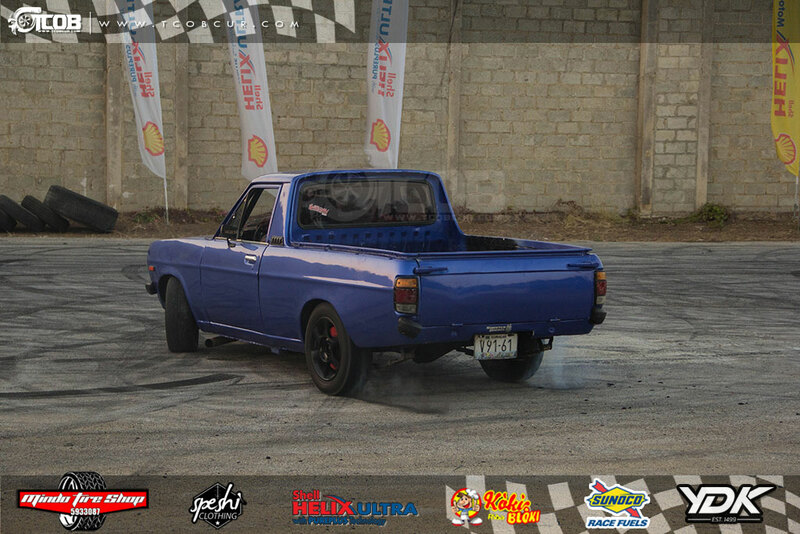 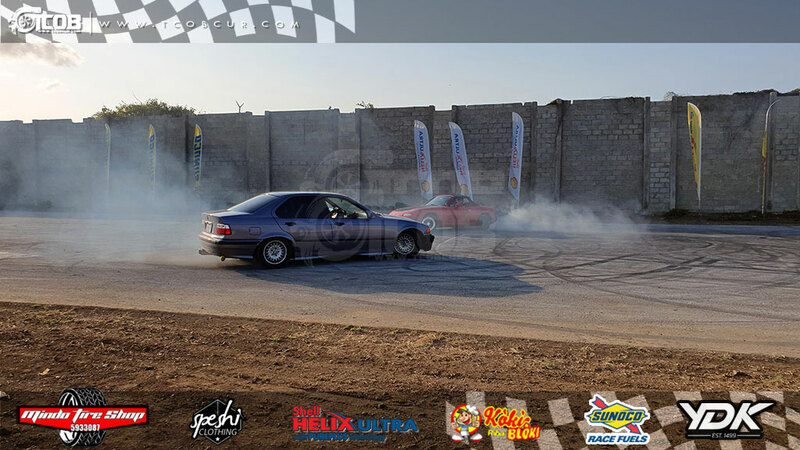 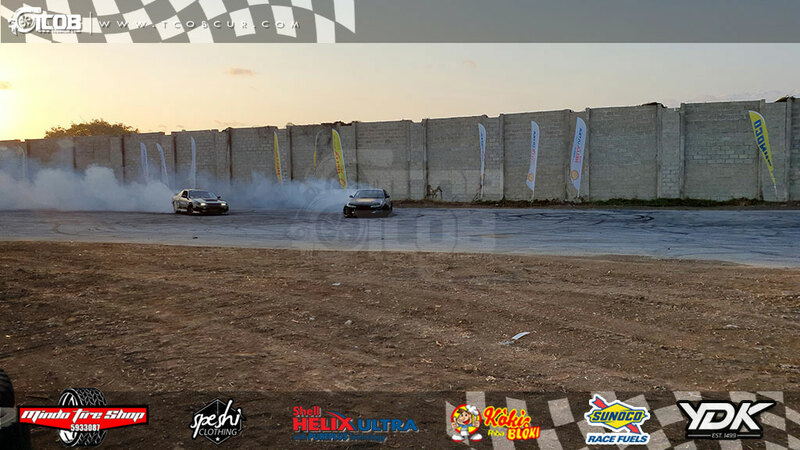 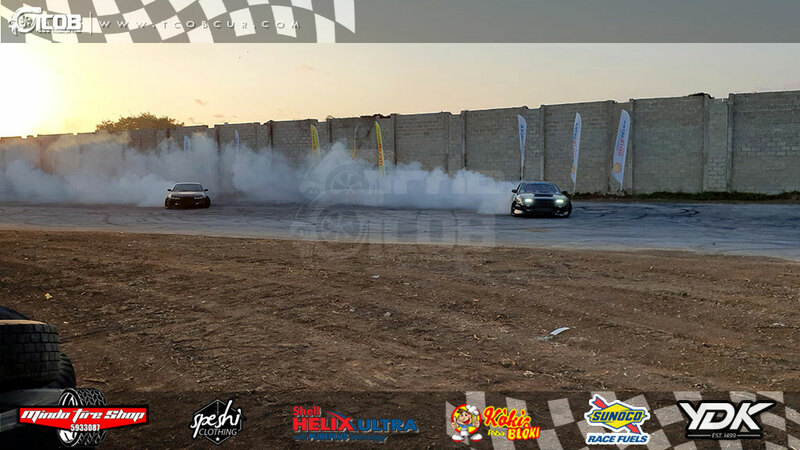 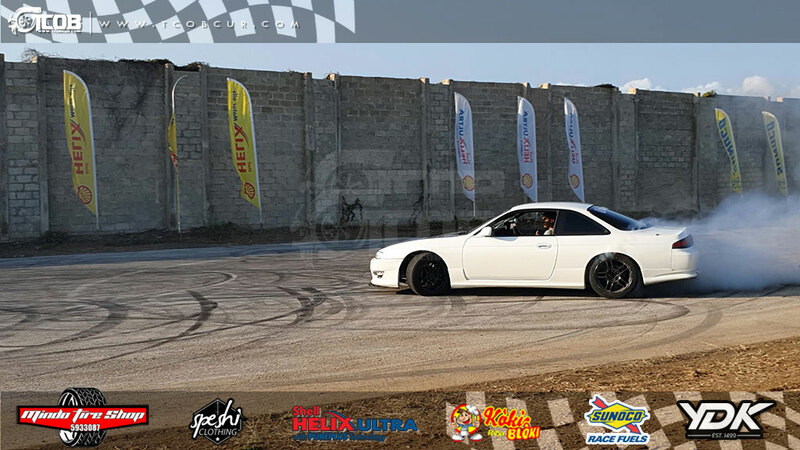 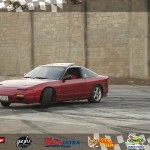 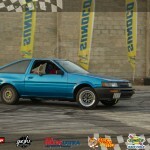 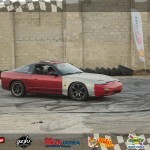 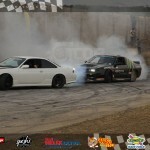 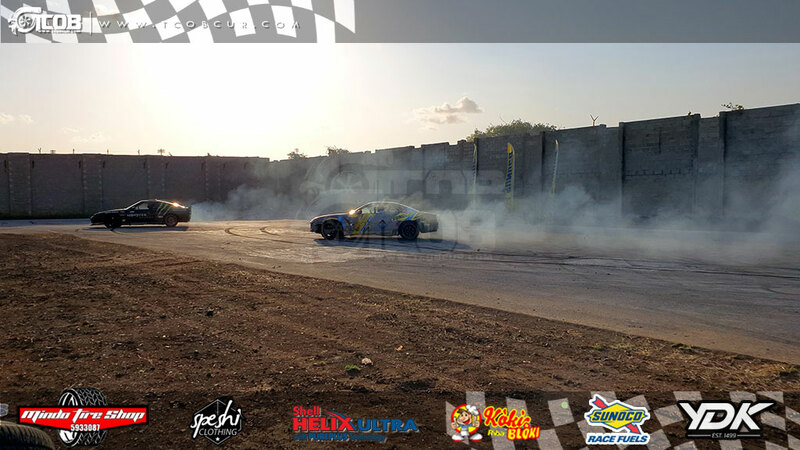 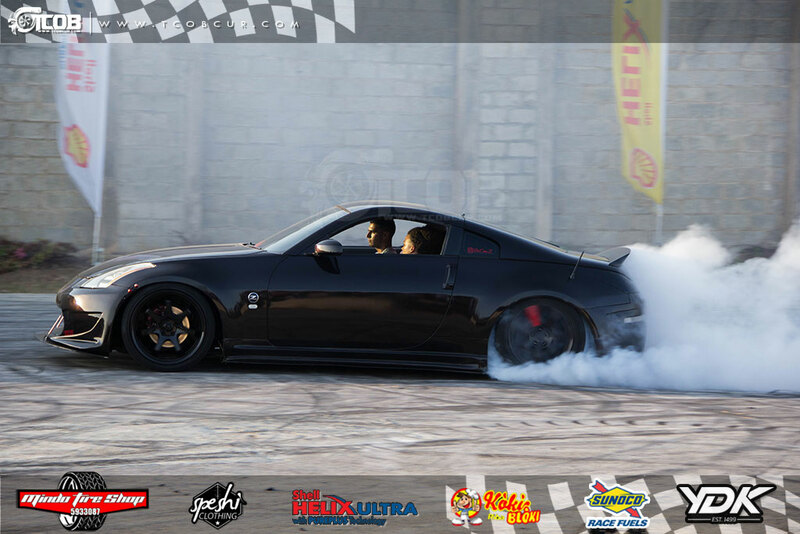 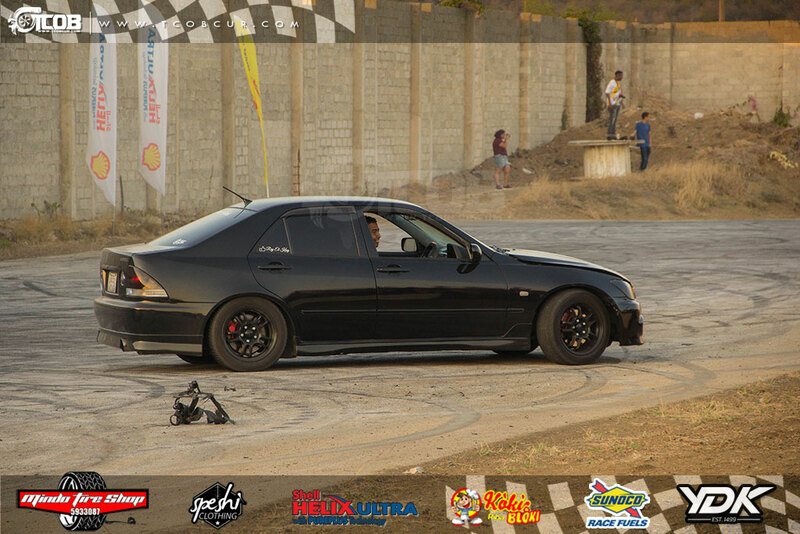 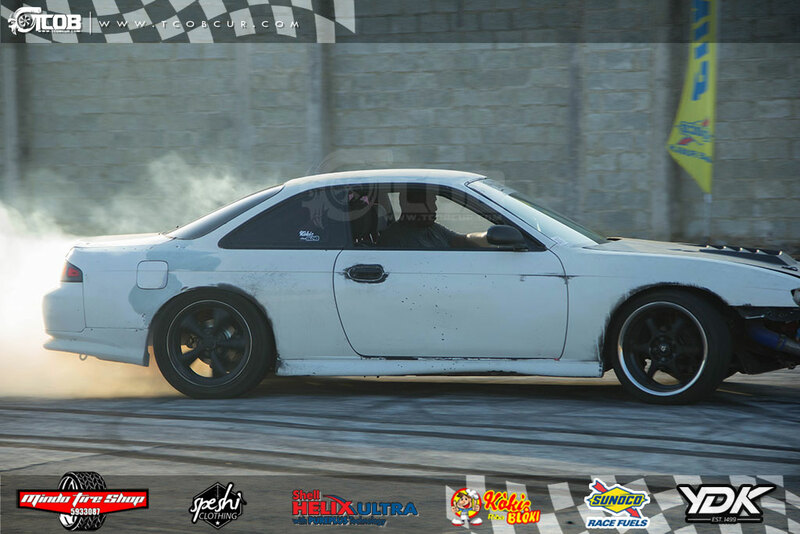 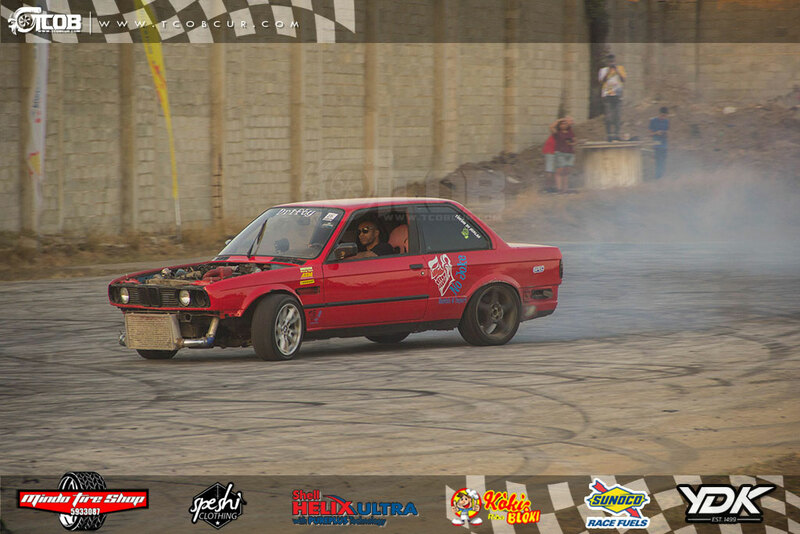 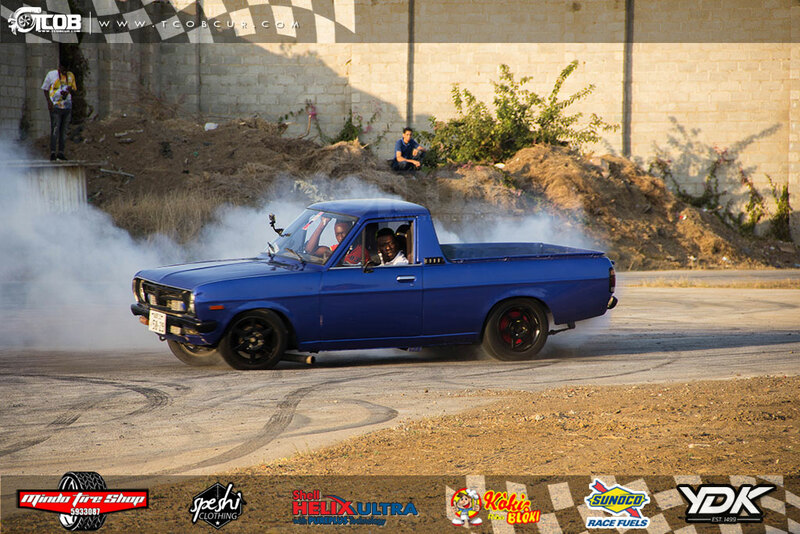 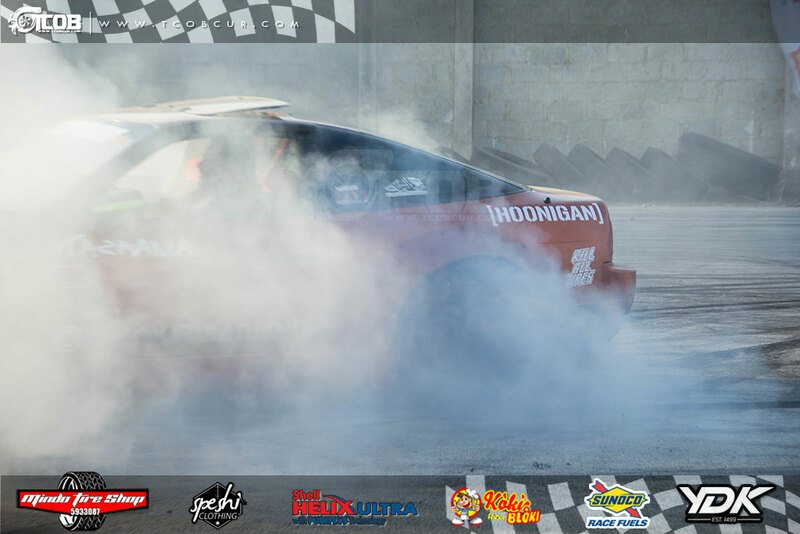 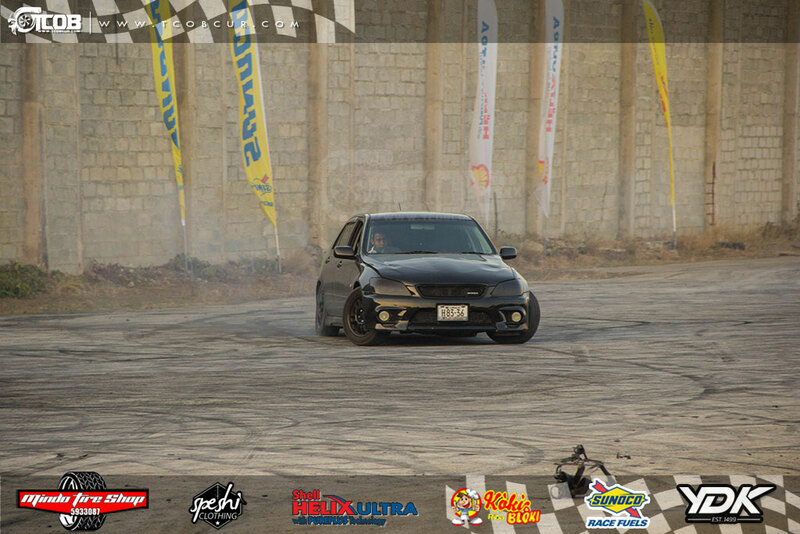 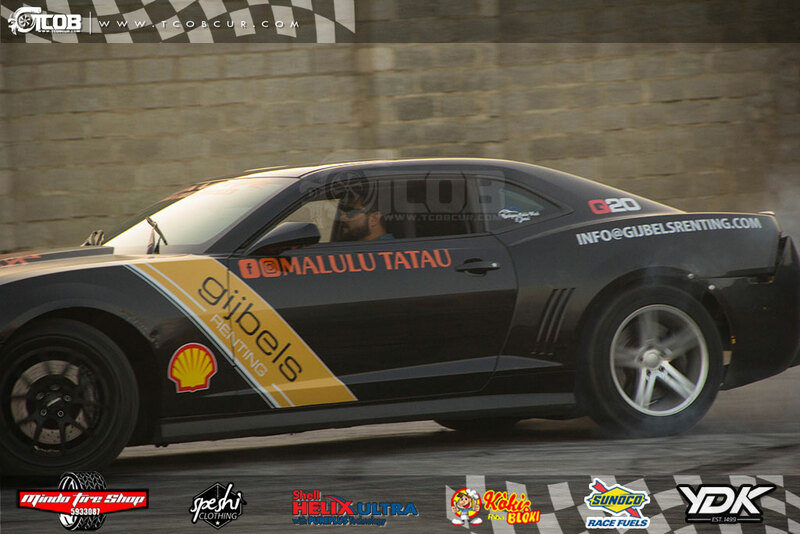 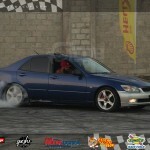 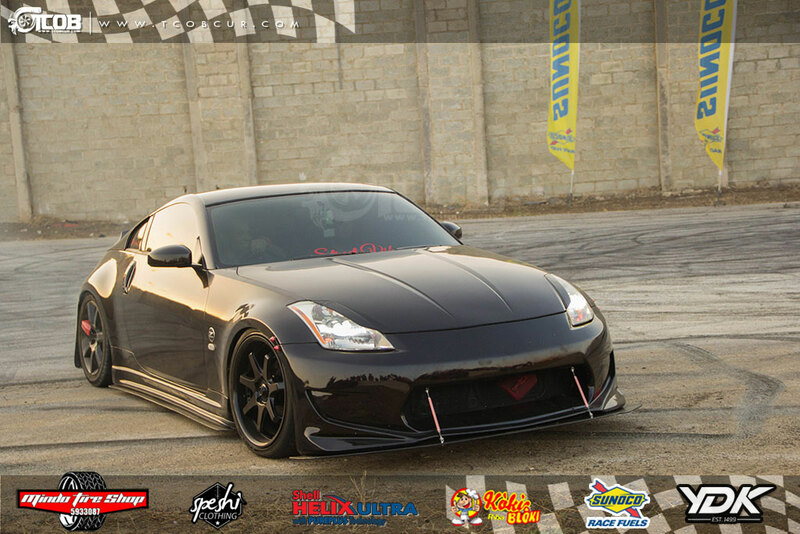 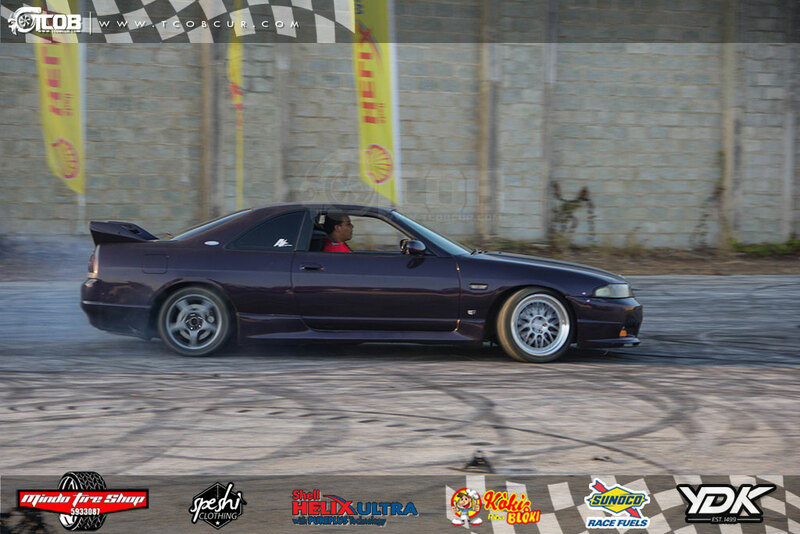 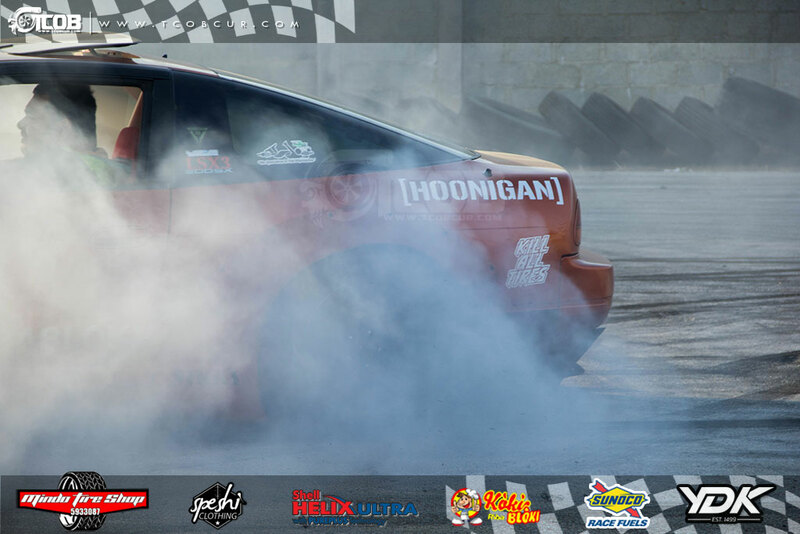 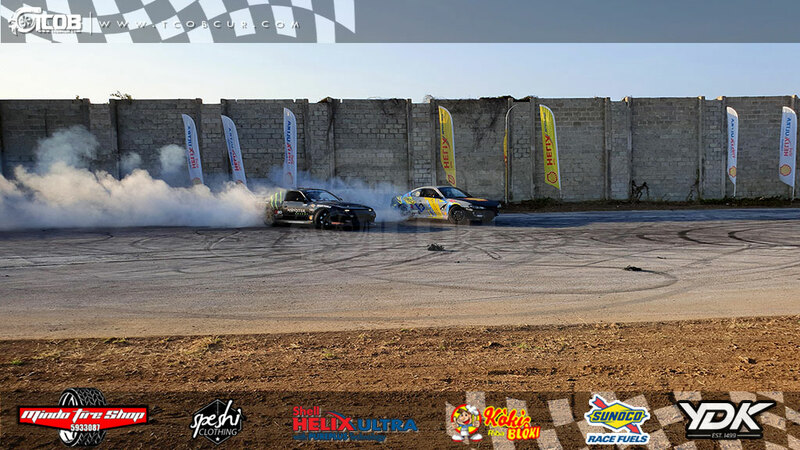 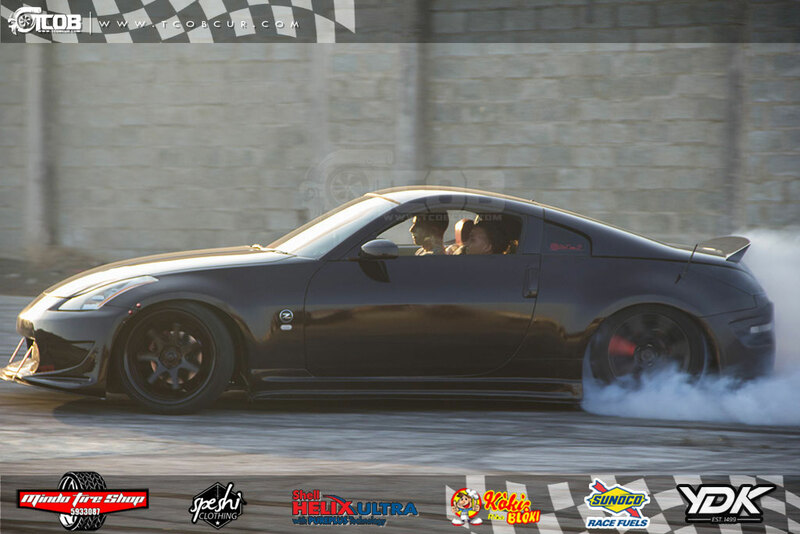 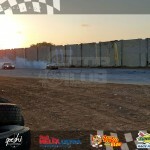 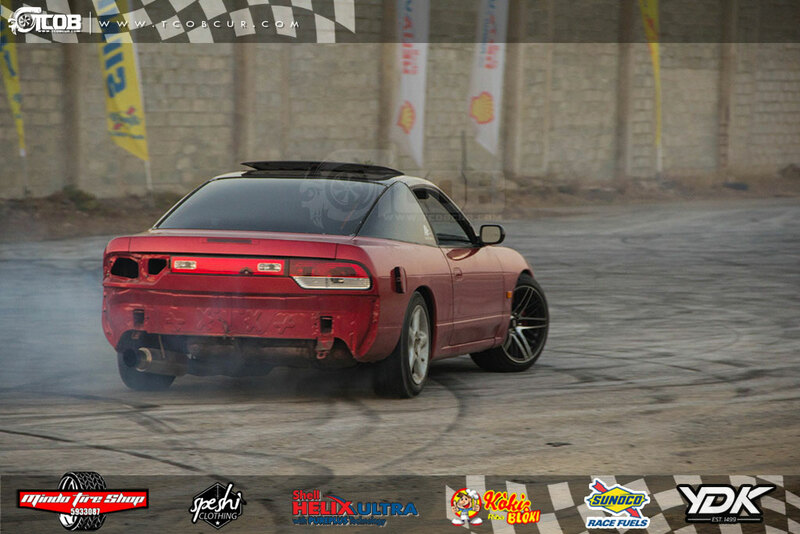 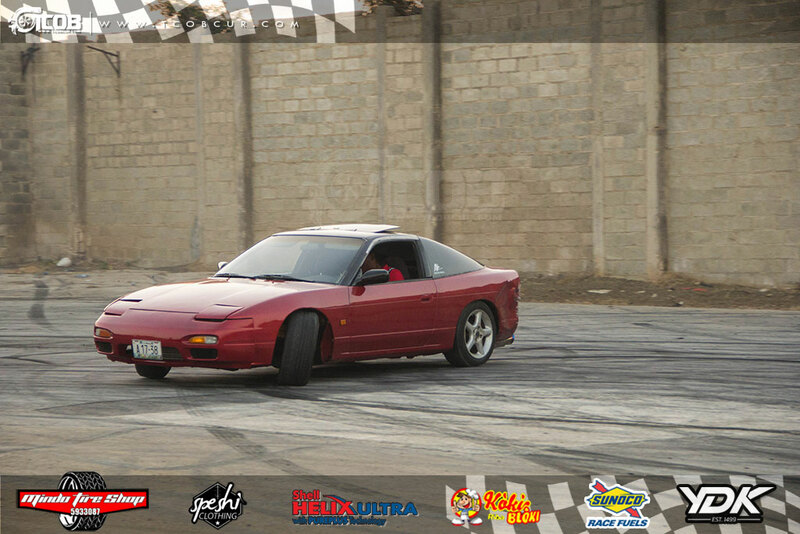 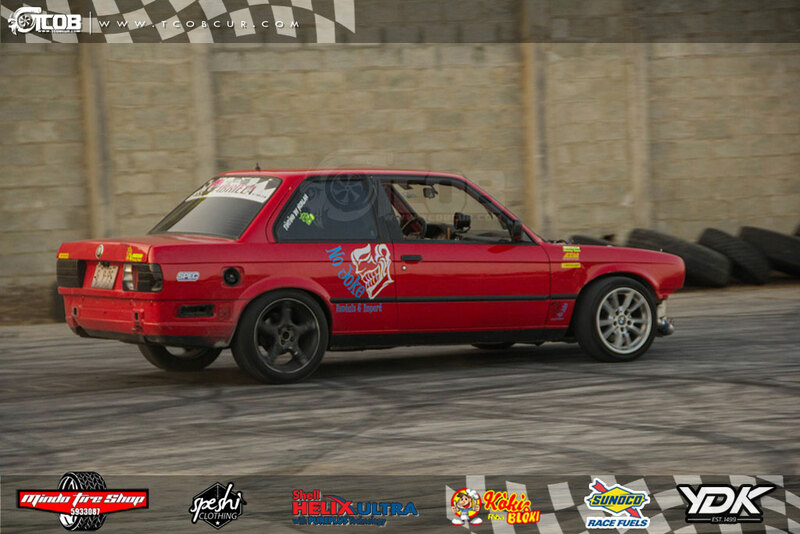 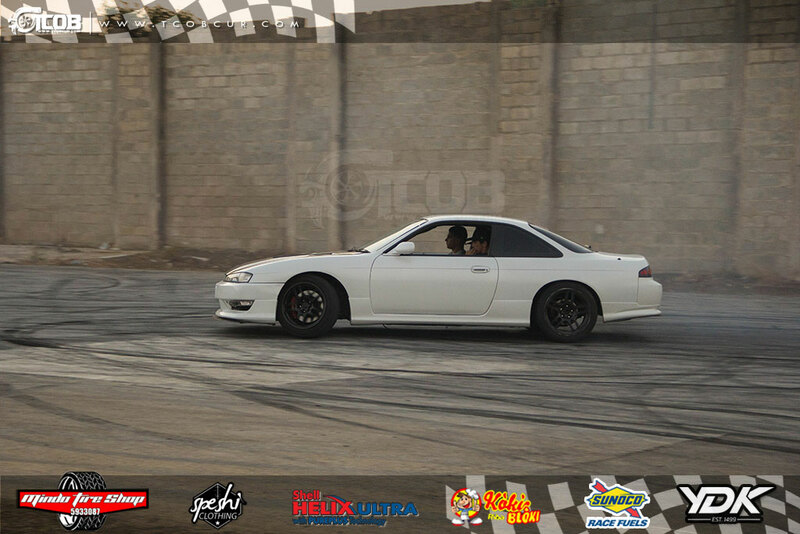 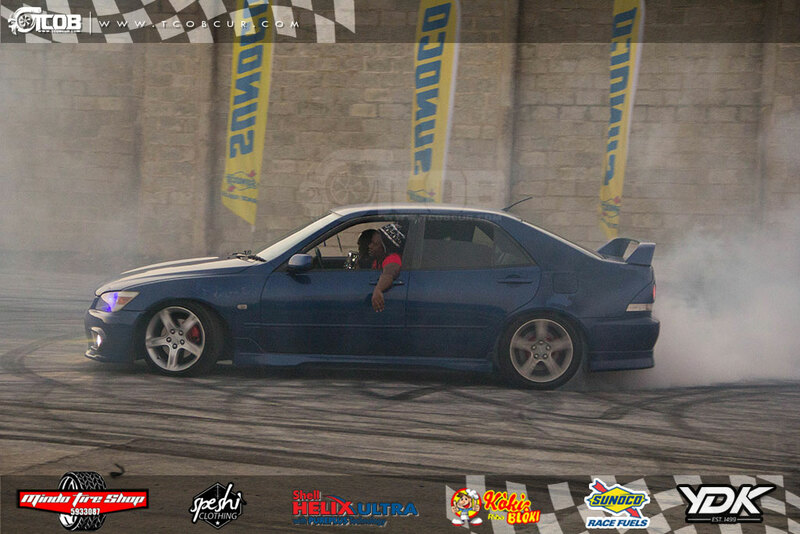 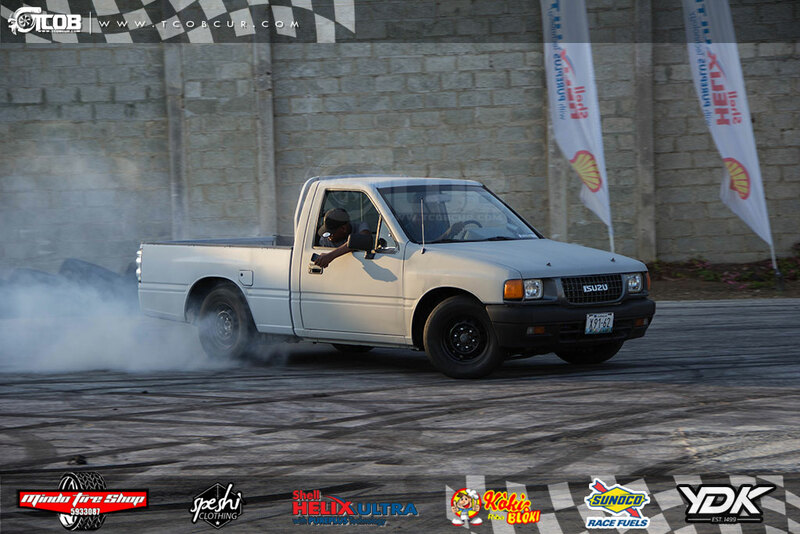 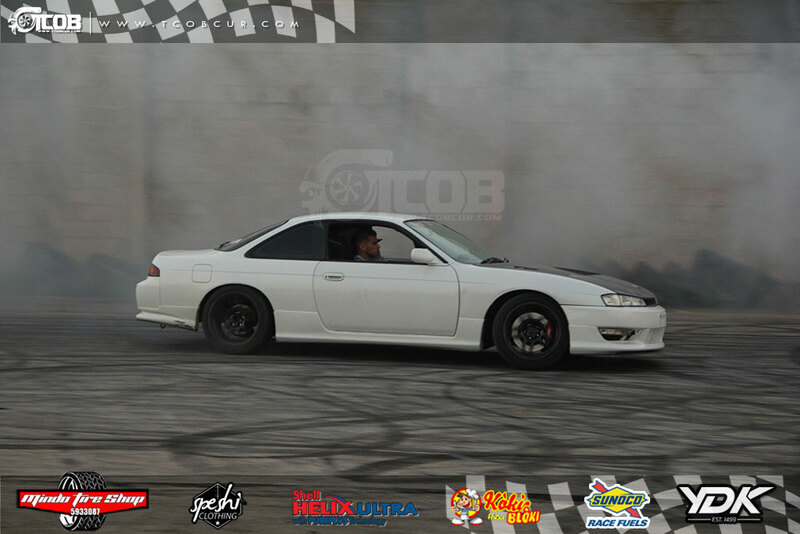 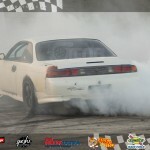 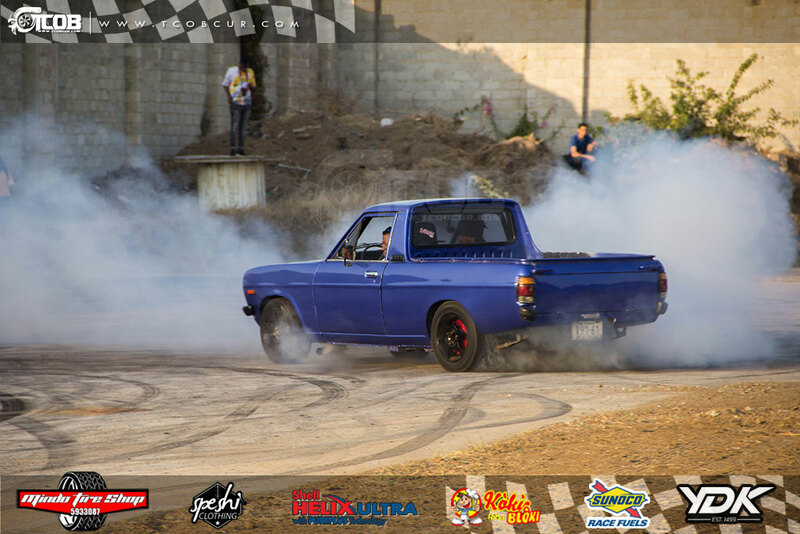 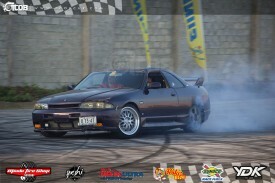 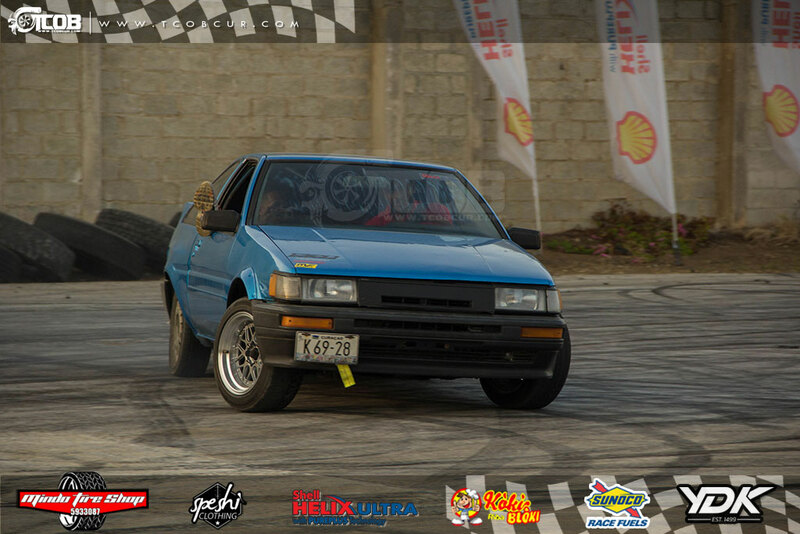 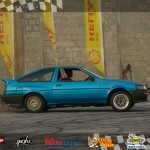 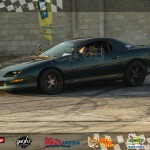 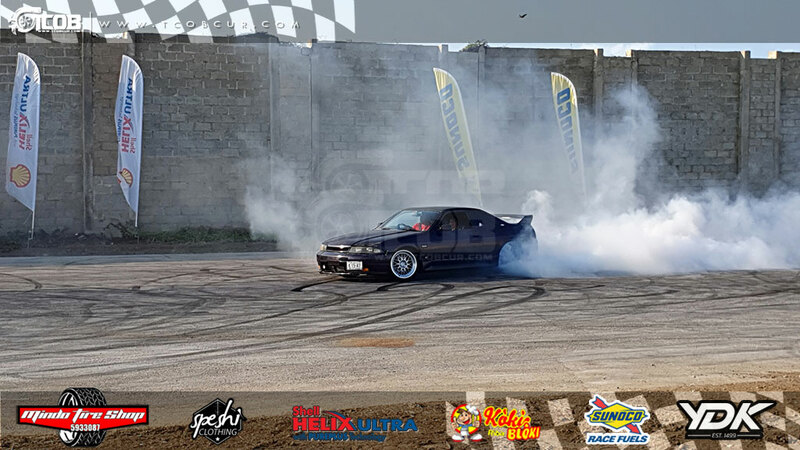 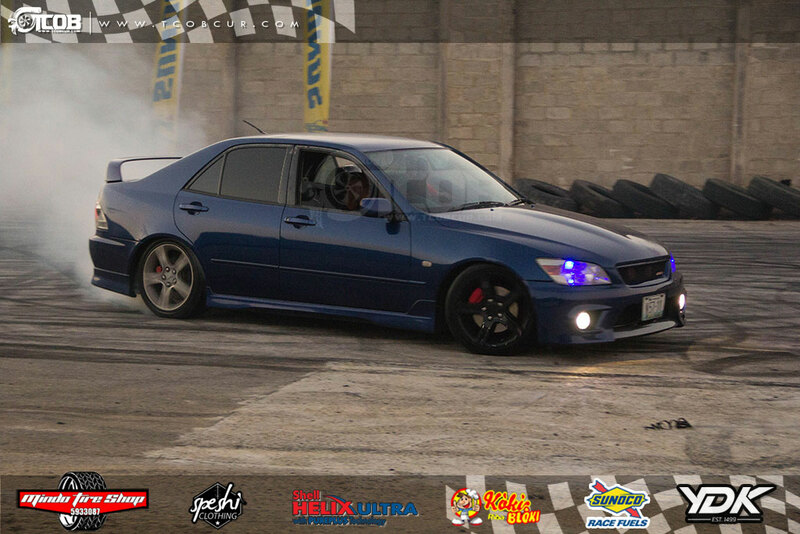 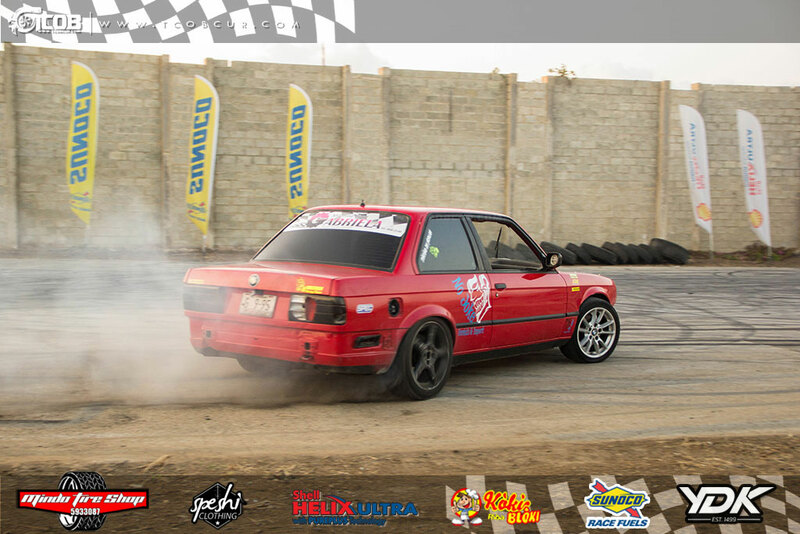 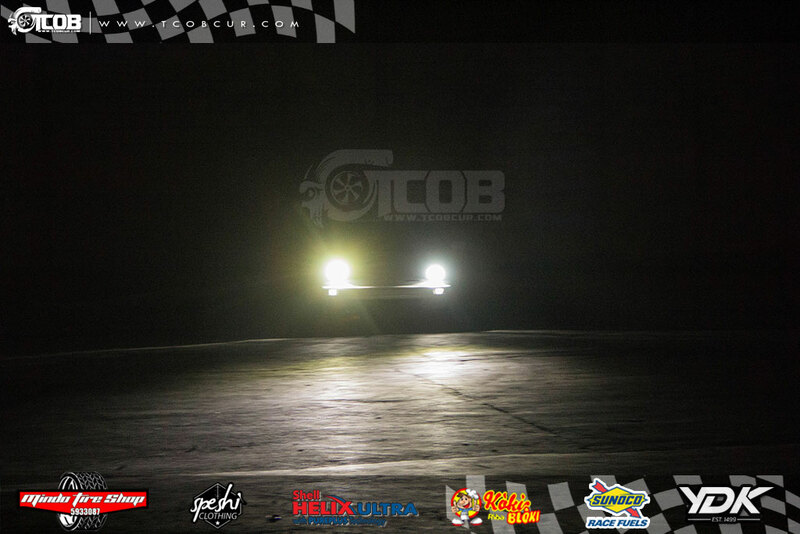 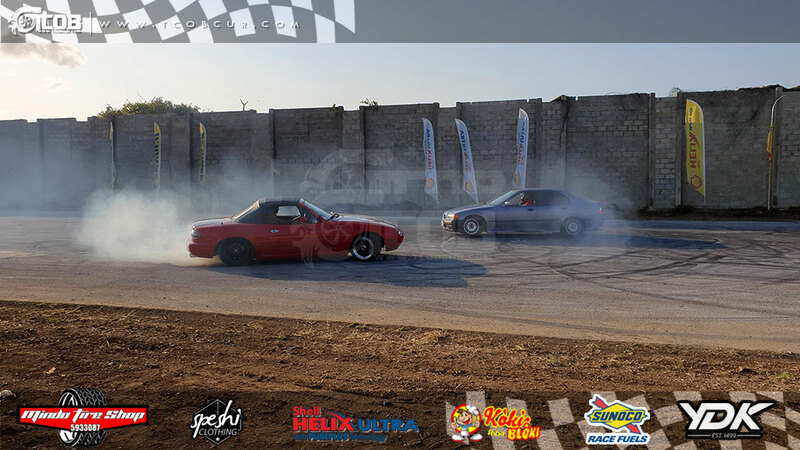 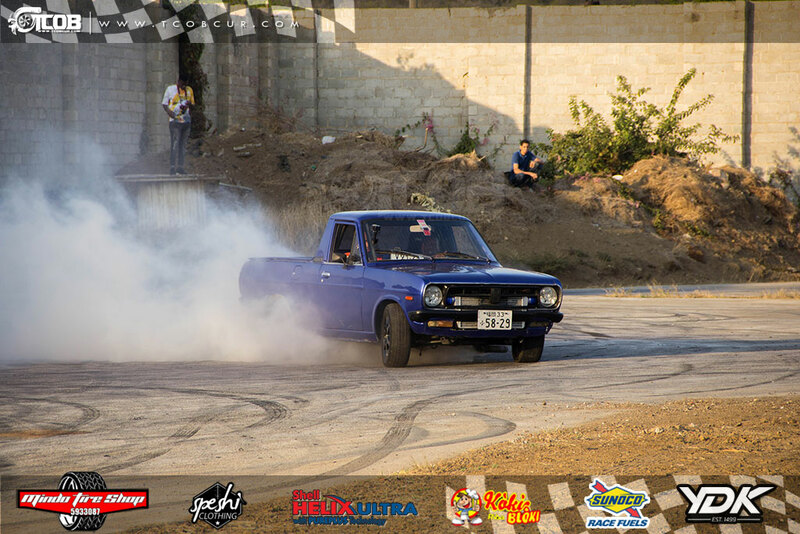 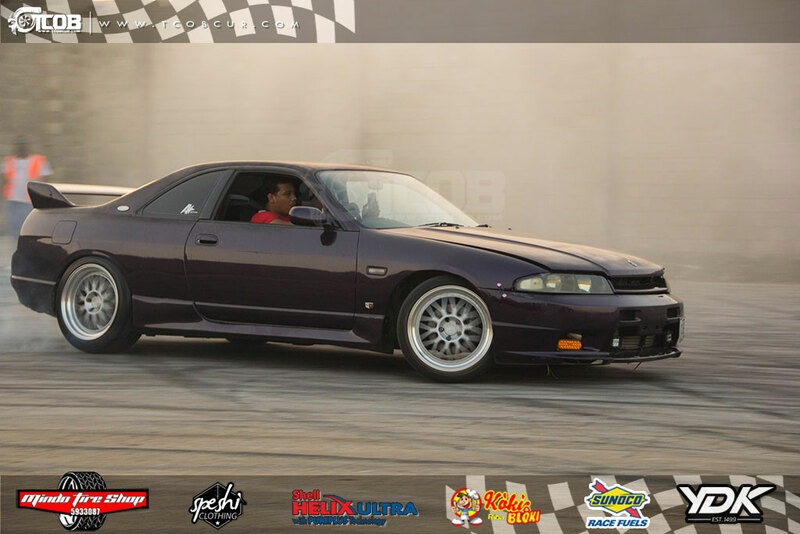 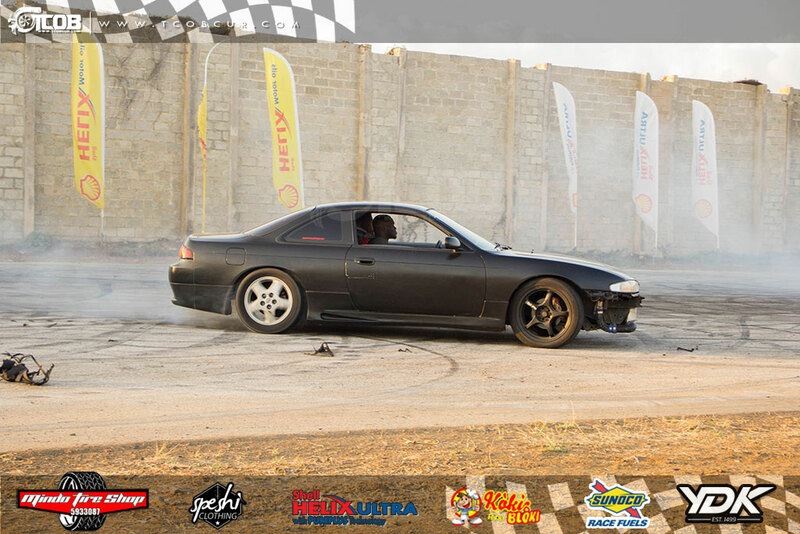 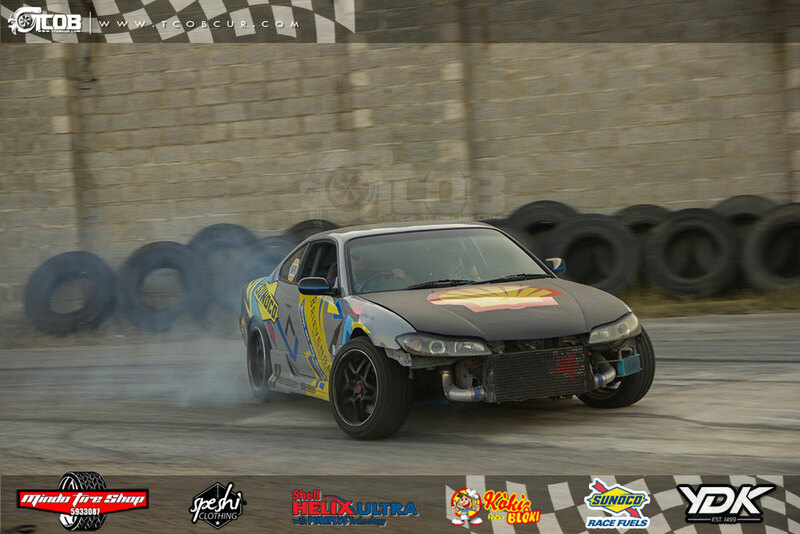 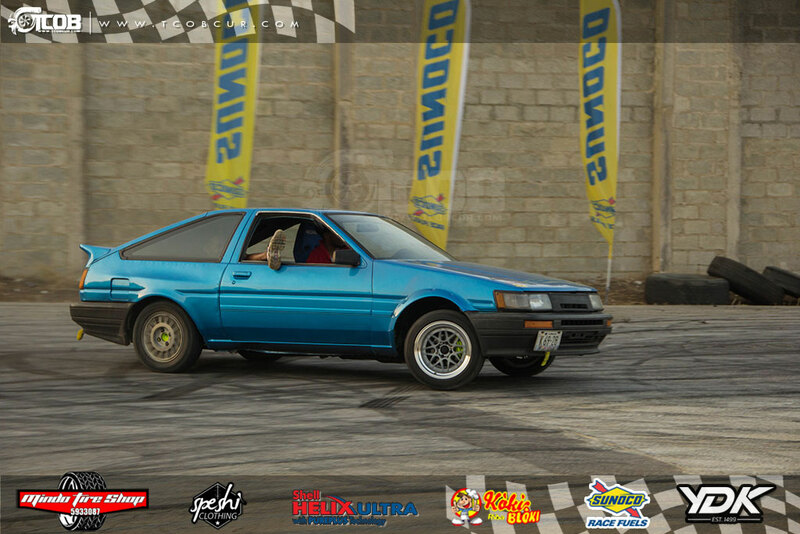 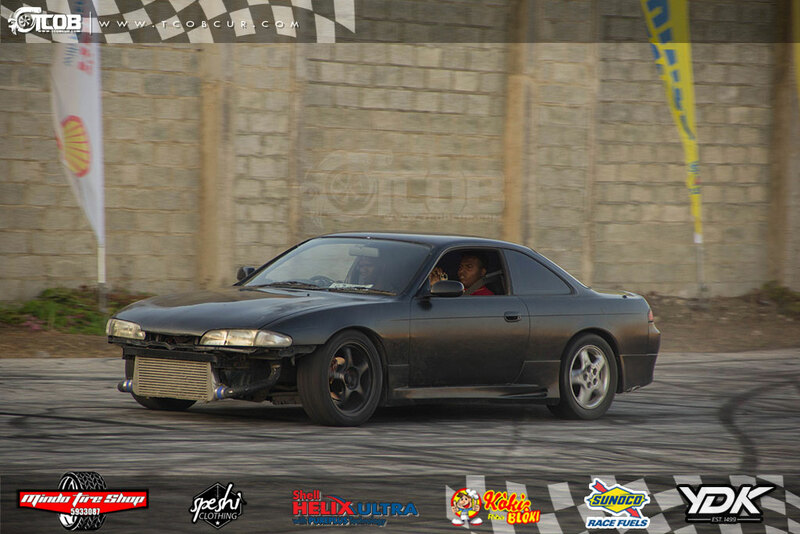 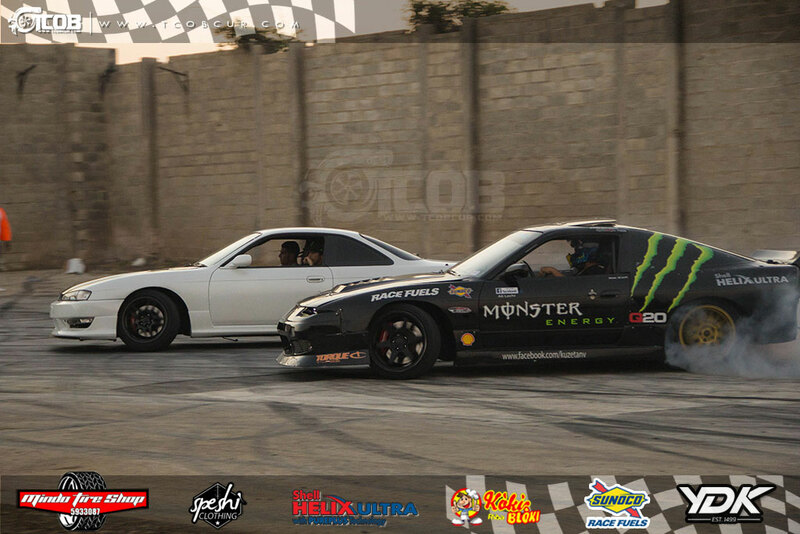 For this event Gabi invited Talel in his #Tazmania Nissan 200sx, powered by an LS3, to close out the event. 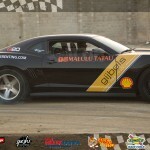 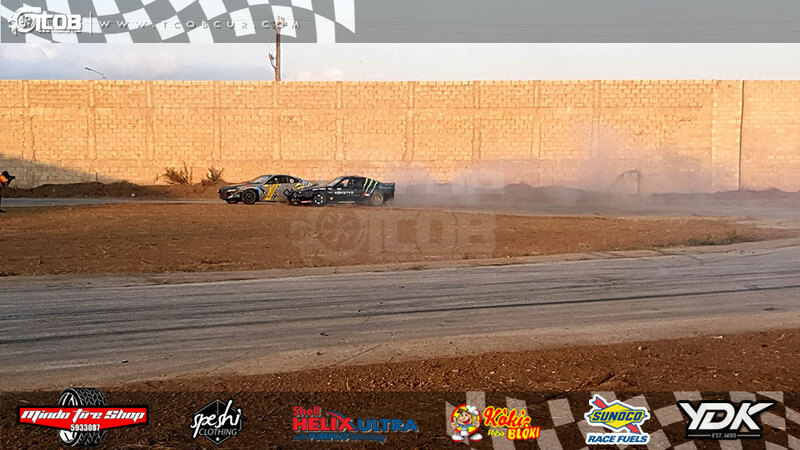 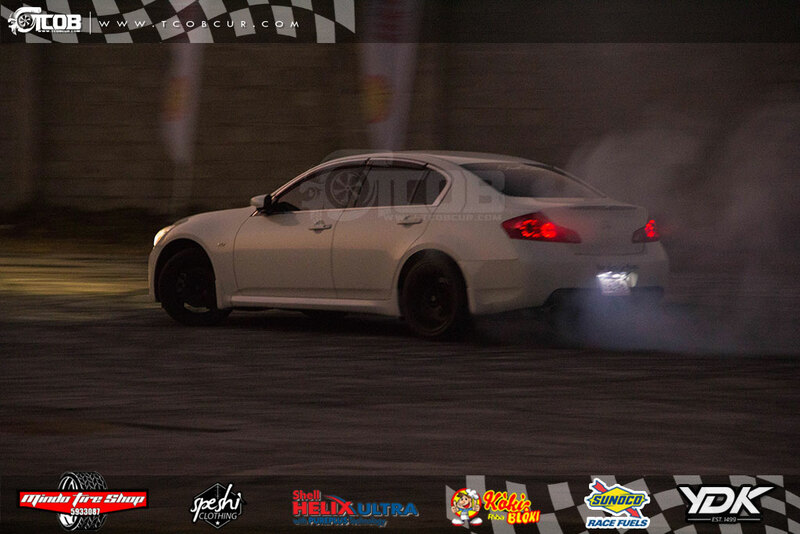 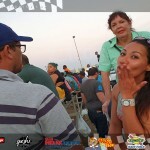 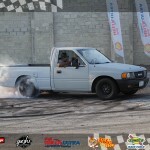 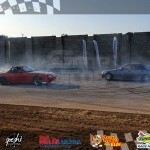 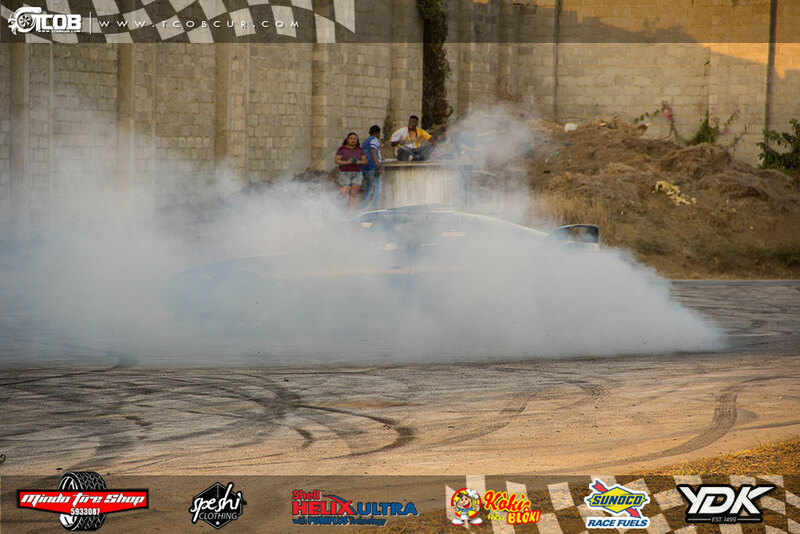 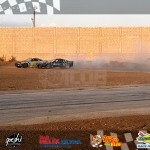 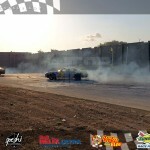 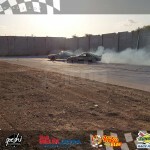 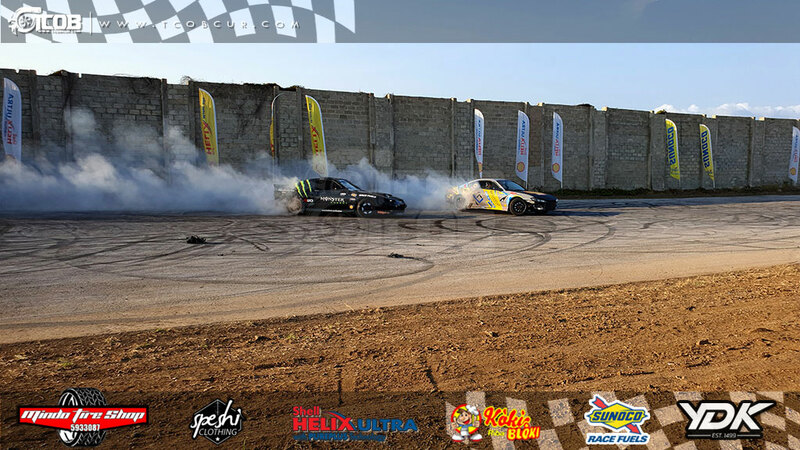 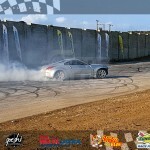 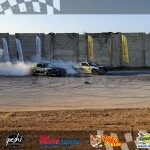 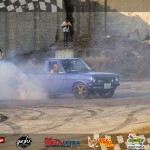 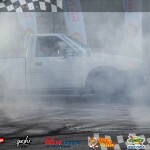 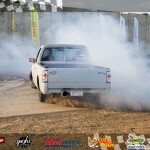 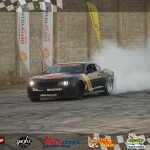 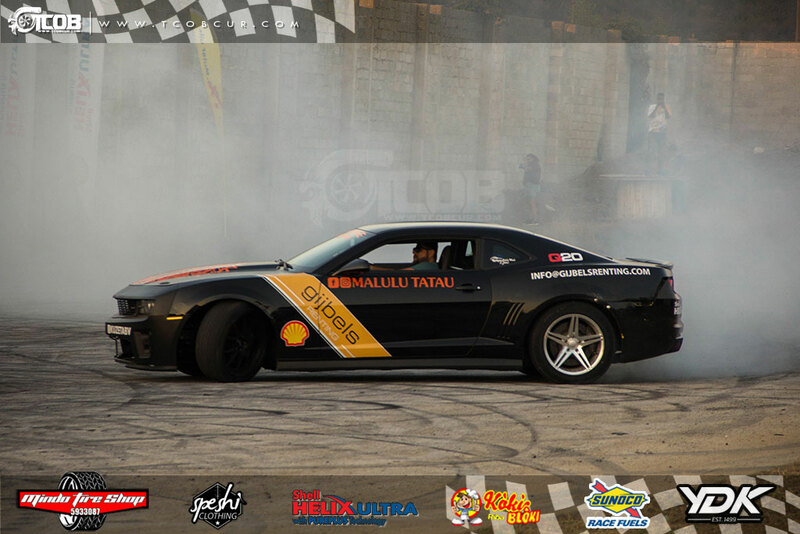 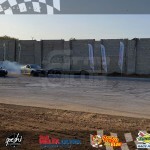 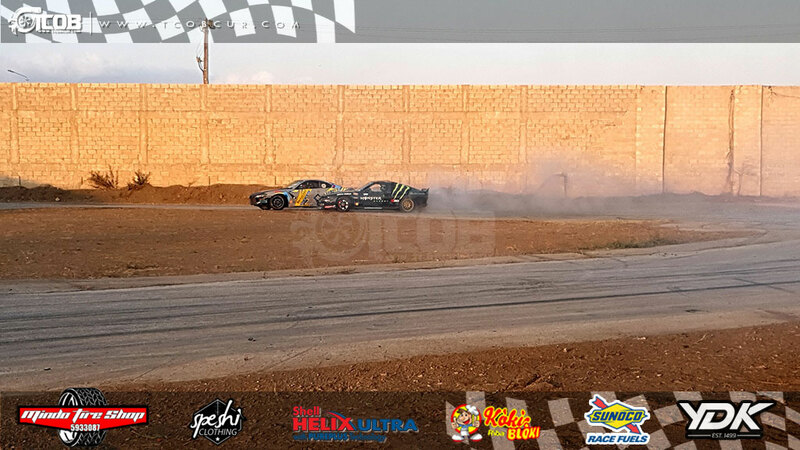 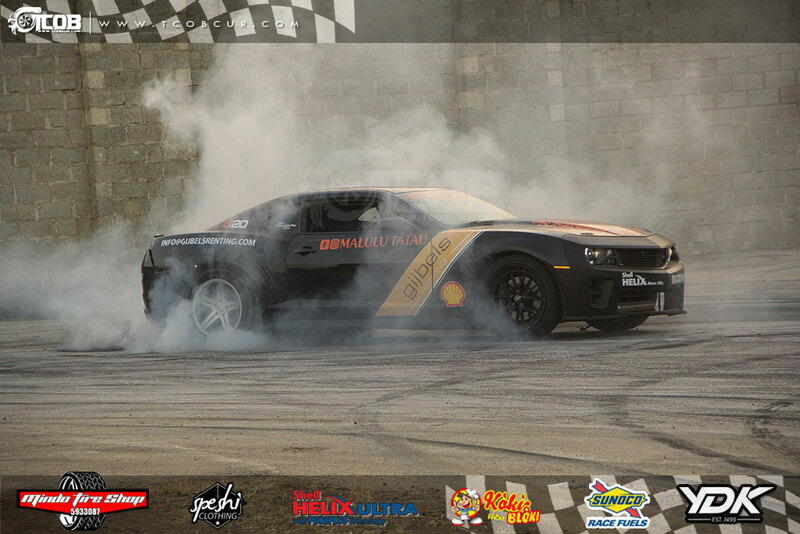 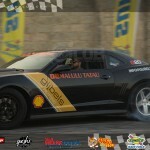 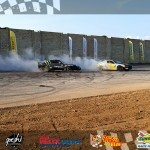 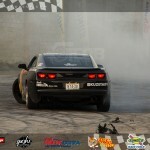 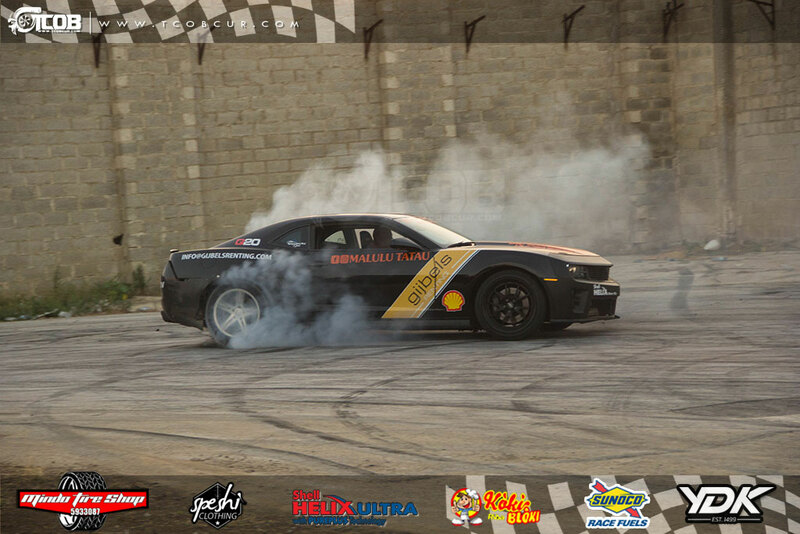 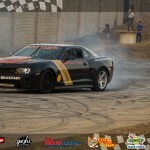 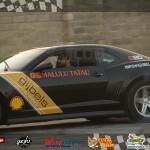 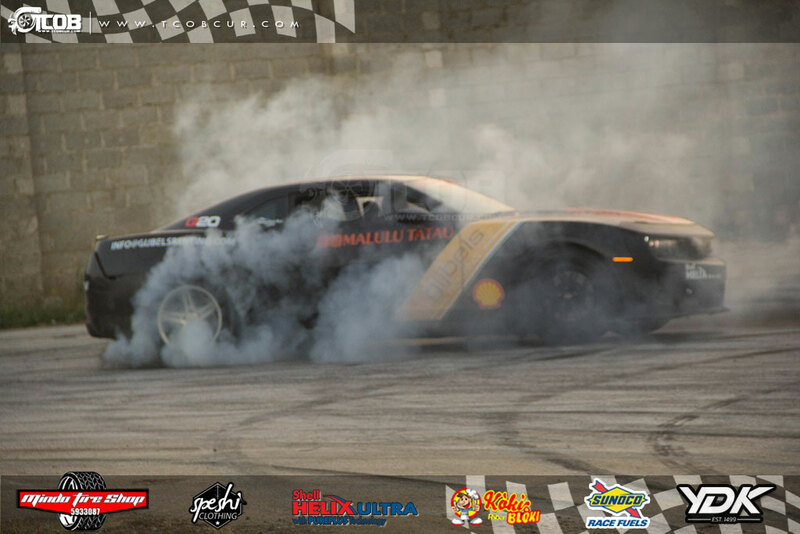 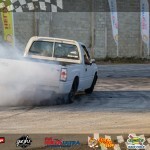 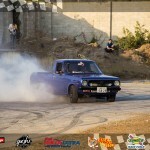 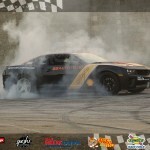 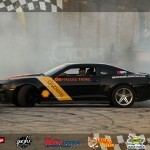 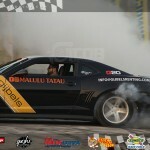 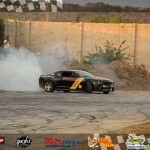 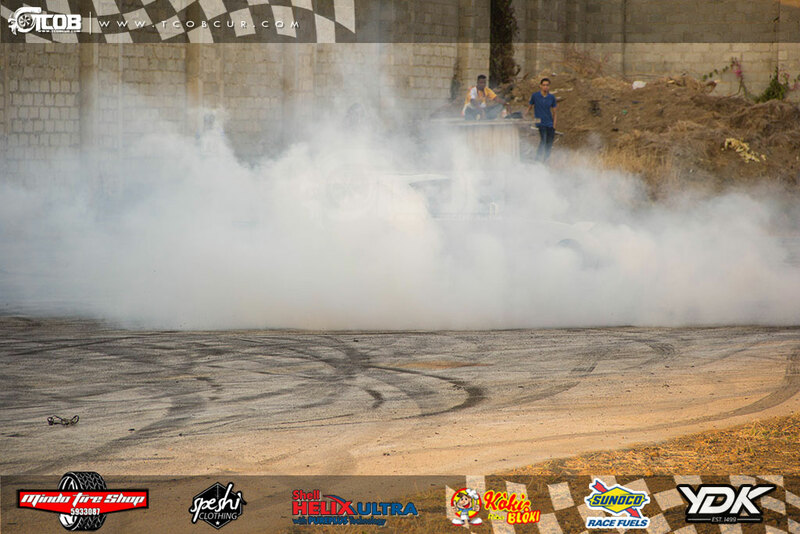 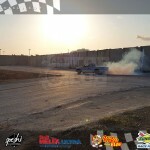 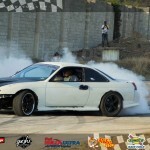 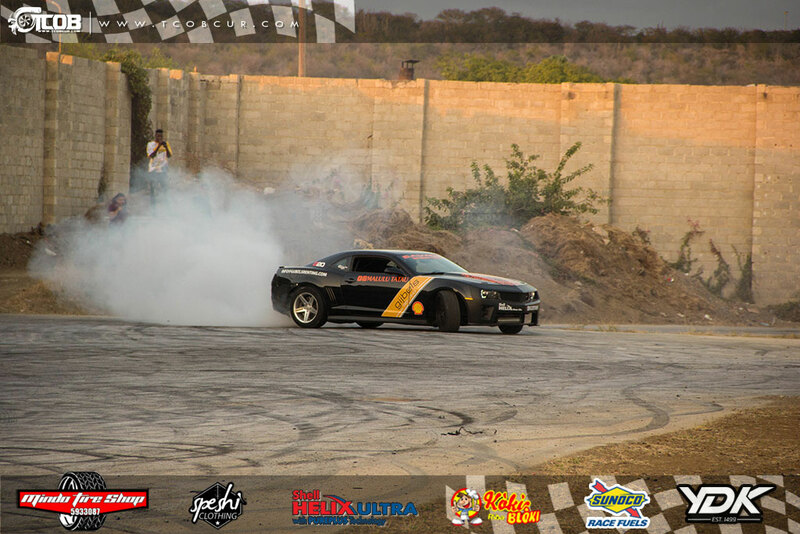 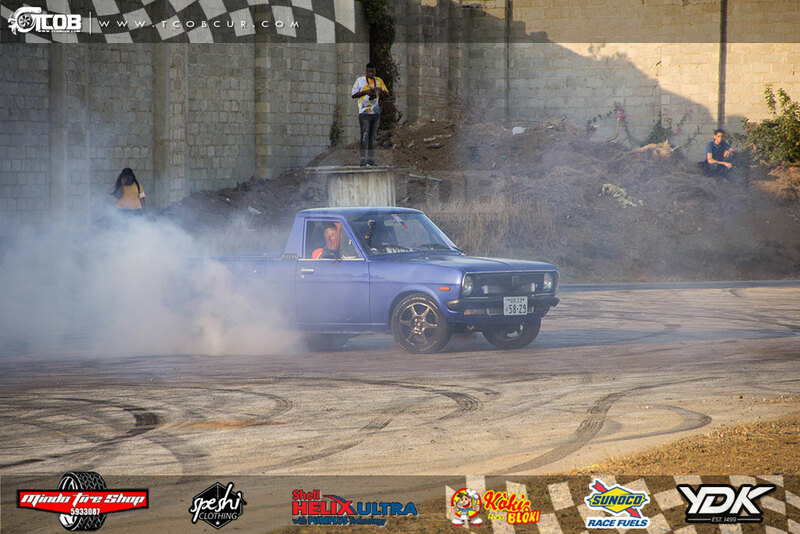 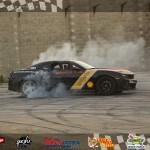 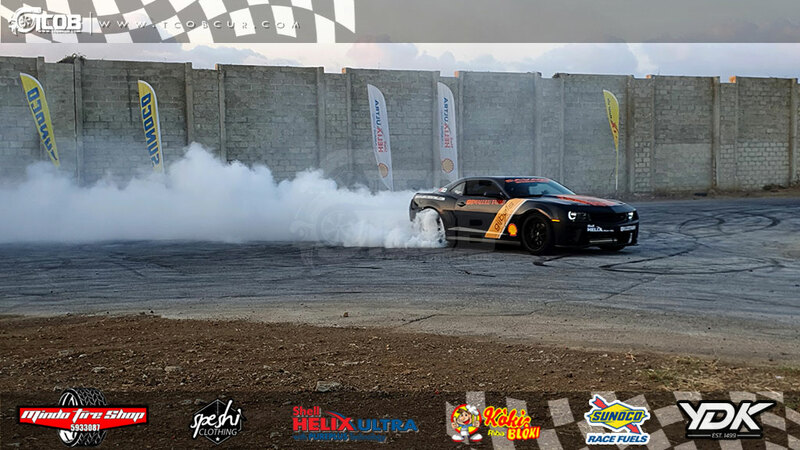 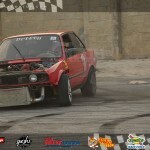 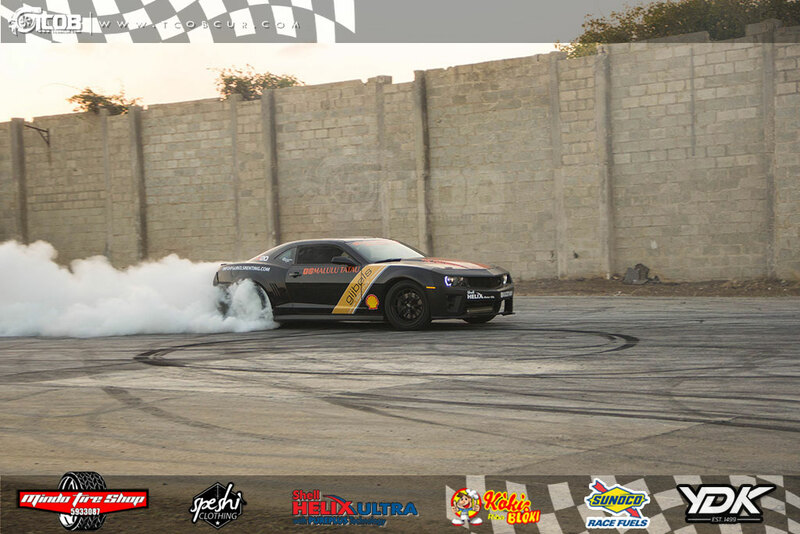 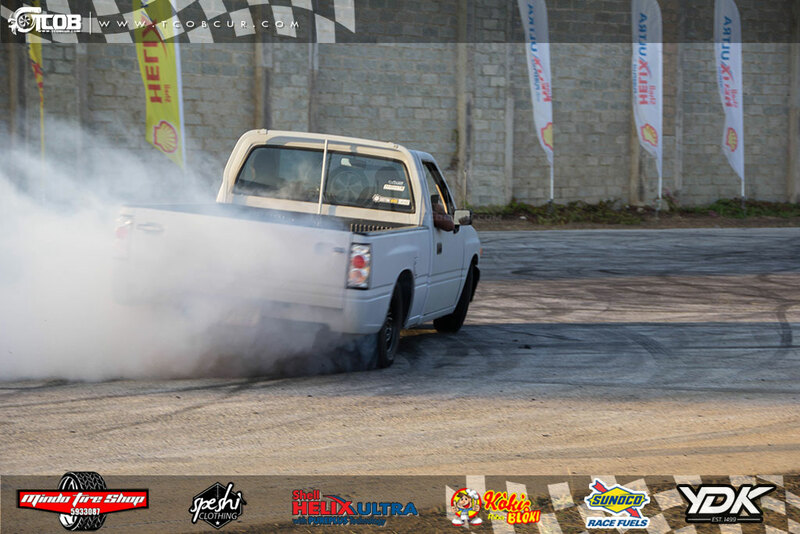 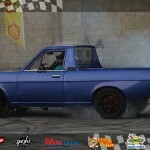 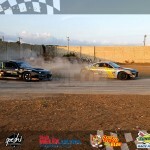 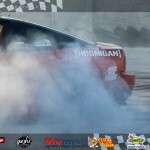 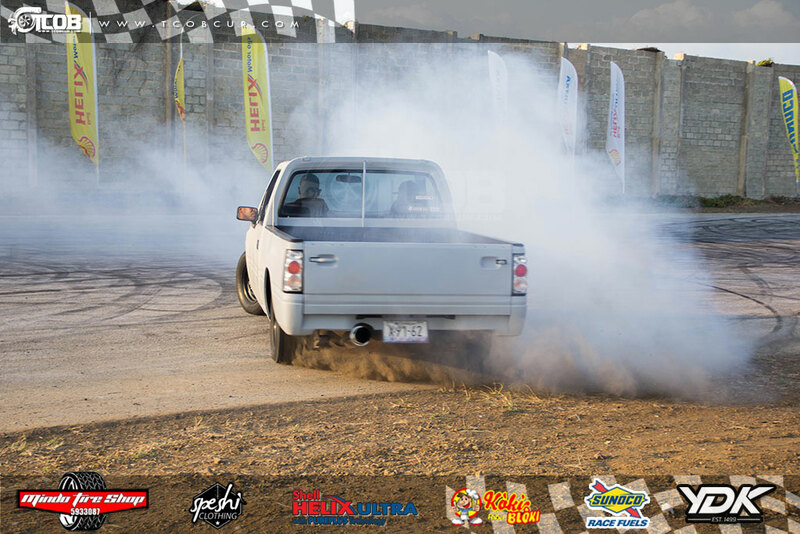 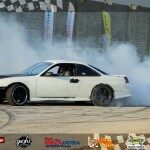 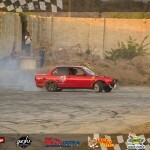 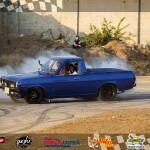 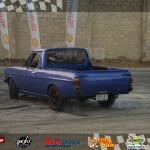 It was a loud, smoke filled chaotic HOON to close out the event, with Gabi catching fire in the end. Next event will be 28th of April 2019.